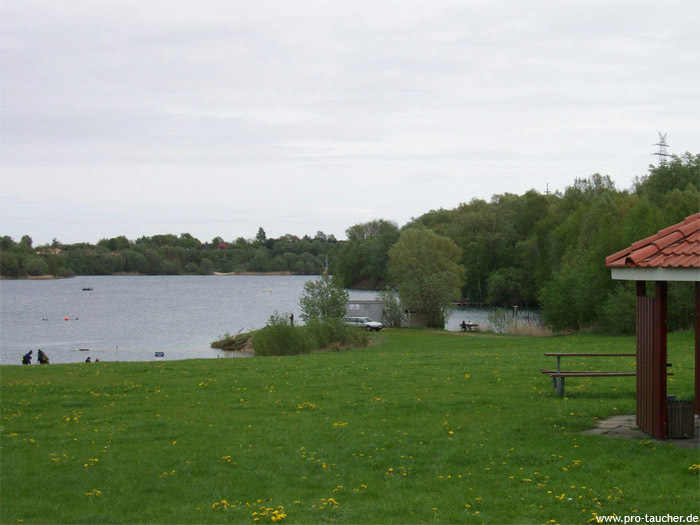 The freshwater lake in the north of Germany! 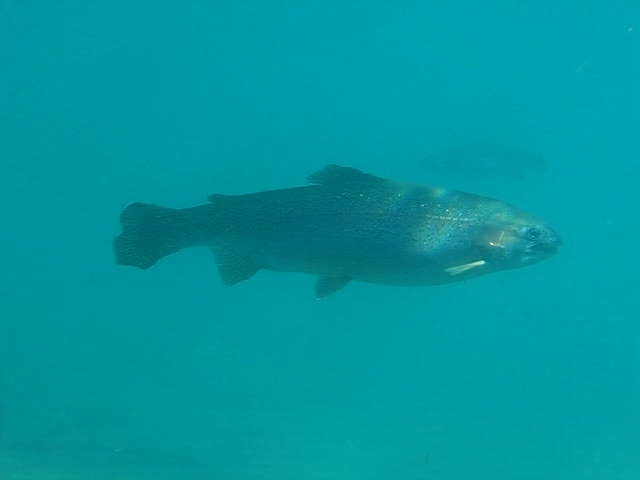 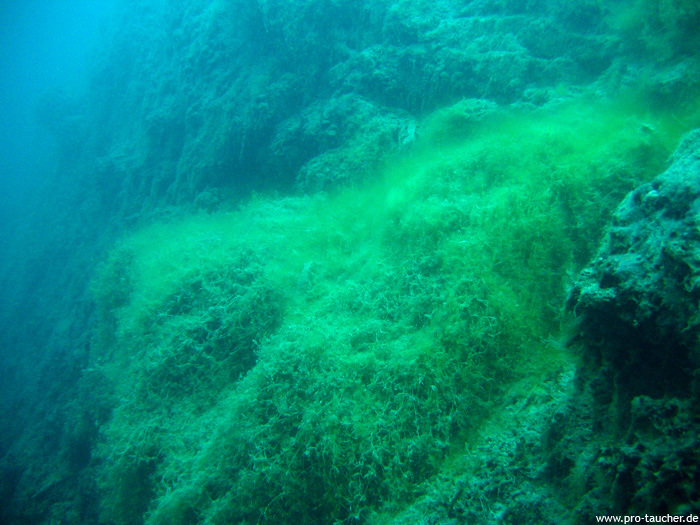 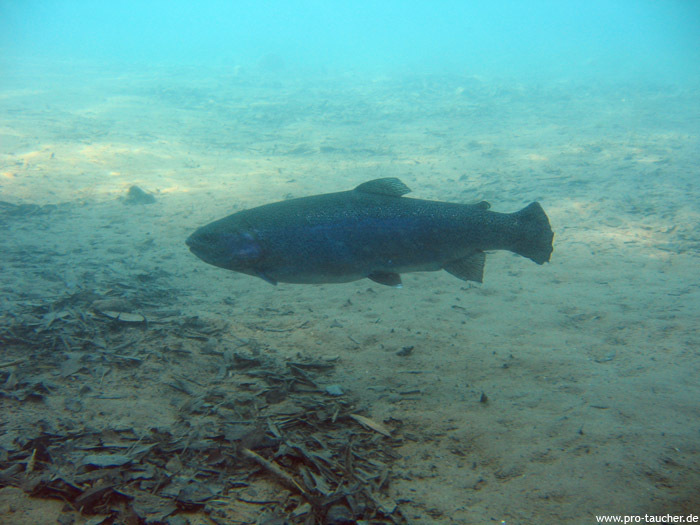 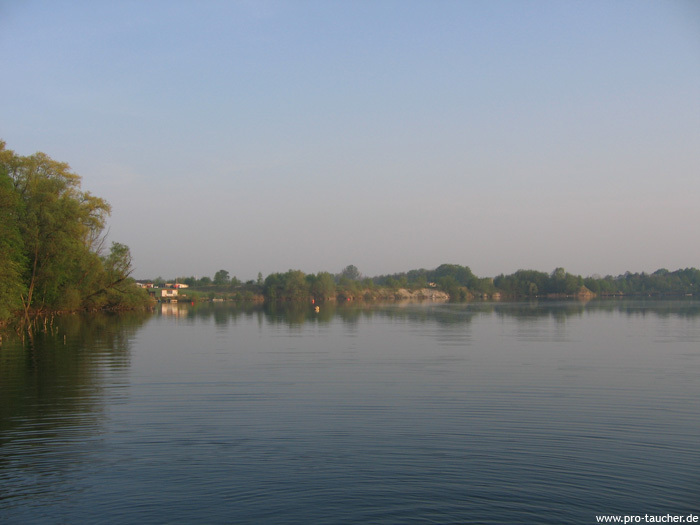 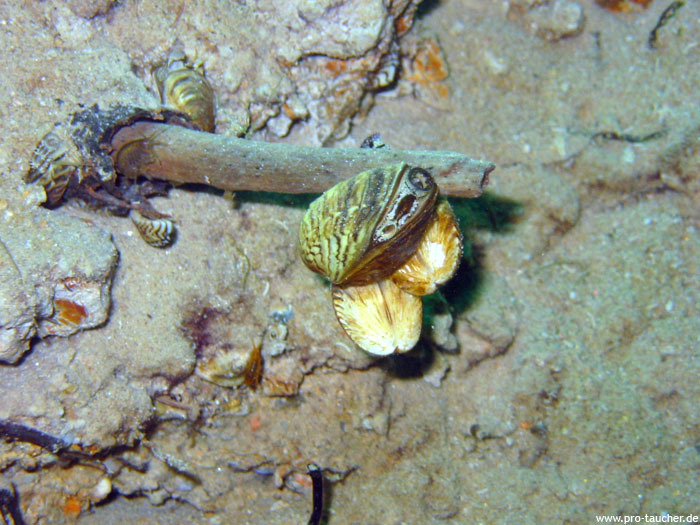 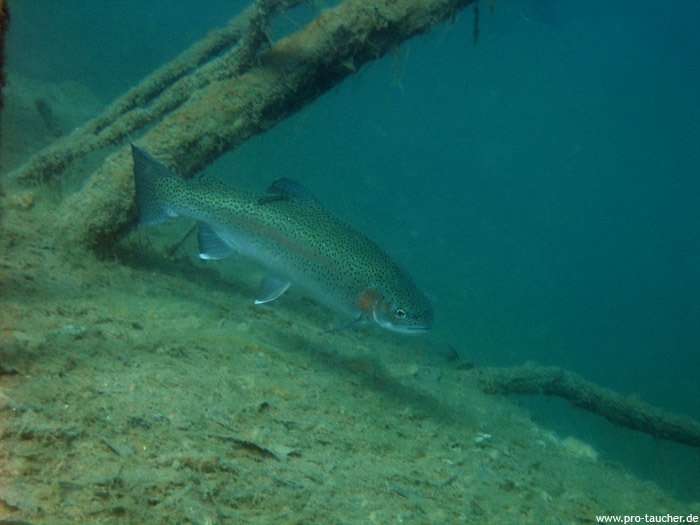 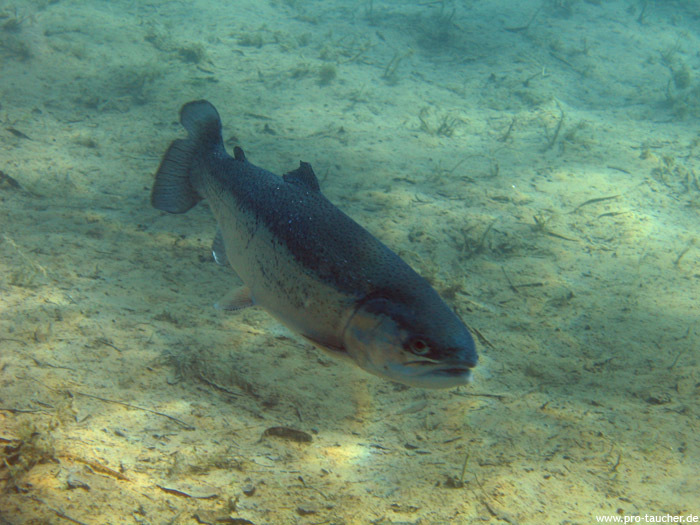 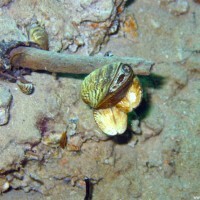 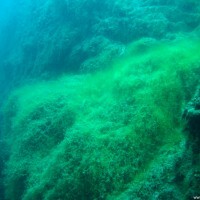 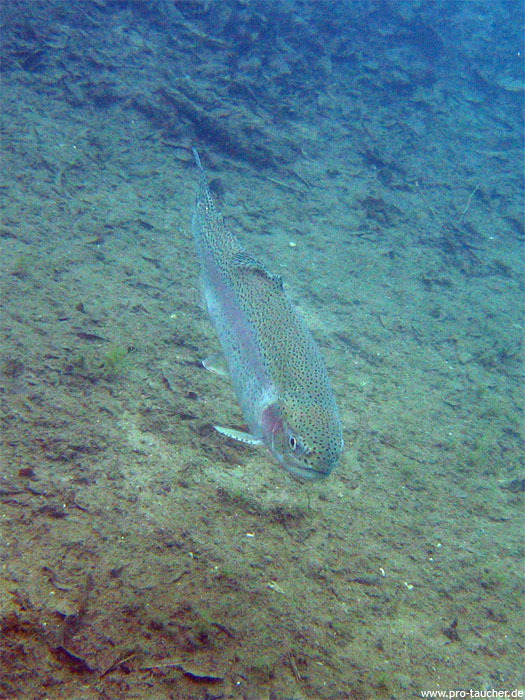 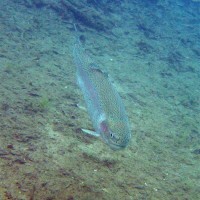 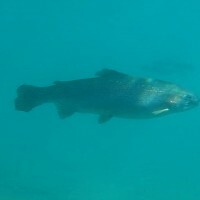 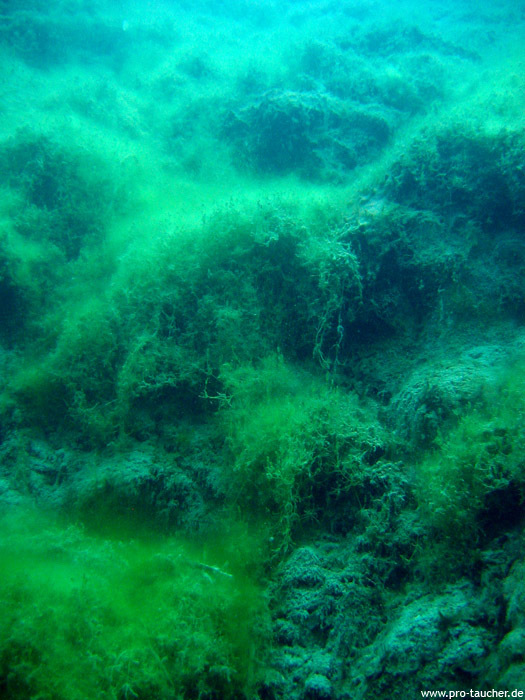 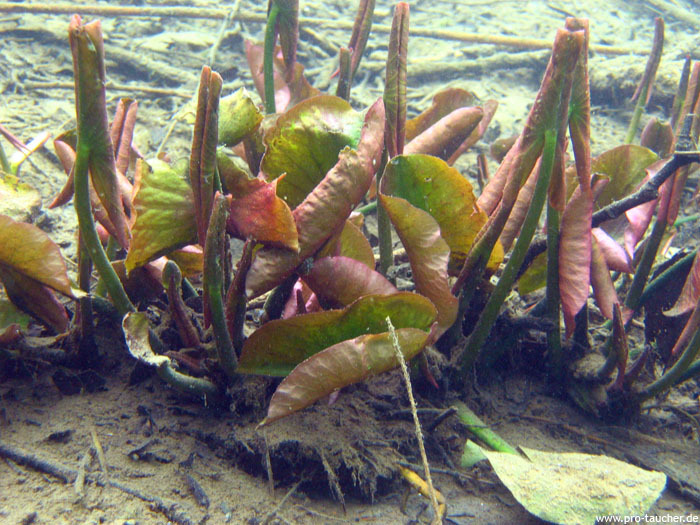 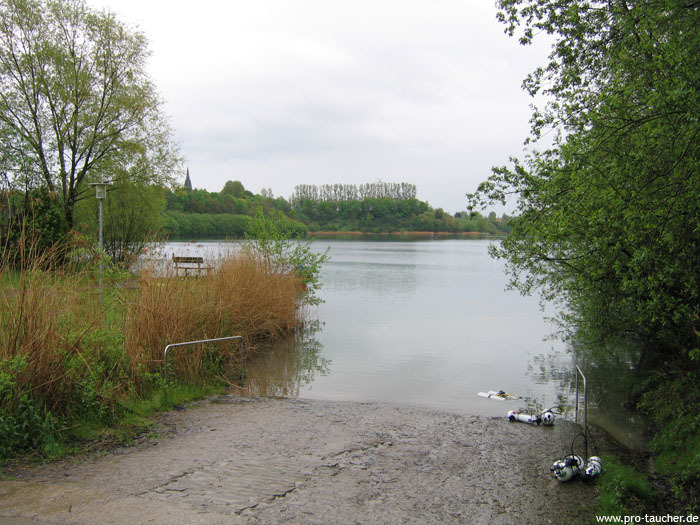 The Kreidesee impresses with its diversity and its often very good view. 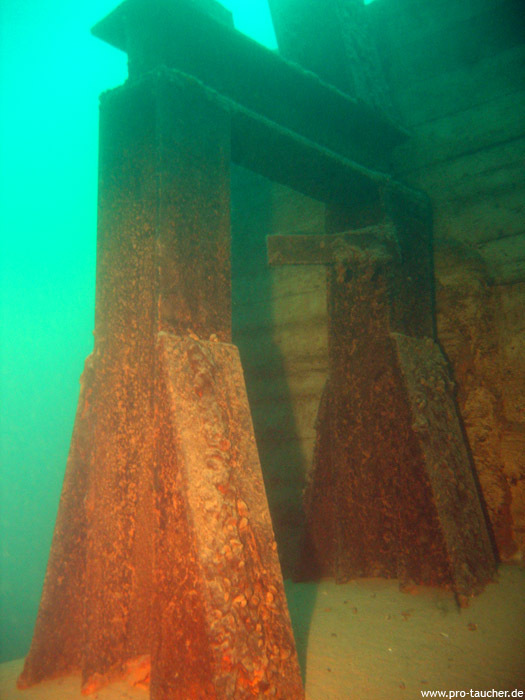 About all kinds of flora and fauna, like a sunken forest, to the remains of the old conveyors for chalkstone such as the "Rüttler" (the word means something like "shaker" and the structure looks a bit like a gigantic funnel), a road, conveyor belts, stairs and pipes and all sorts of subsequently sunk objects such as cars, caravans and a boat, there is everything here. 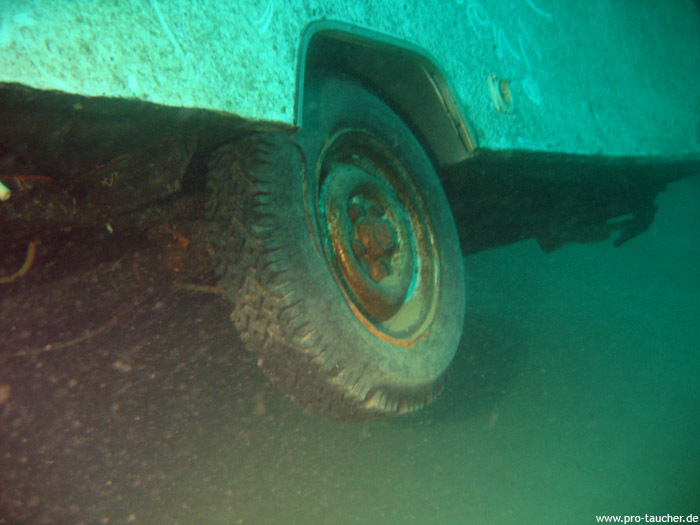 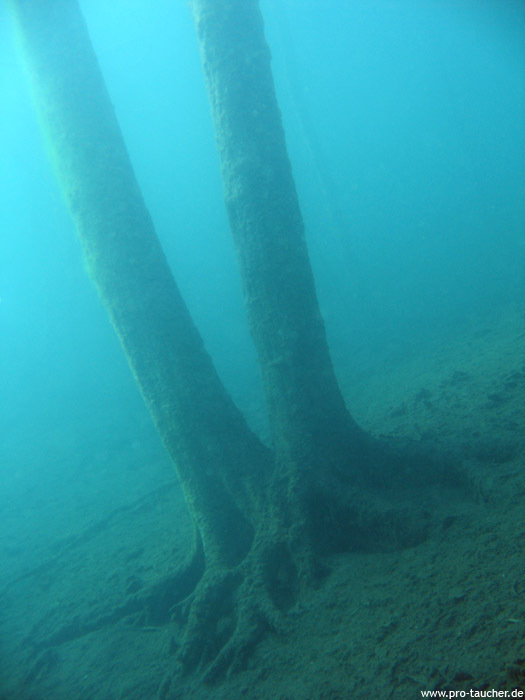 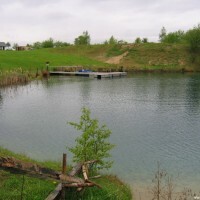 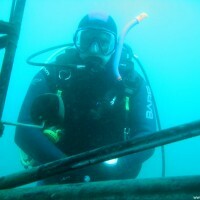 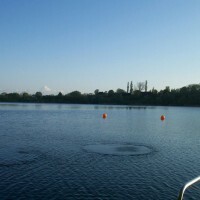 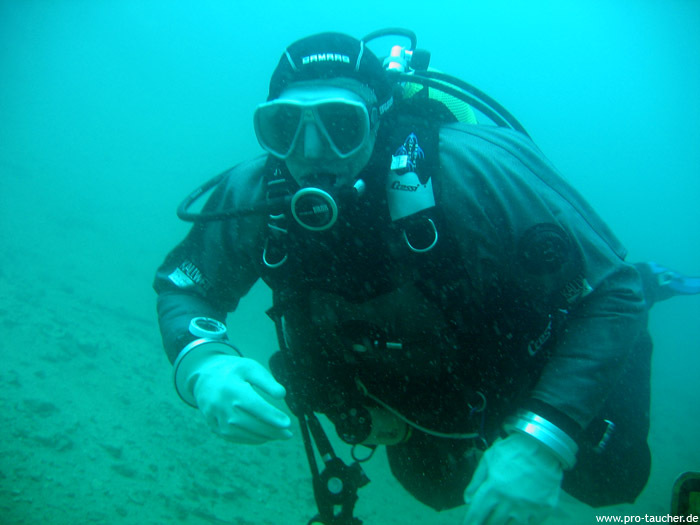 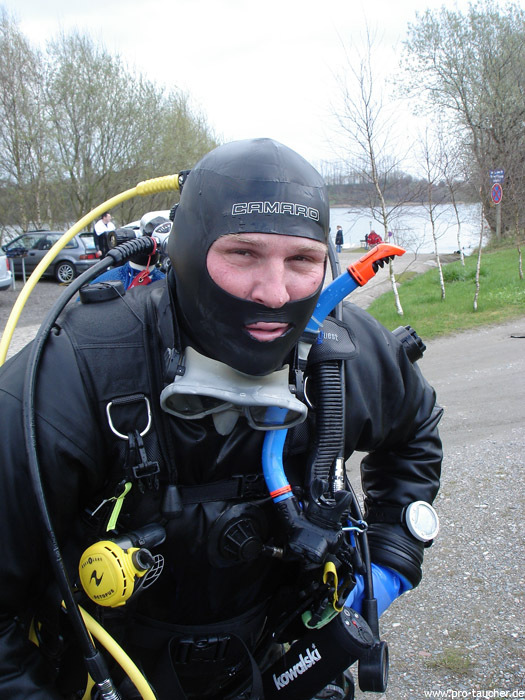 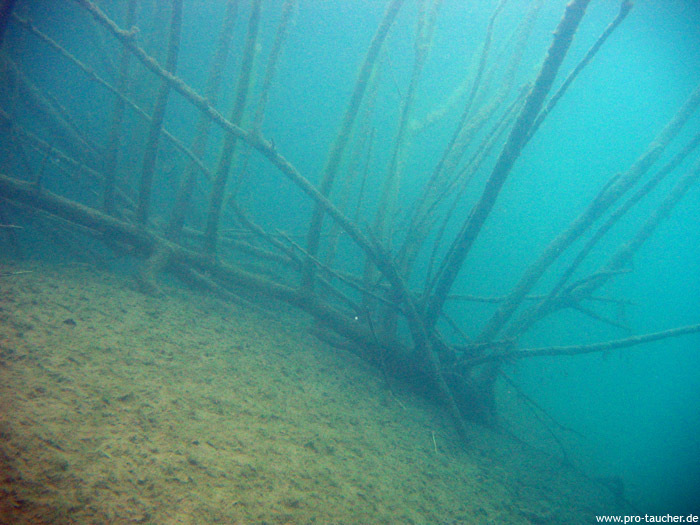 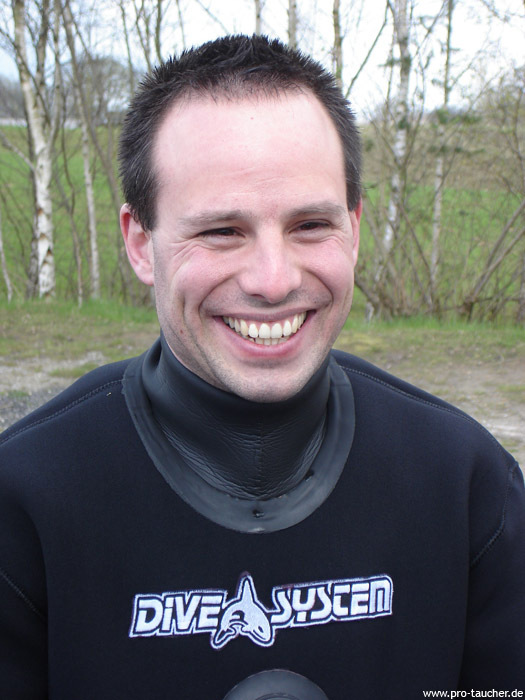 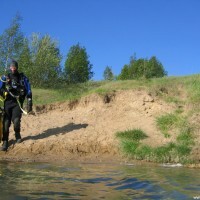 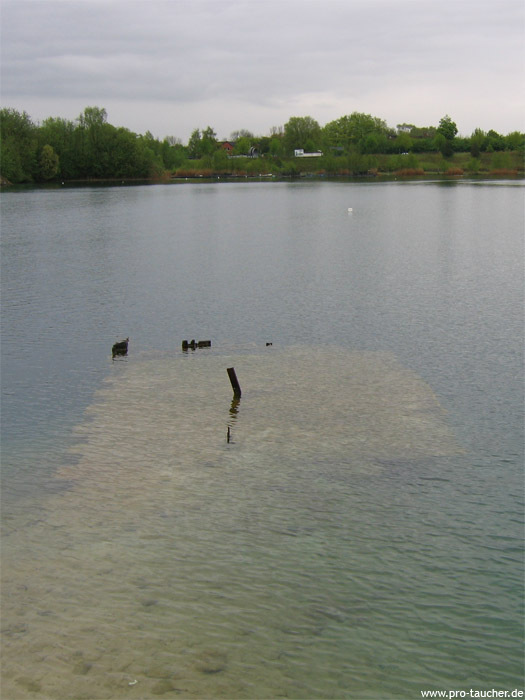 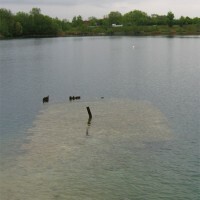 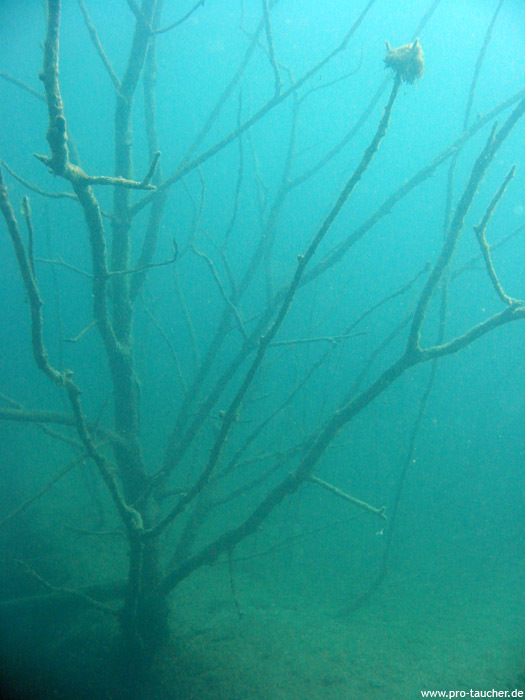 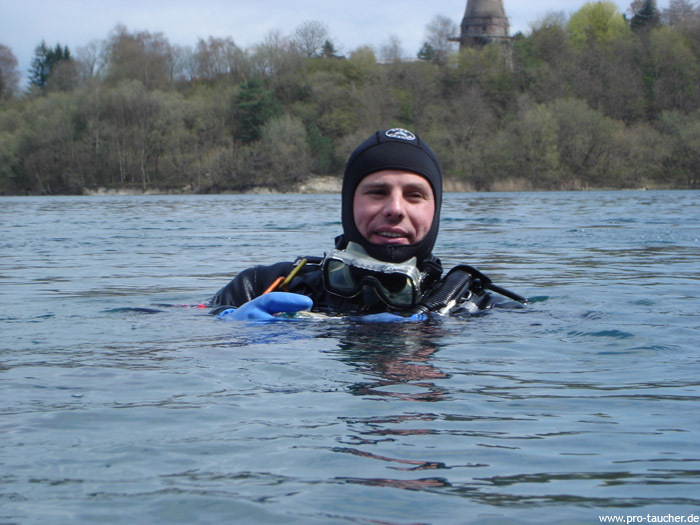 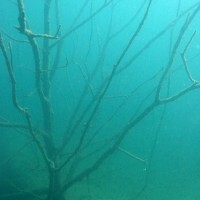 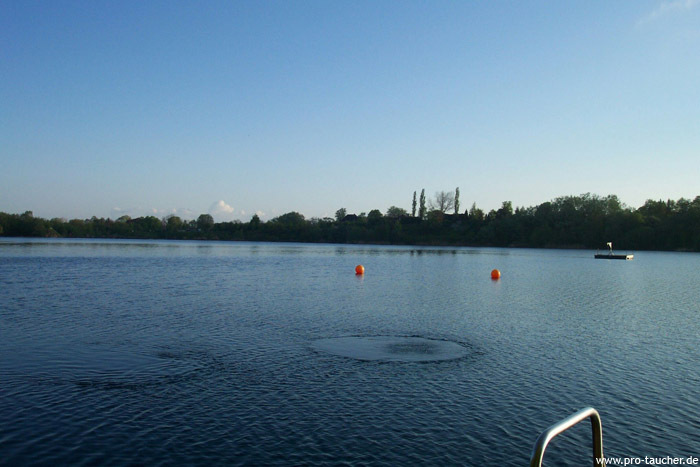 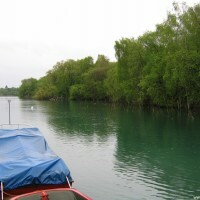 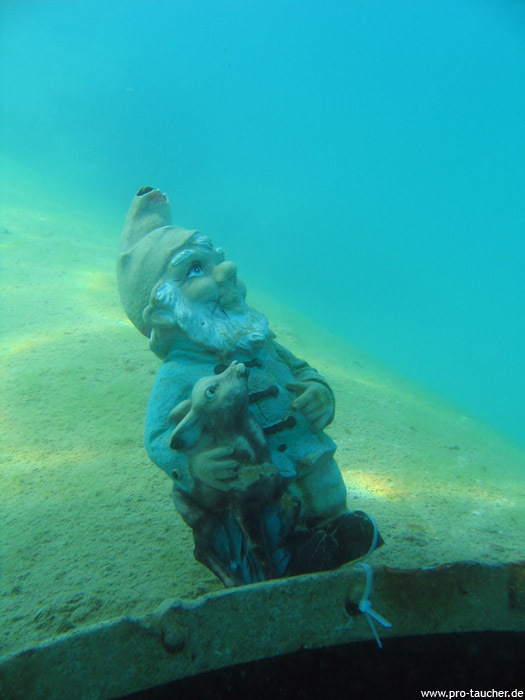 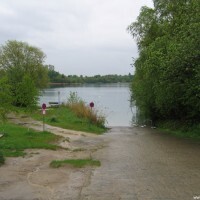 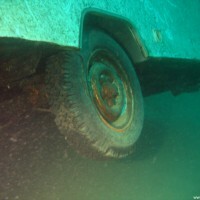 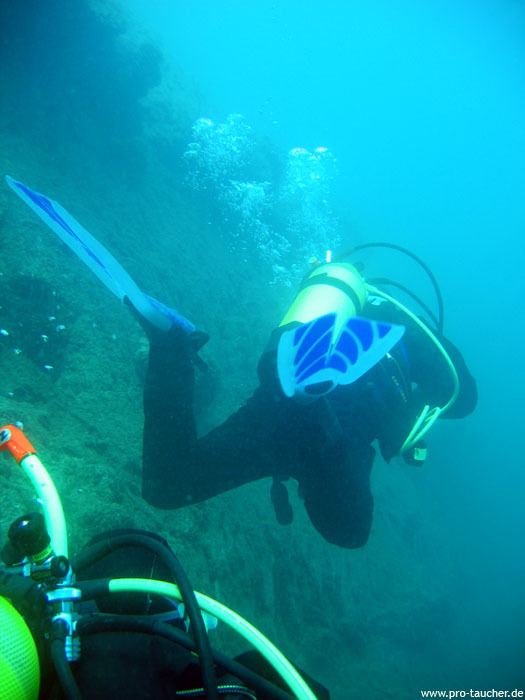 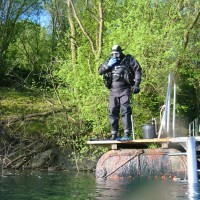 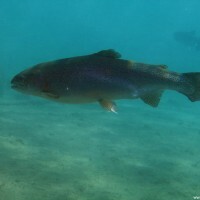 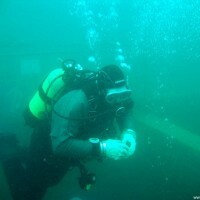 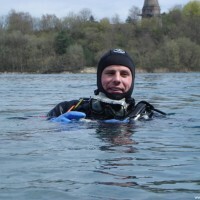 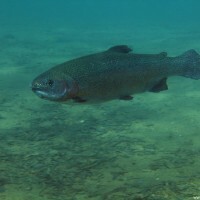 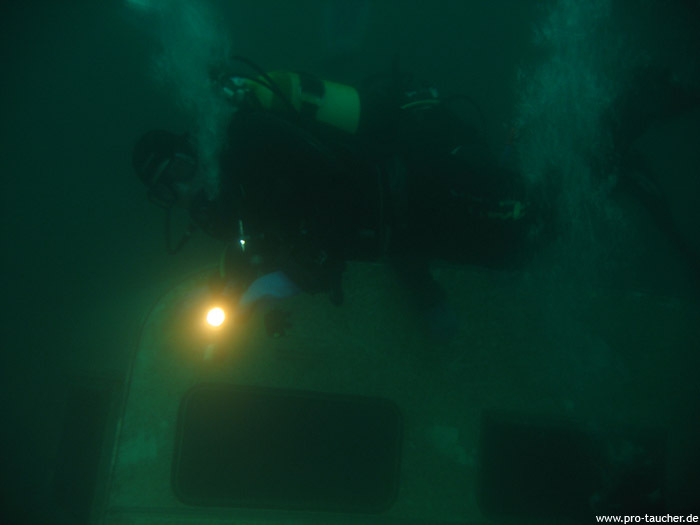 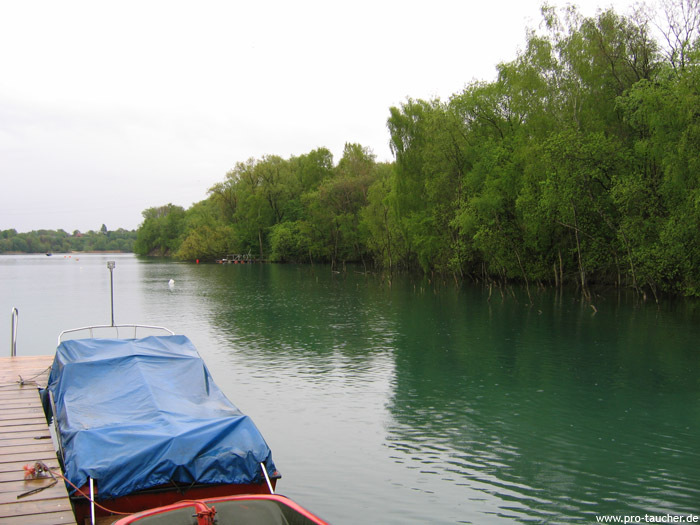 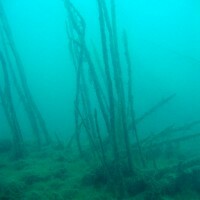 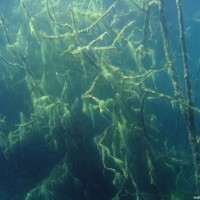 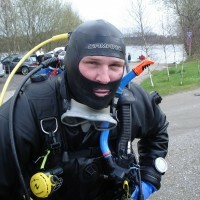 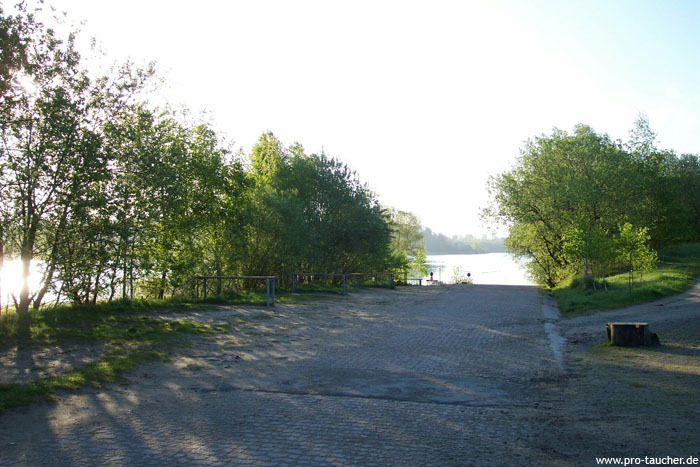 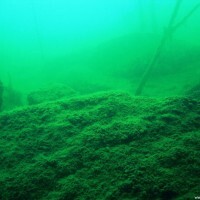 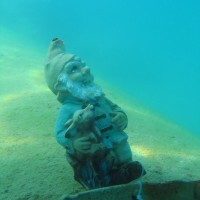 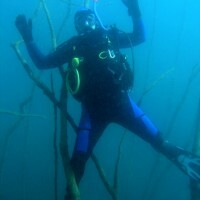 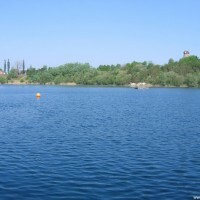 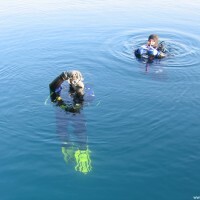 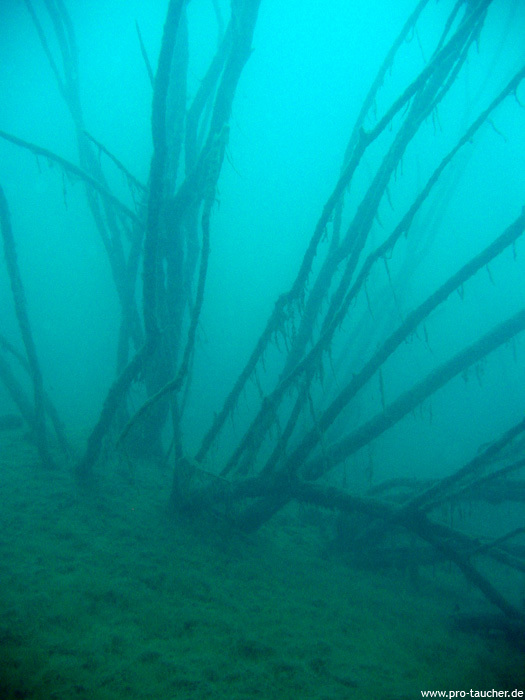 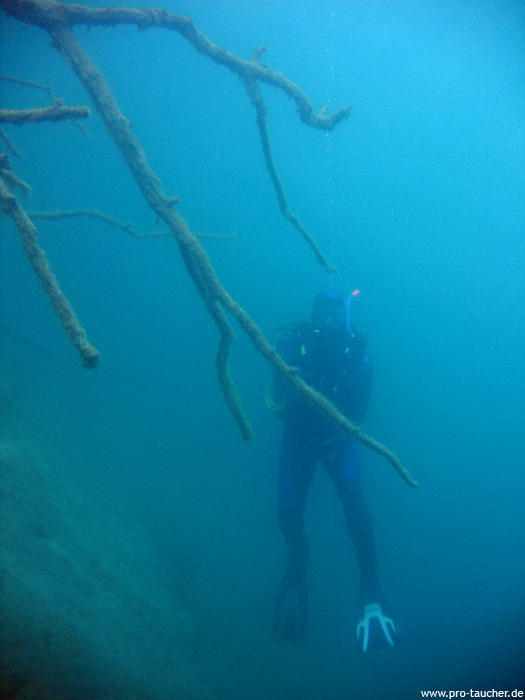 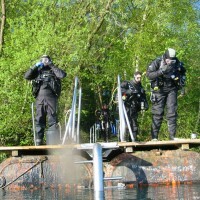 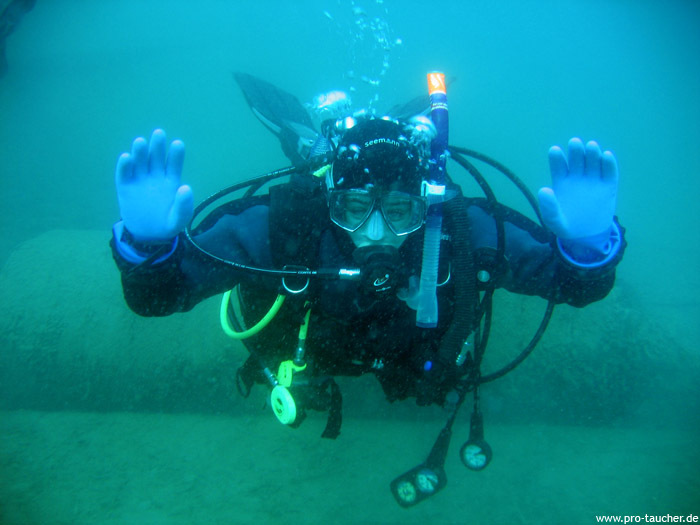 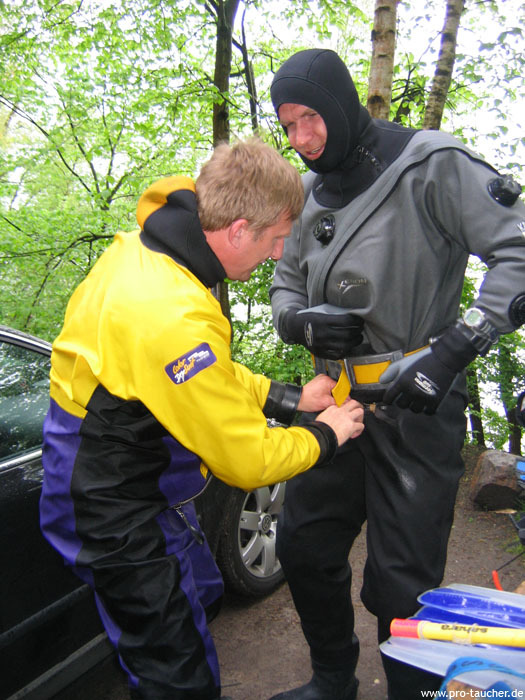 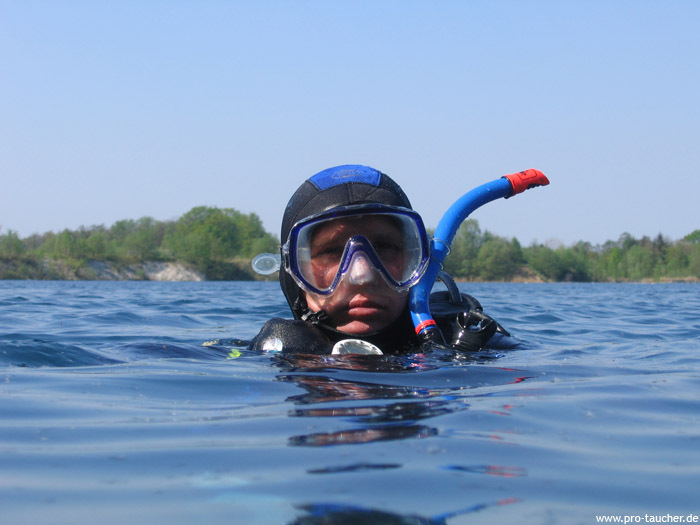 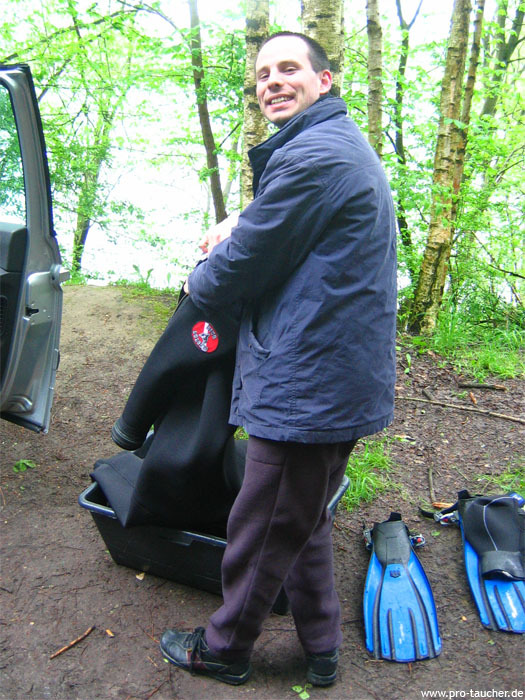 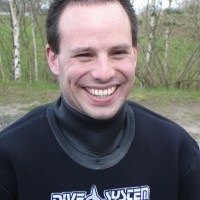 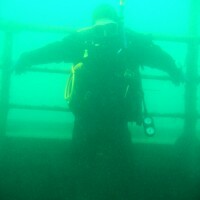 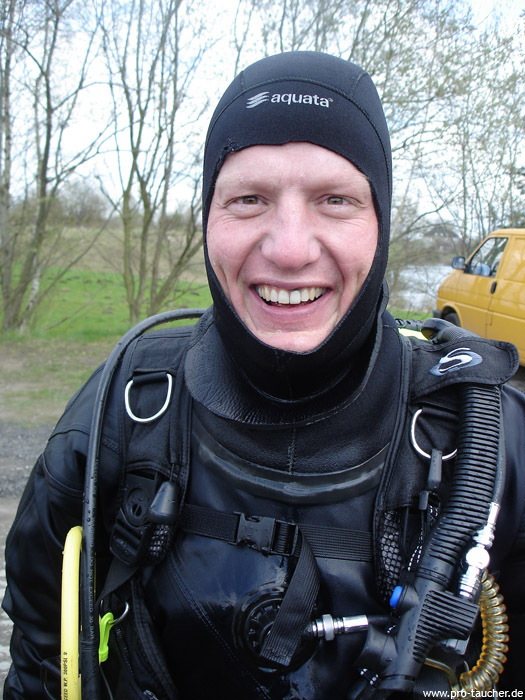 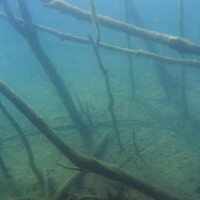 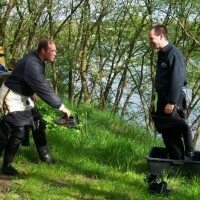 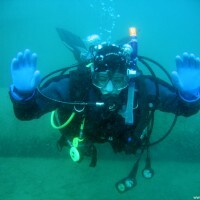 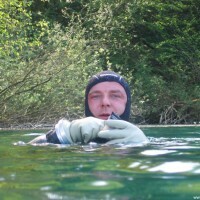 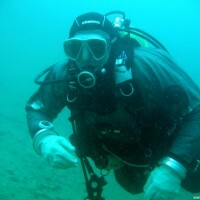 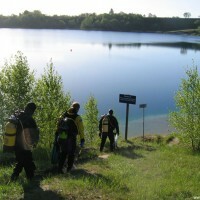 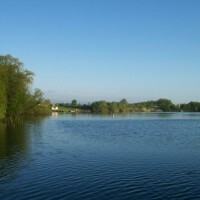 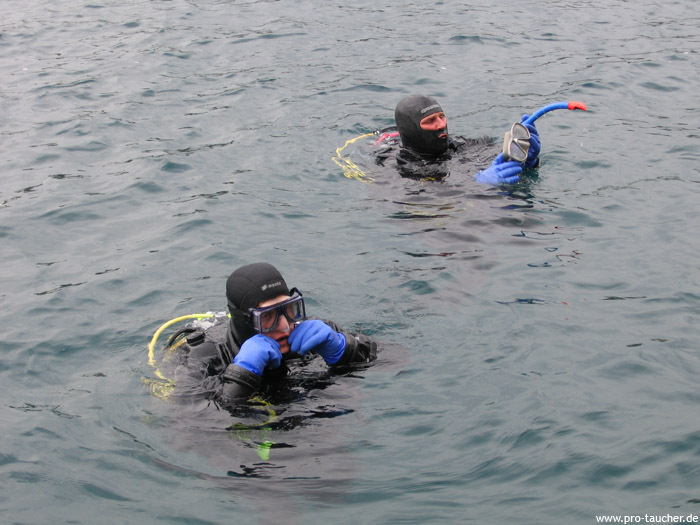 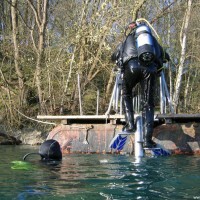 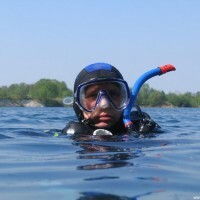 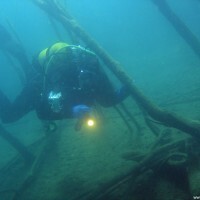 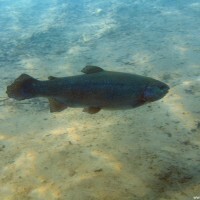 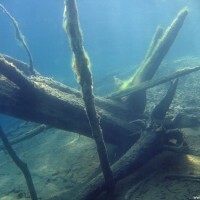 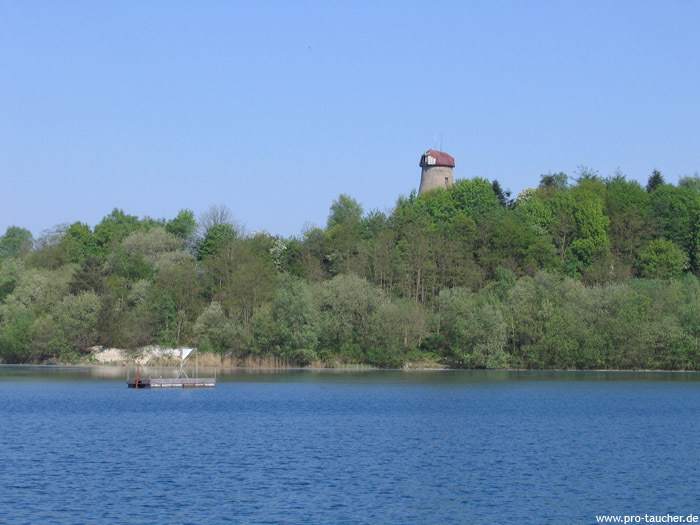 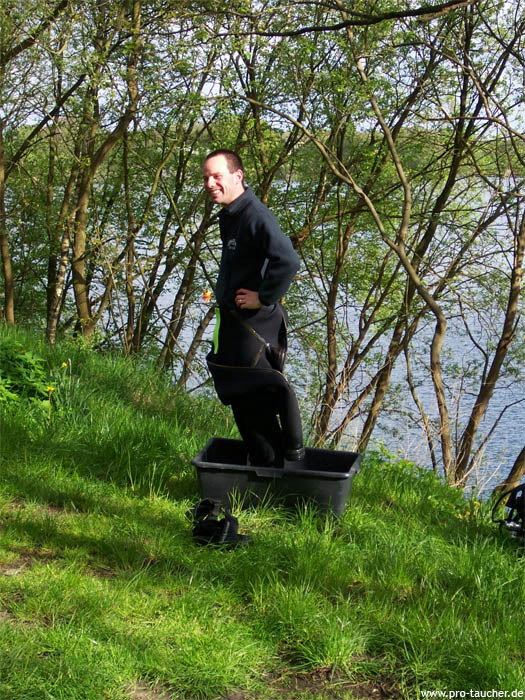 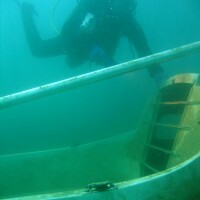 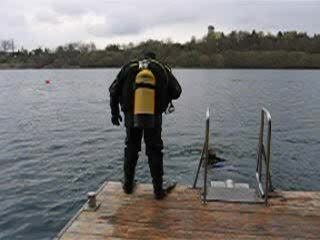 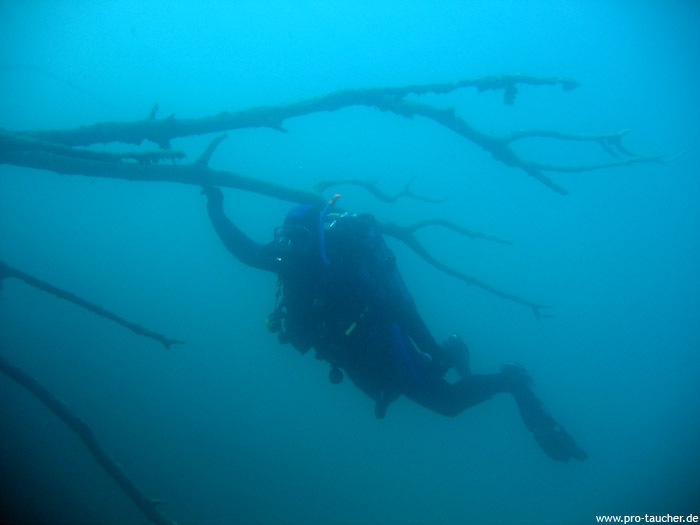 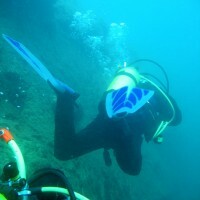 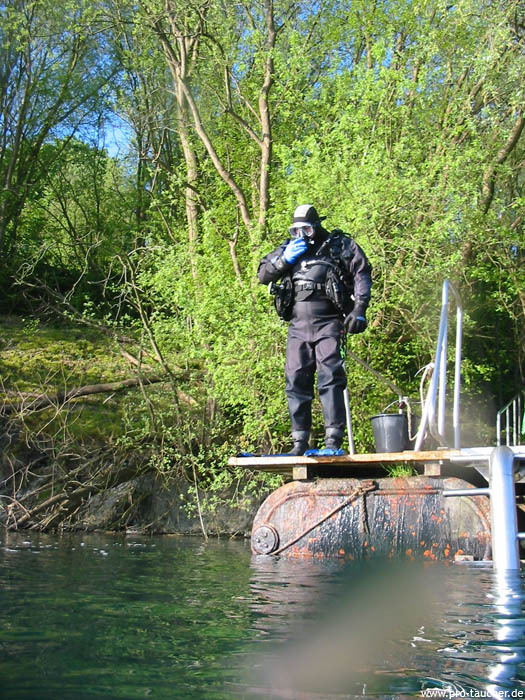 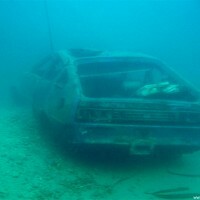 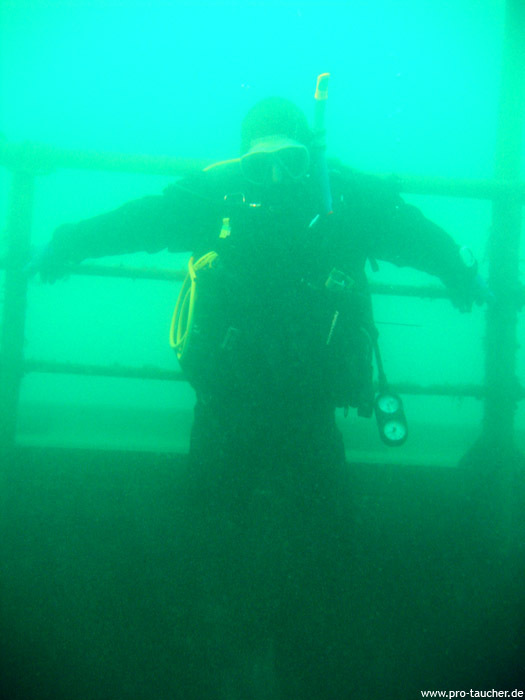 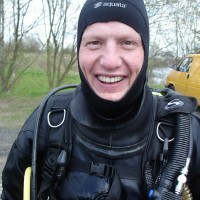 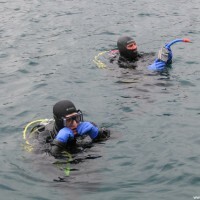 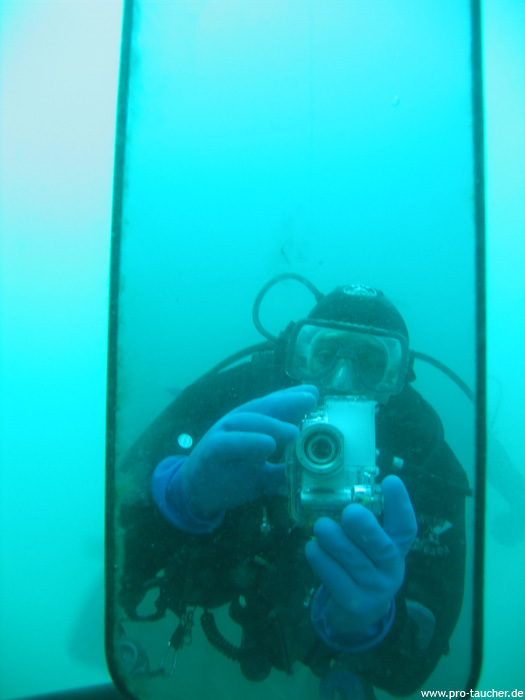 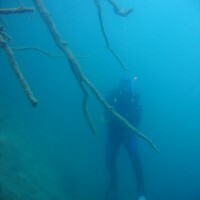 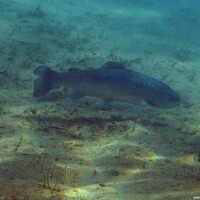 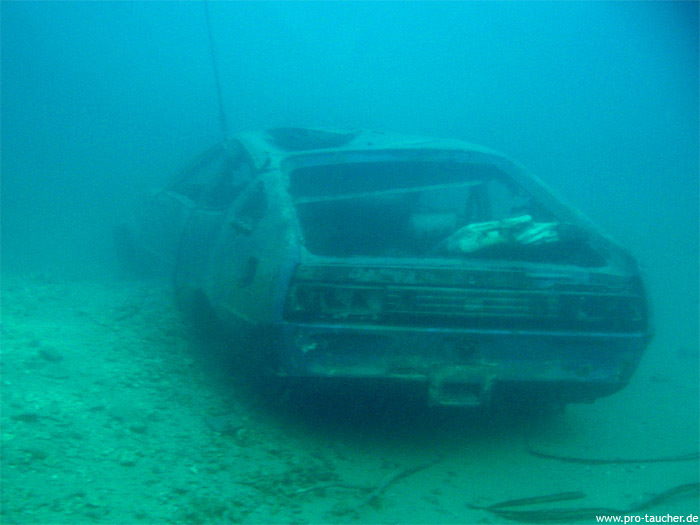 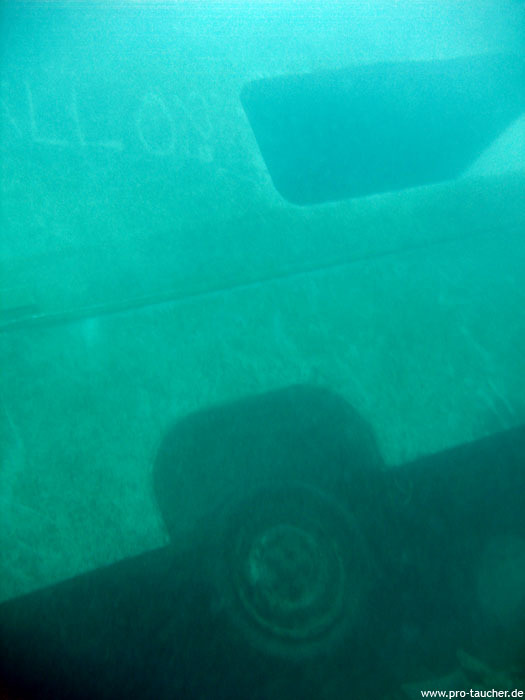 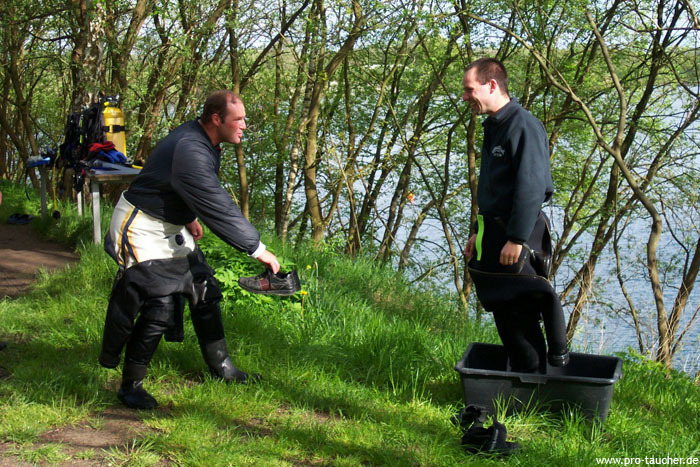 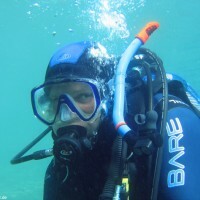 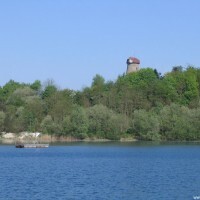 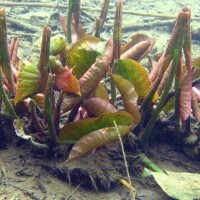 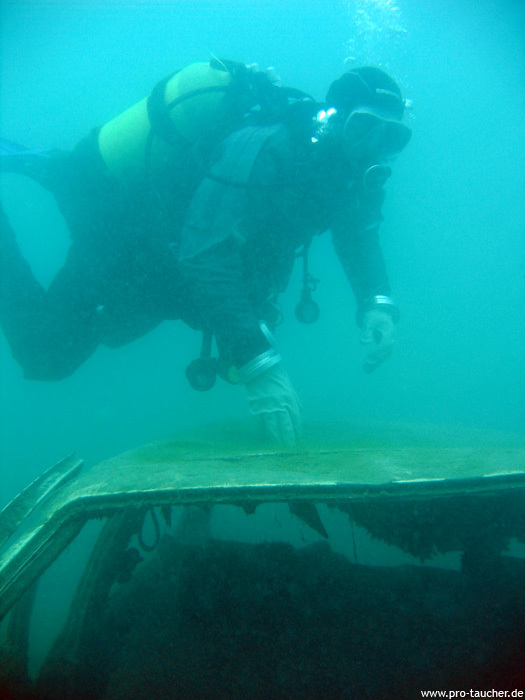 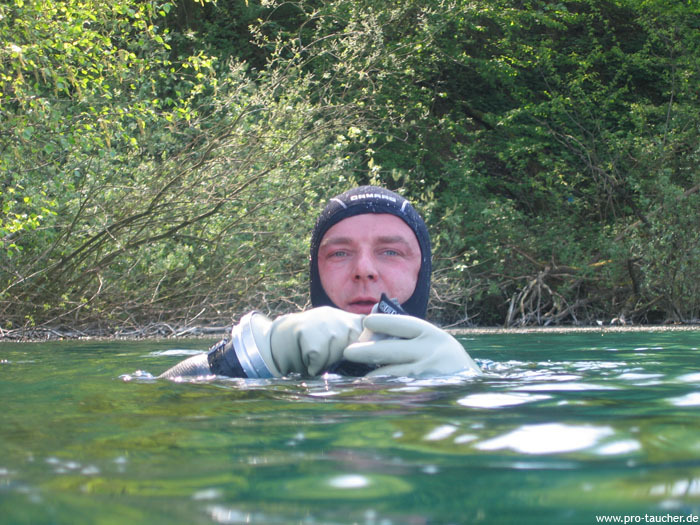 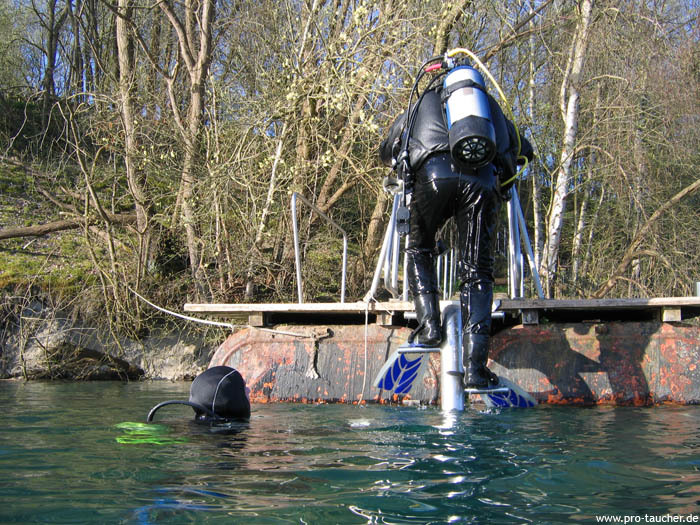 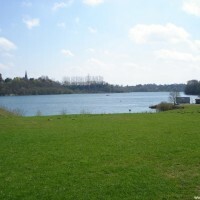 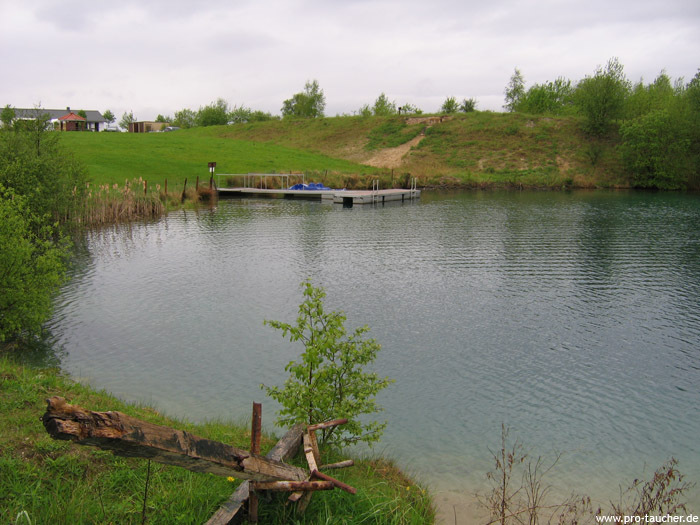 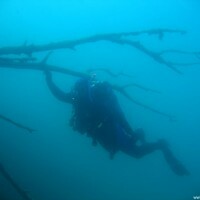 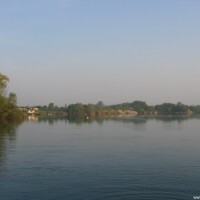 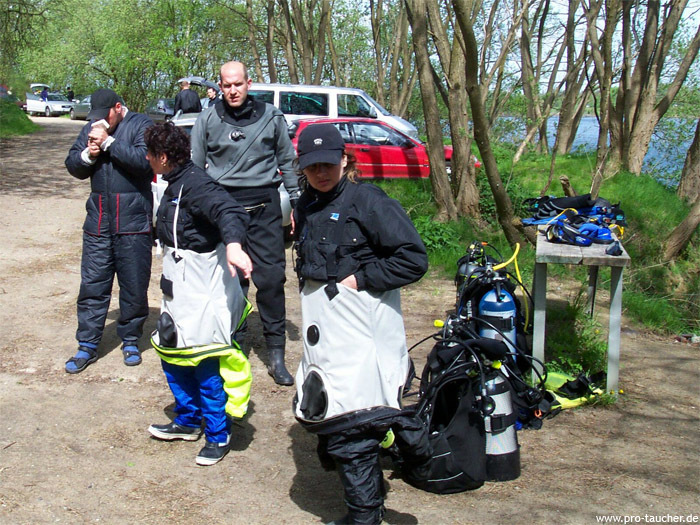 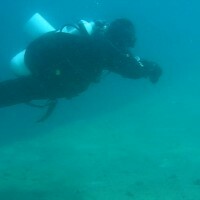 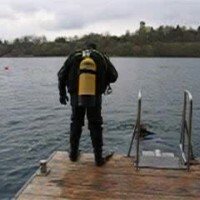 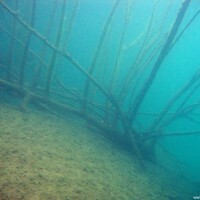 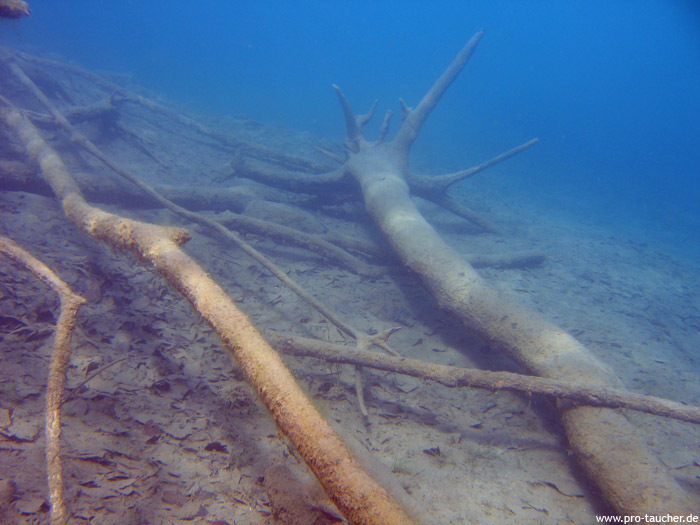 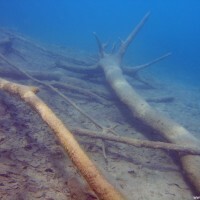 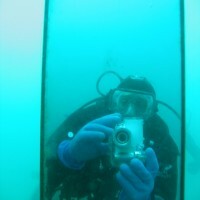 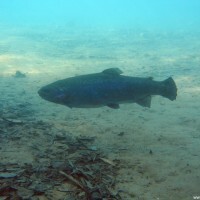 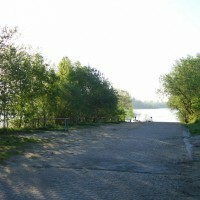 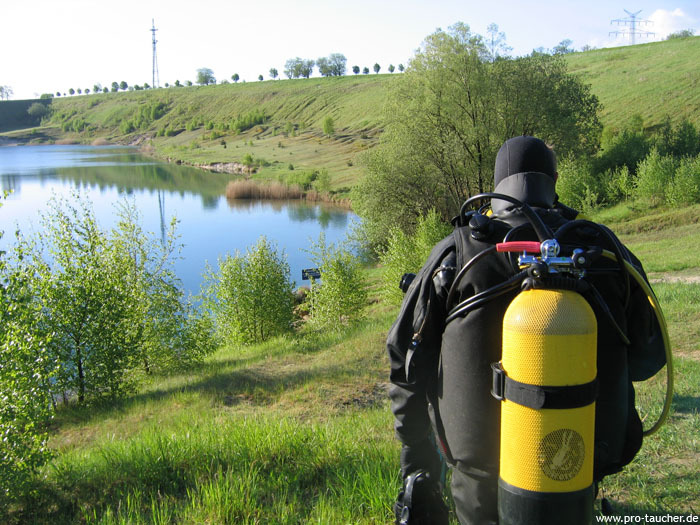 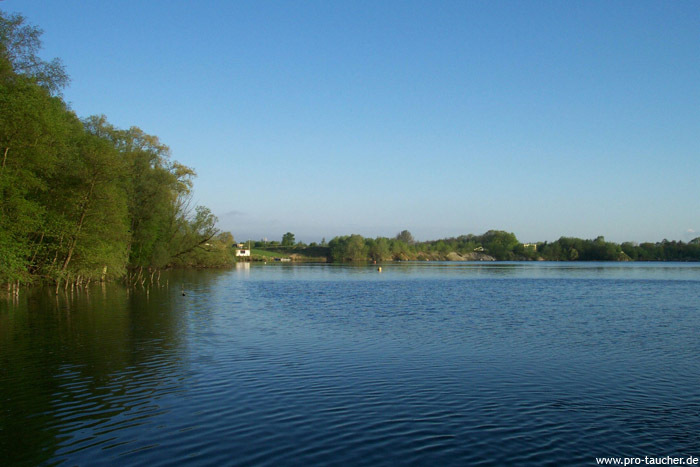 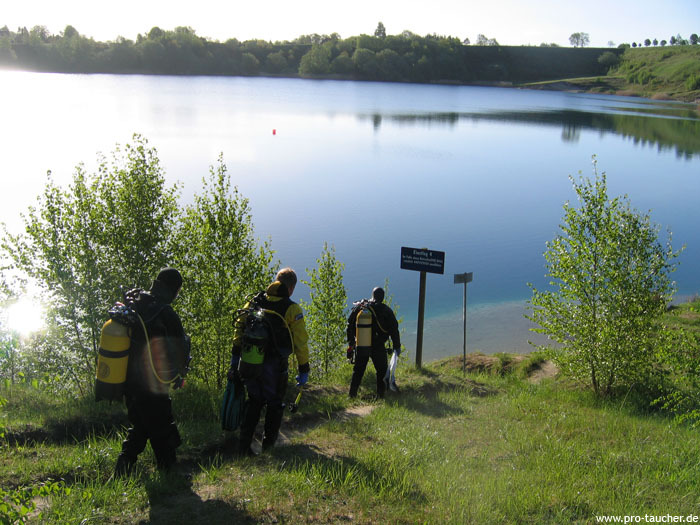 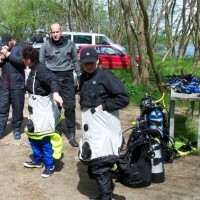 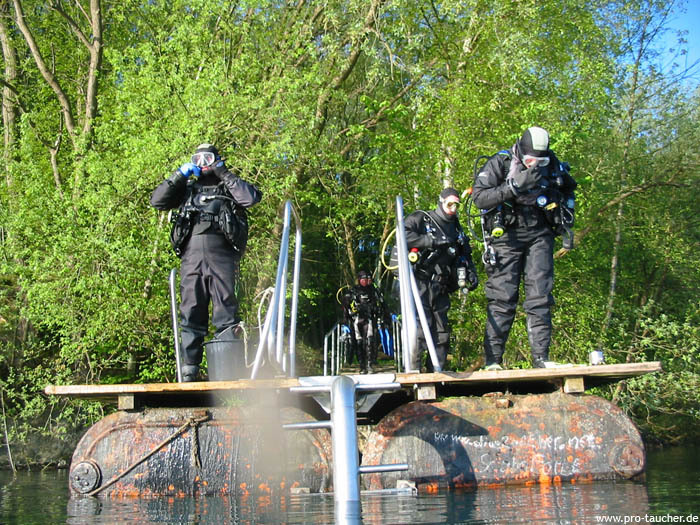 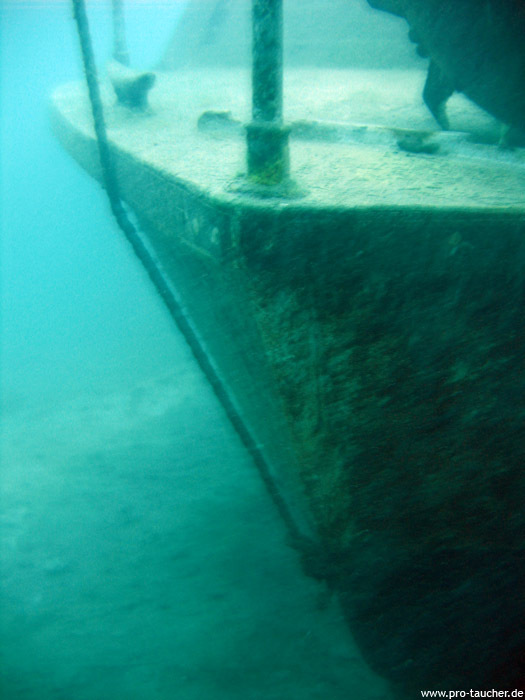 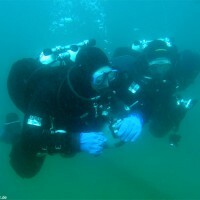 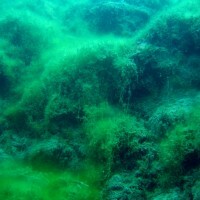 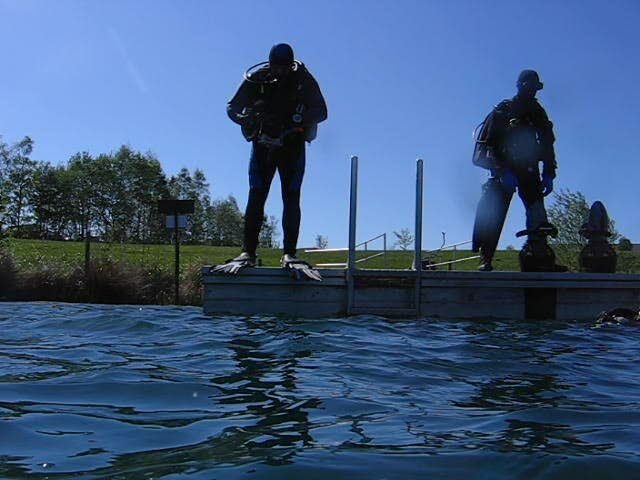 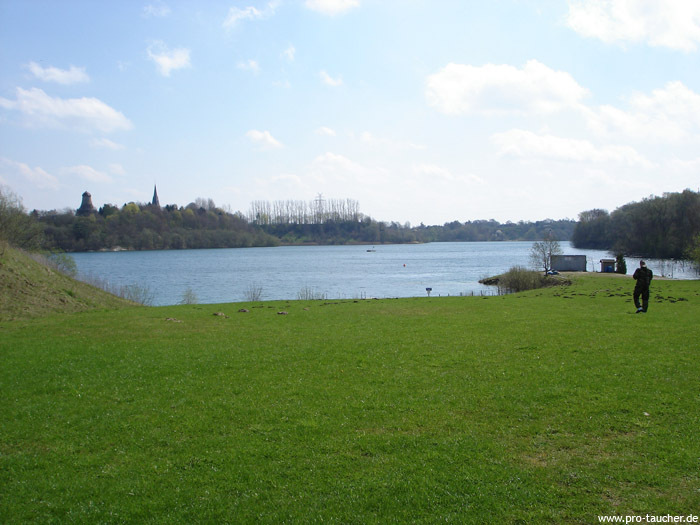 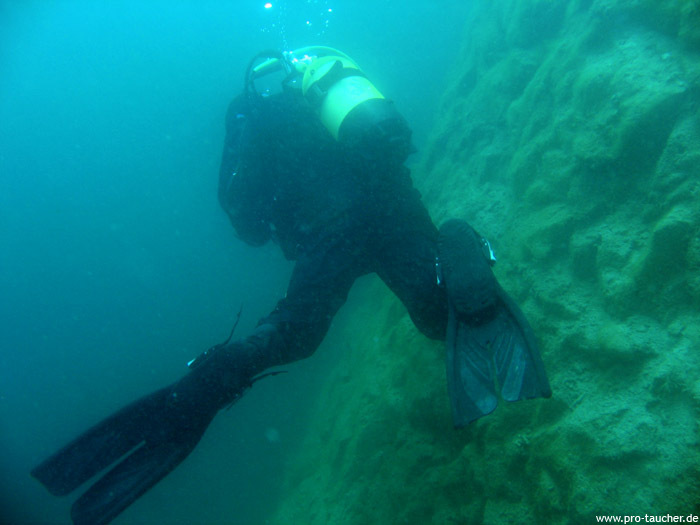 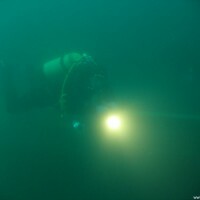 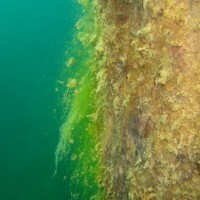 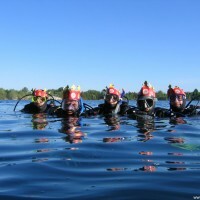 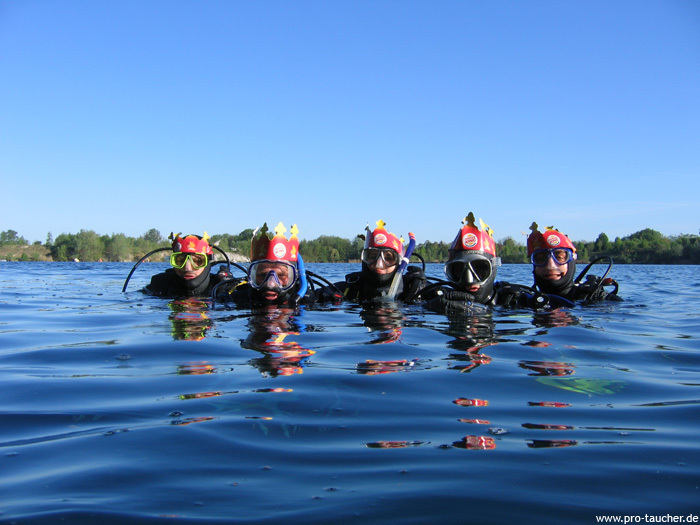 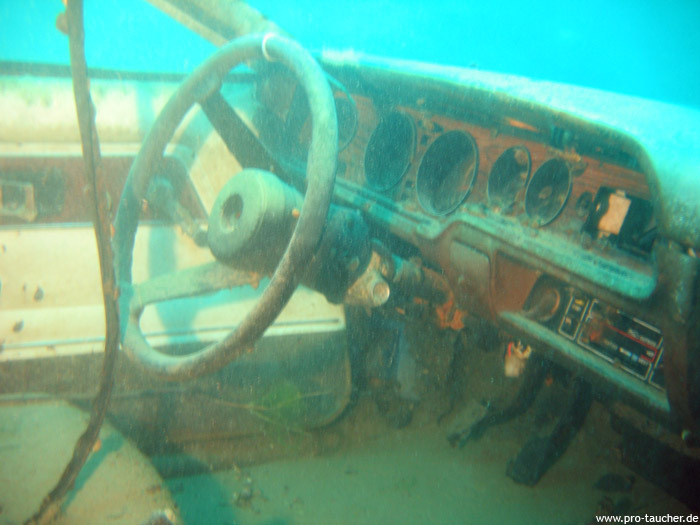 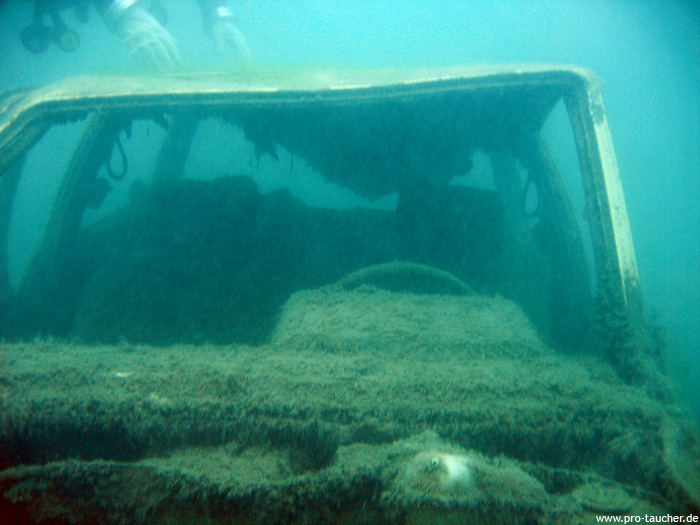 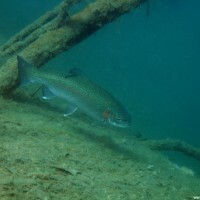 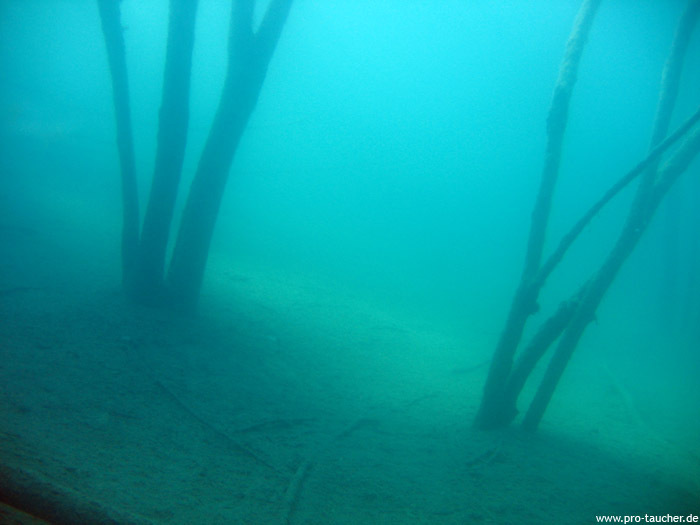 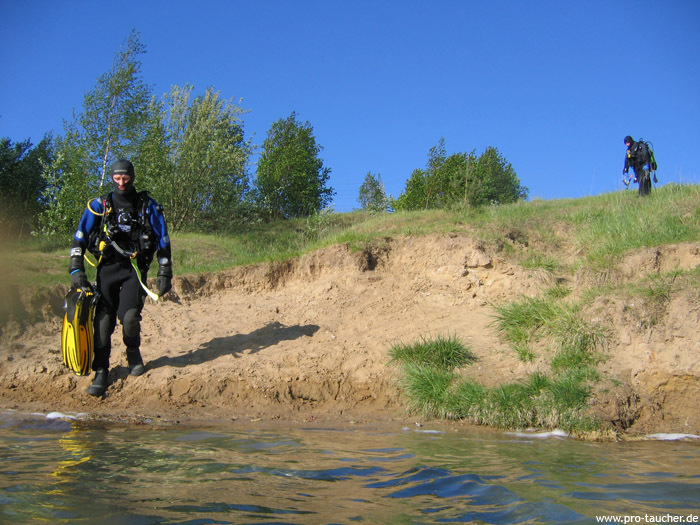 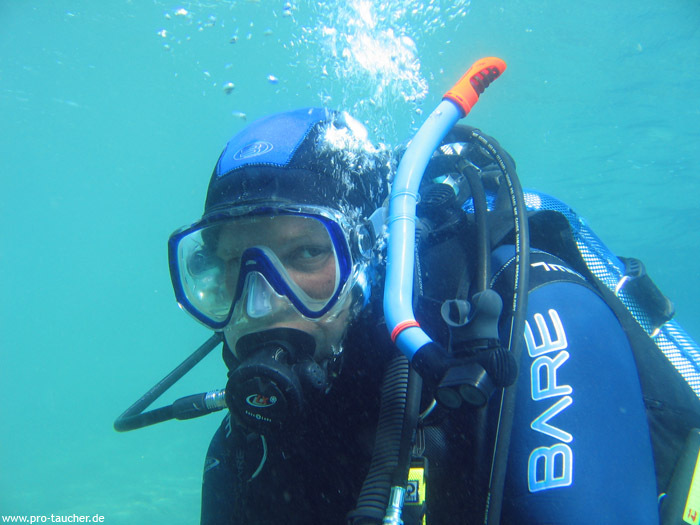 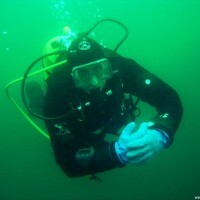 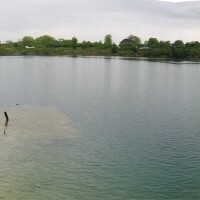 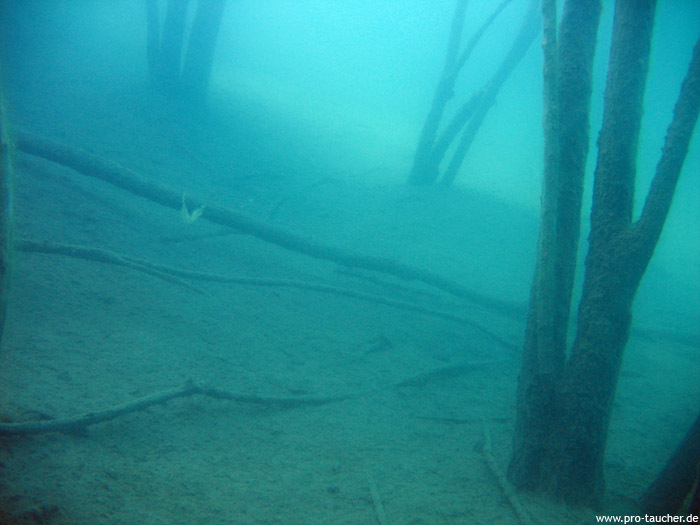 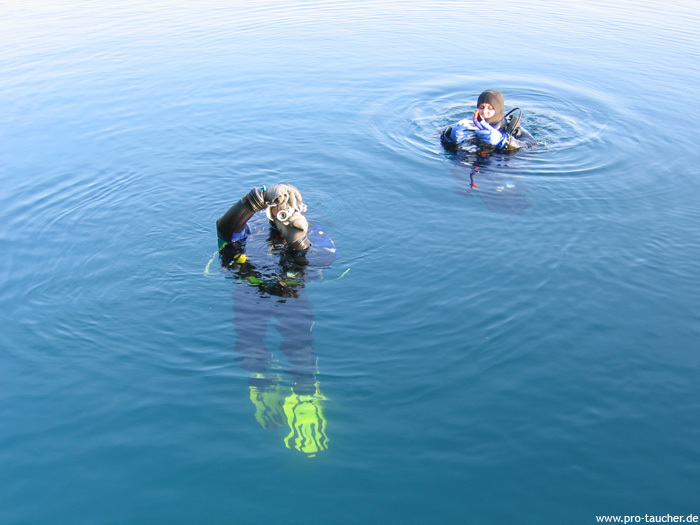 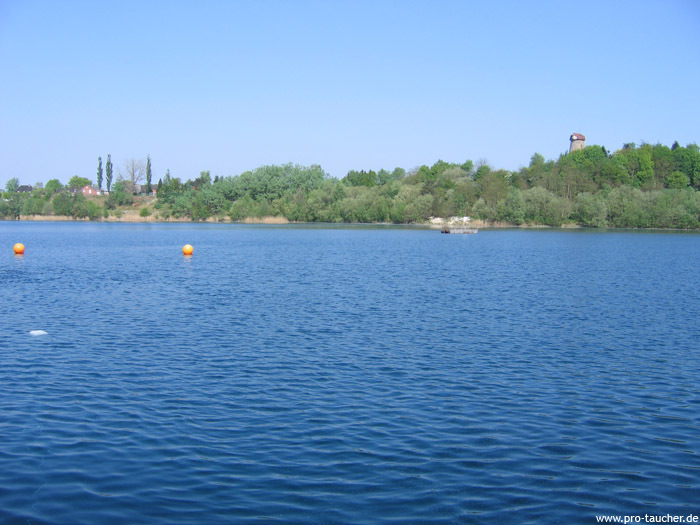 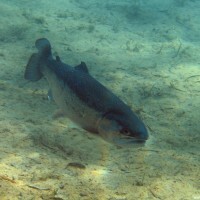 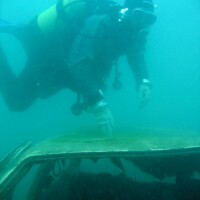 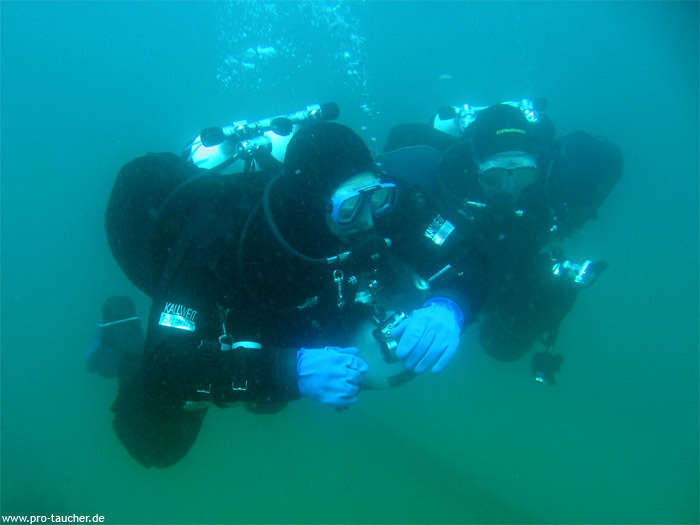 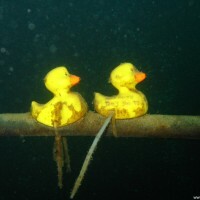 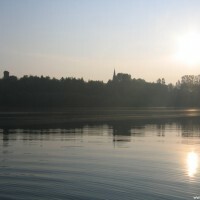 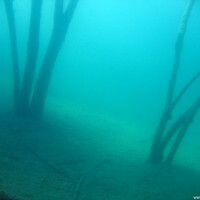 The lake is suitable for both beginners and advanced divers. 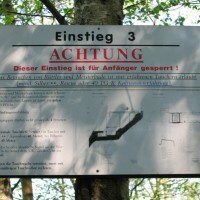 For beginners are limitated to the entries 1 and 4. 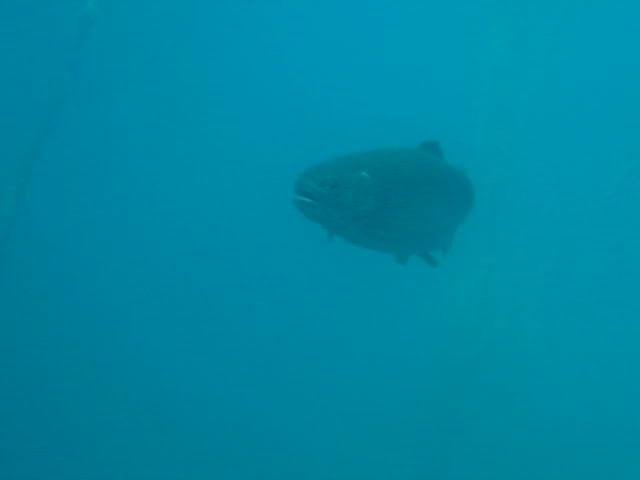 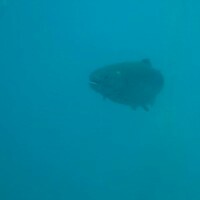 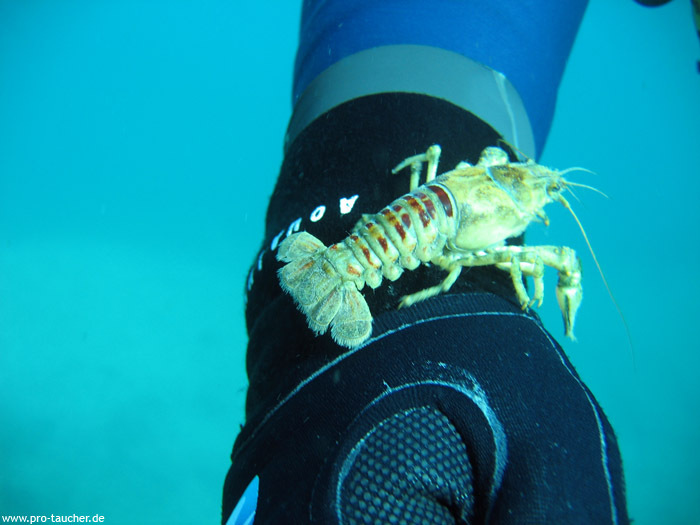 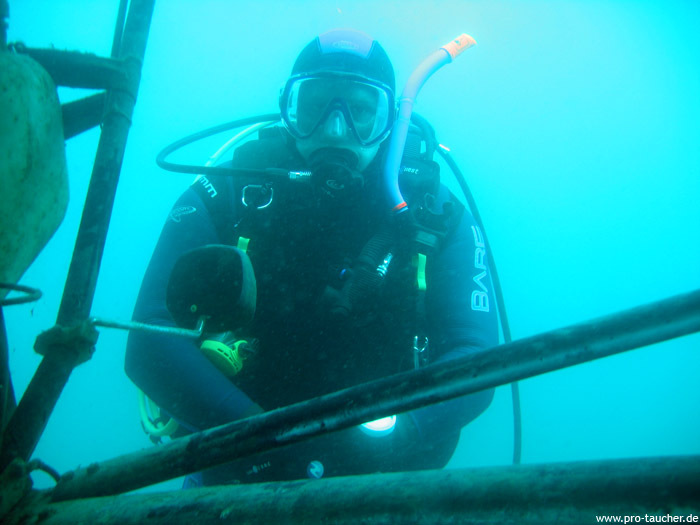 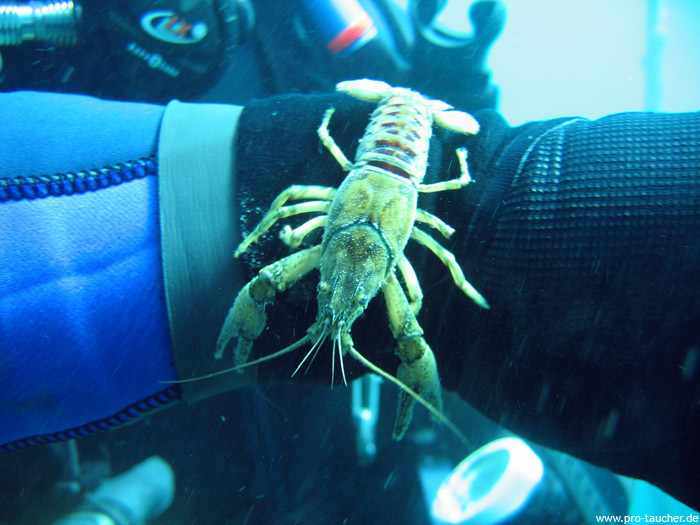 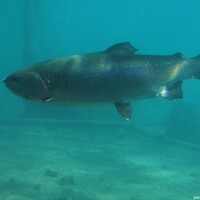 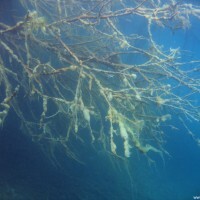 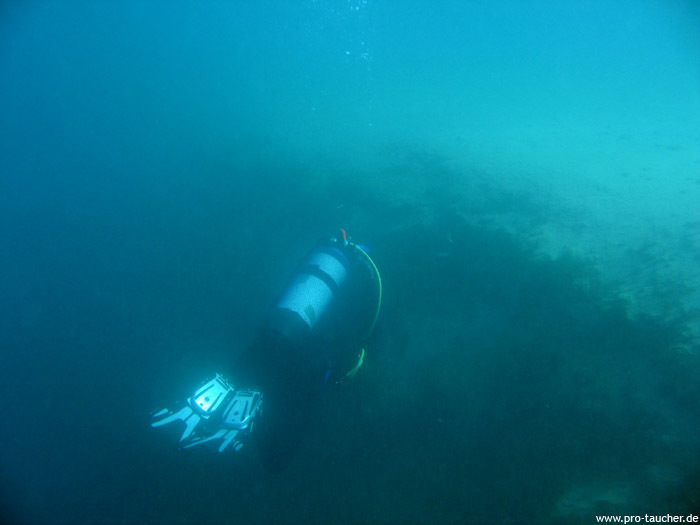 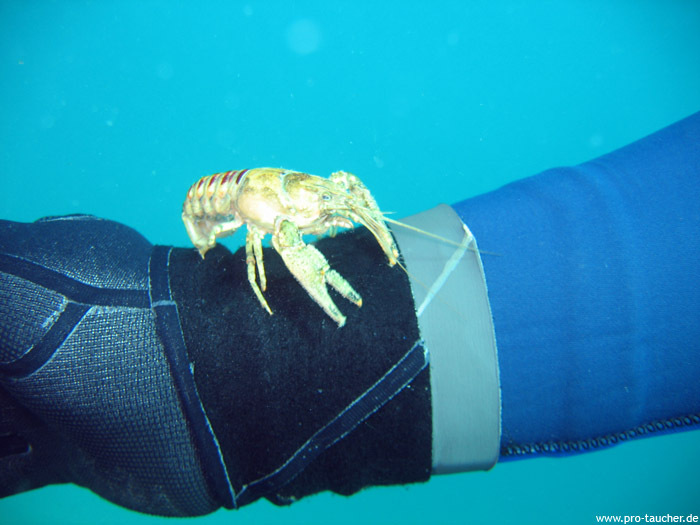 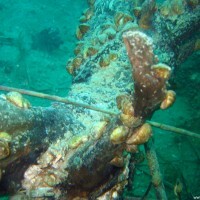 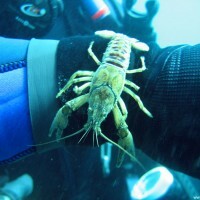 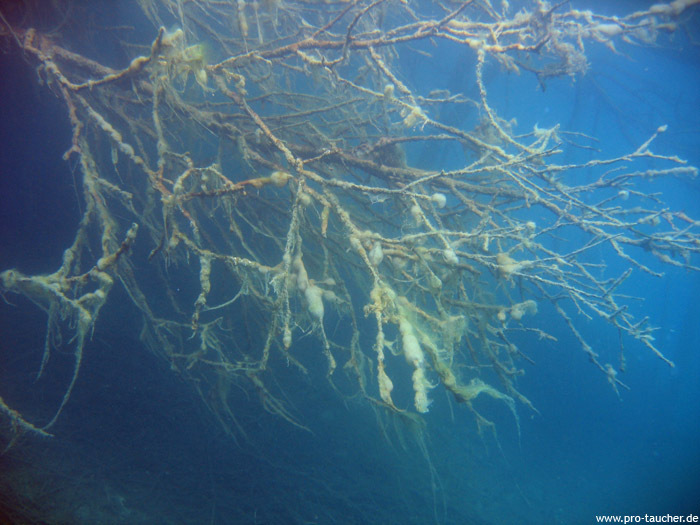 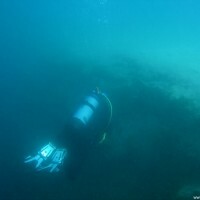 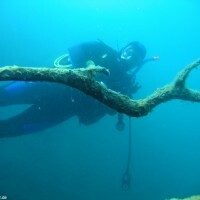 Please check the here mentioned website of the local divecenter for the diving rules, which among other things exactly regulate the maximum depth per diver. 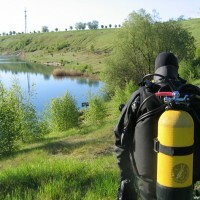 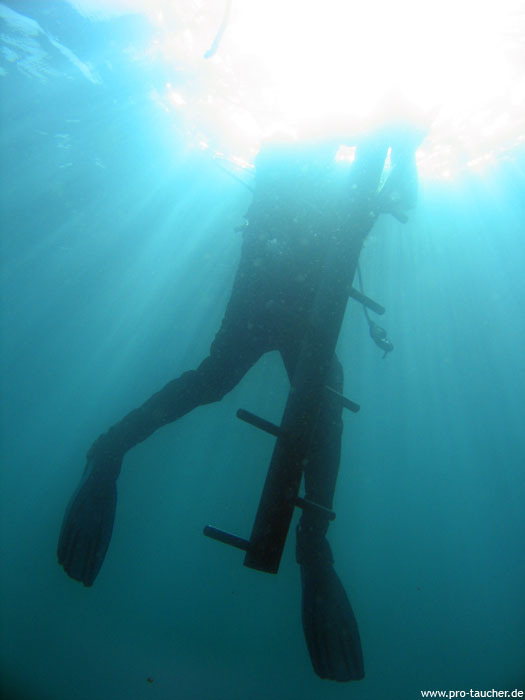 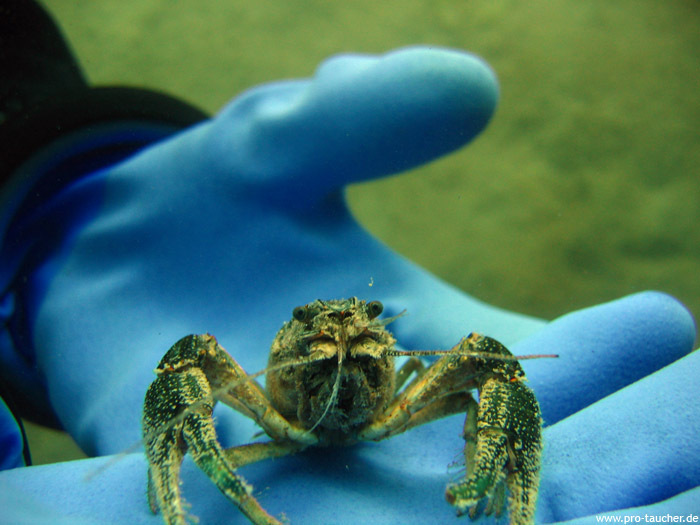 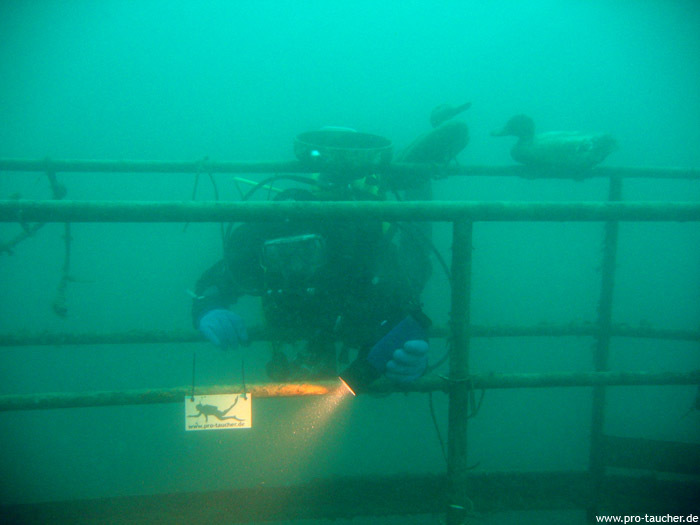 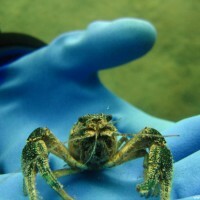 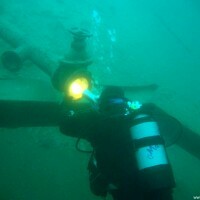 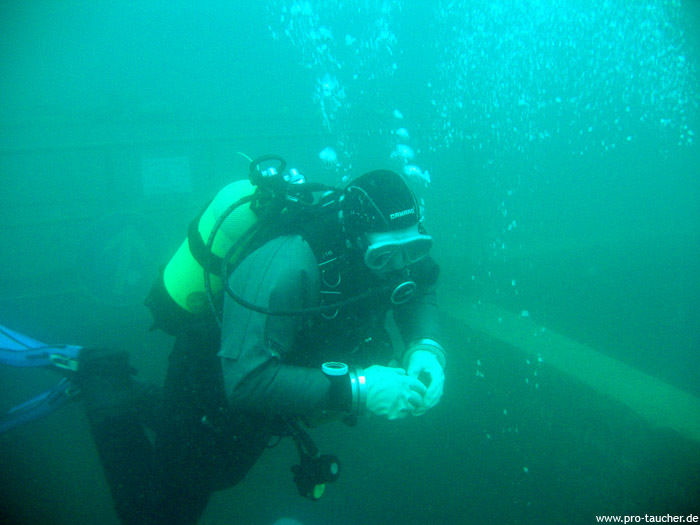 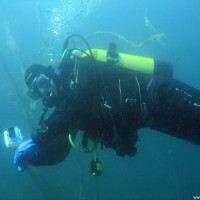 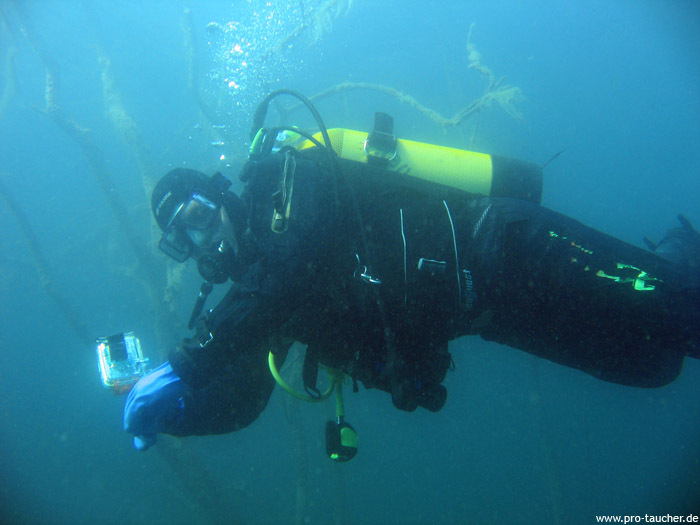 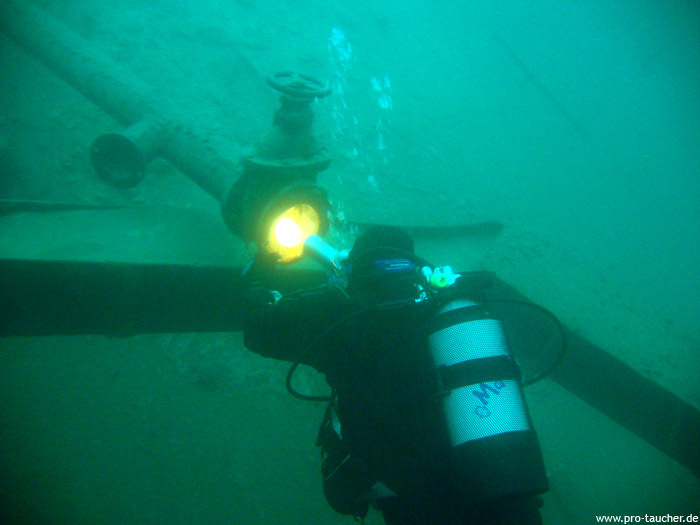 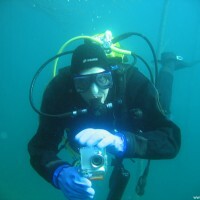 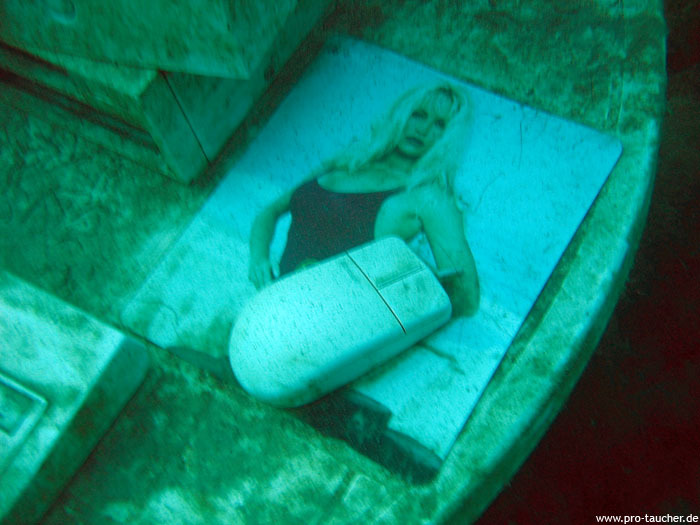 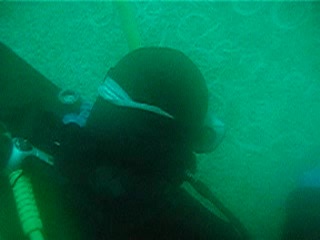 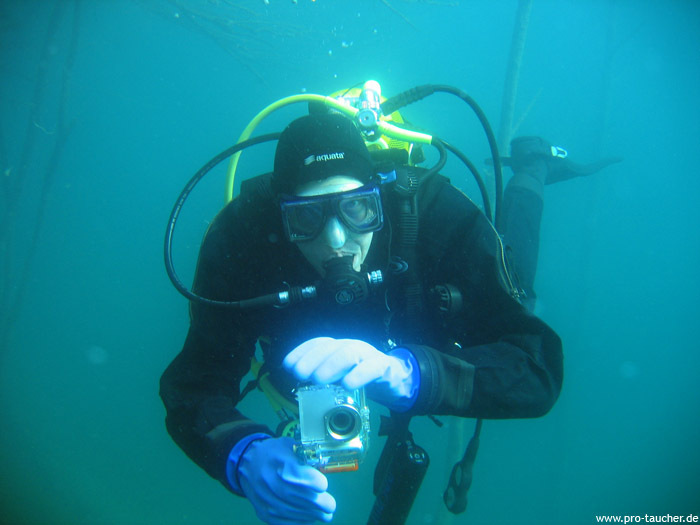 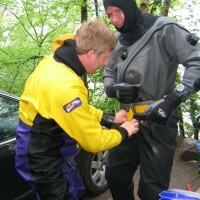 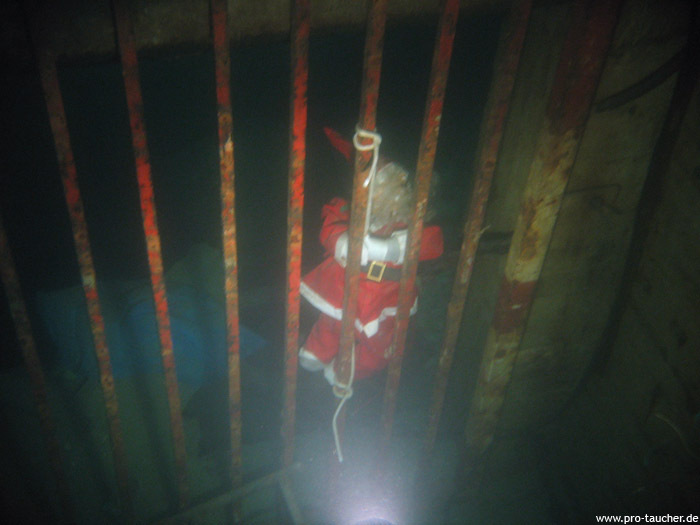 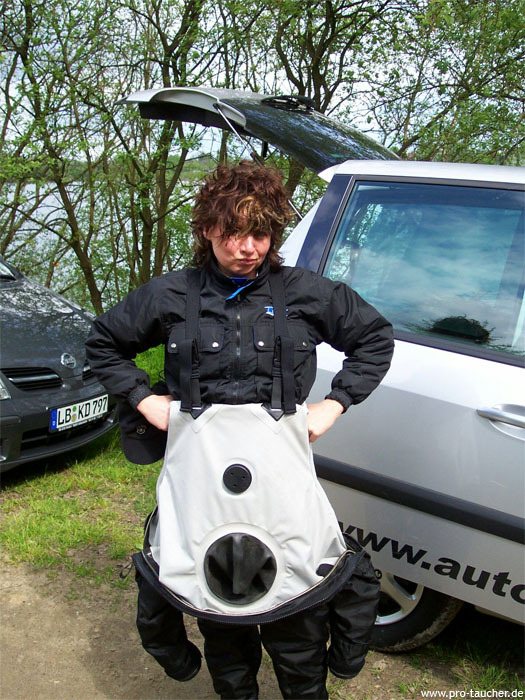 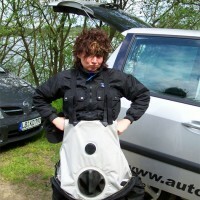 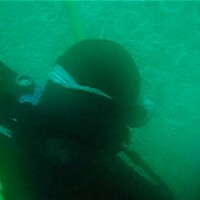 Attention: Regular checks of divers and dive computers are not uncommon. 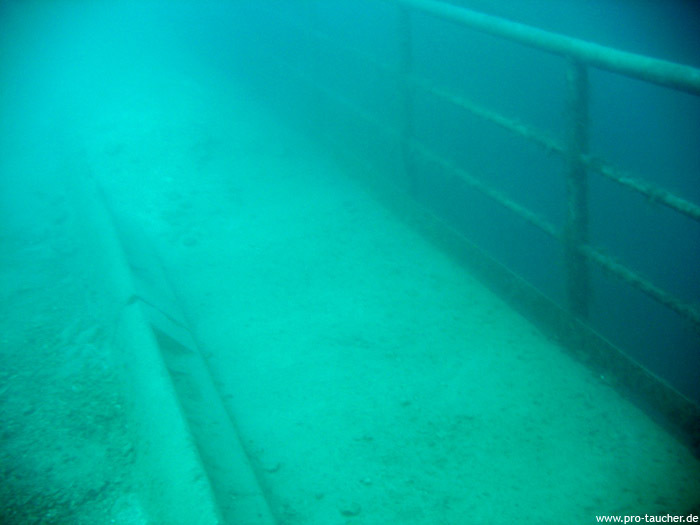 Entry 0: The pontoon to the left of entry 1, directly down the meadow from the dive center, is entry 0. 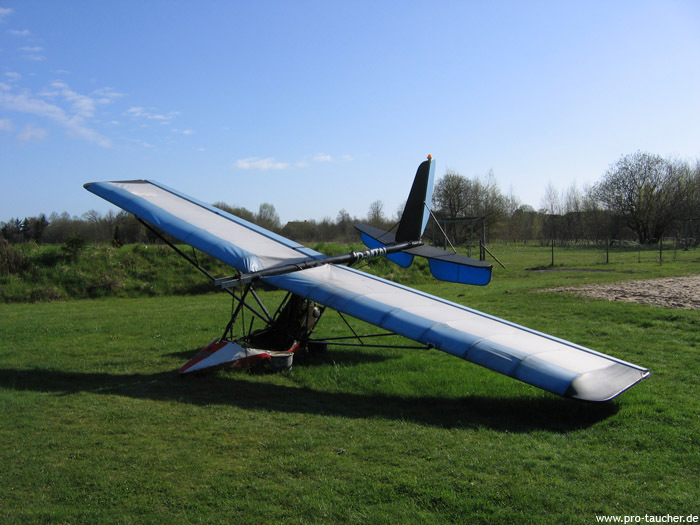 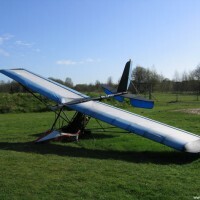 Here, in 2-3 minutes, the glider is floating free on 17 meters. 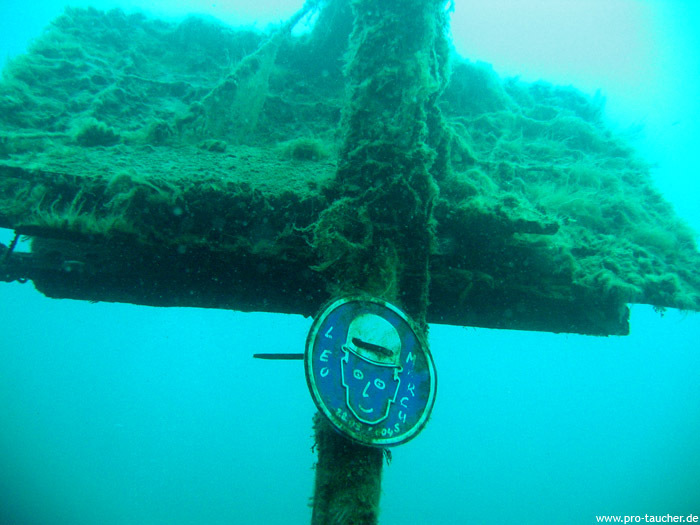 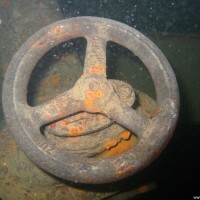 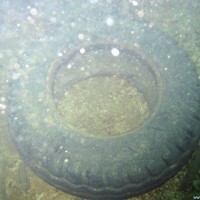 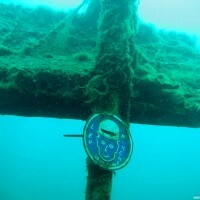 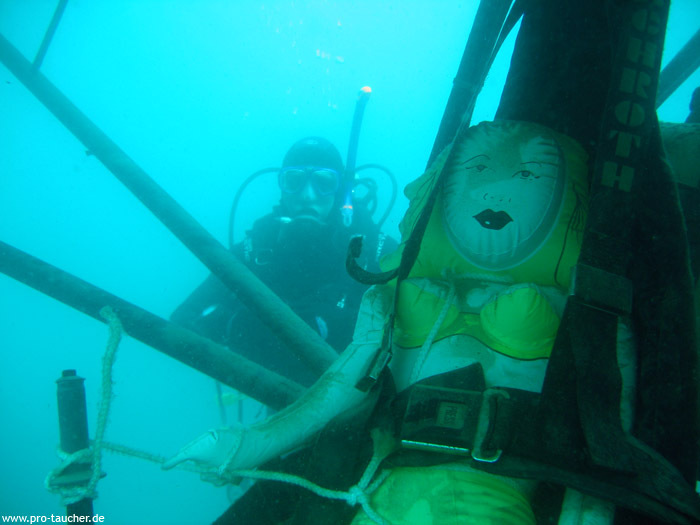 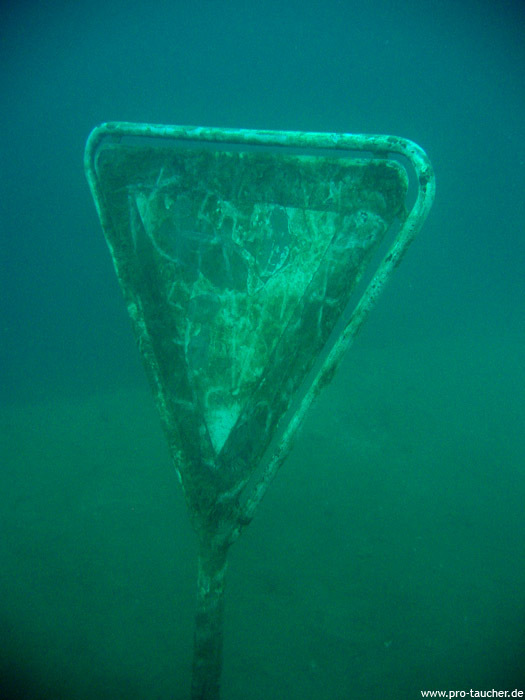 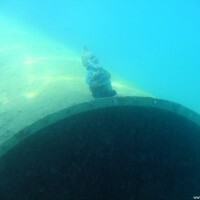 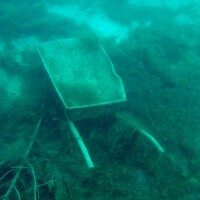 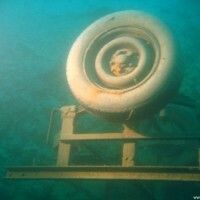 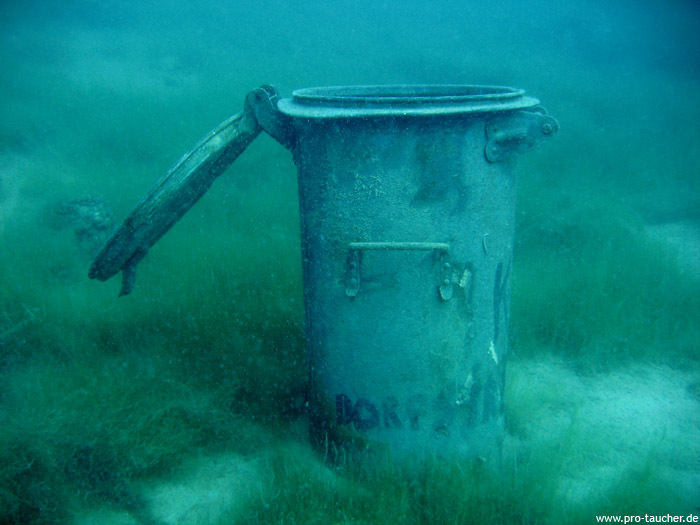 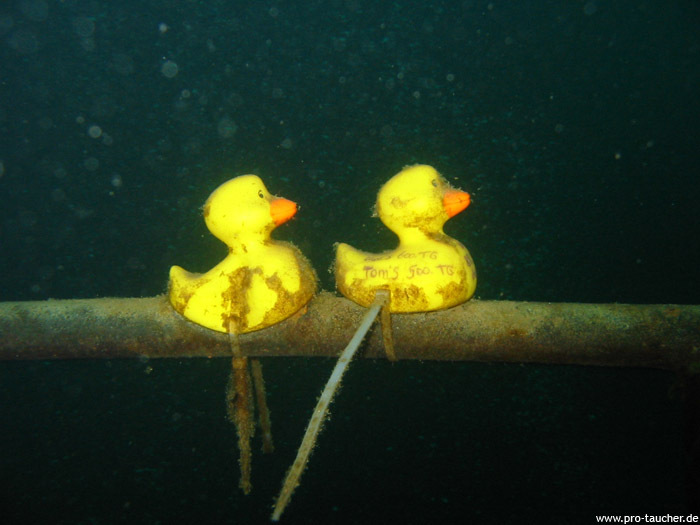 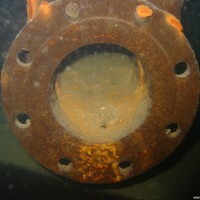 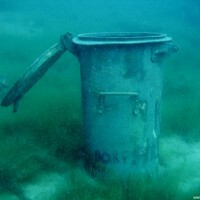 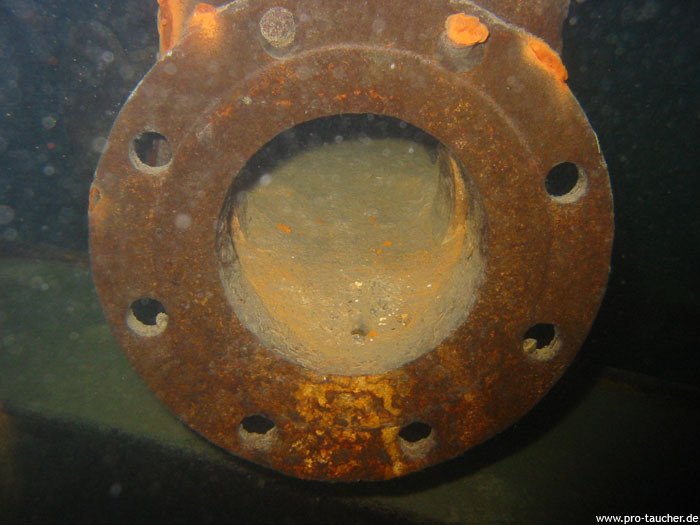 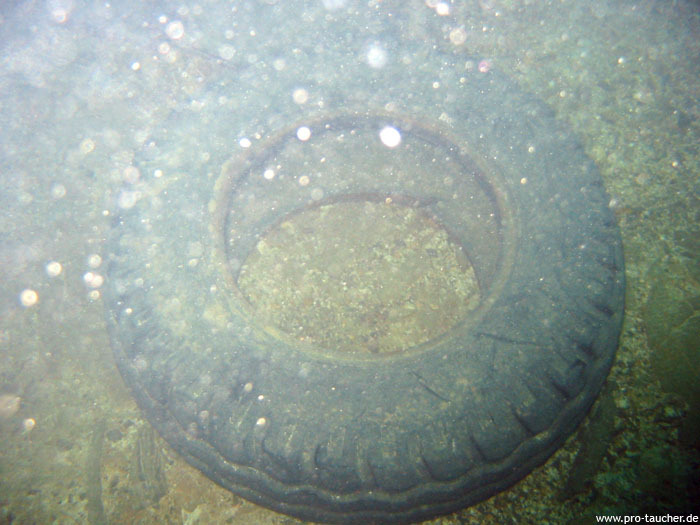 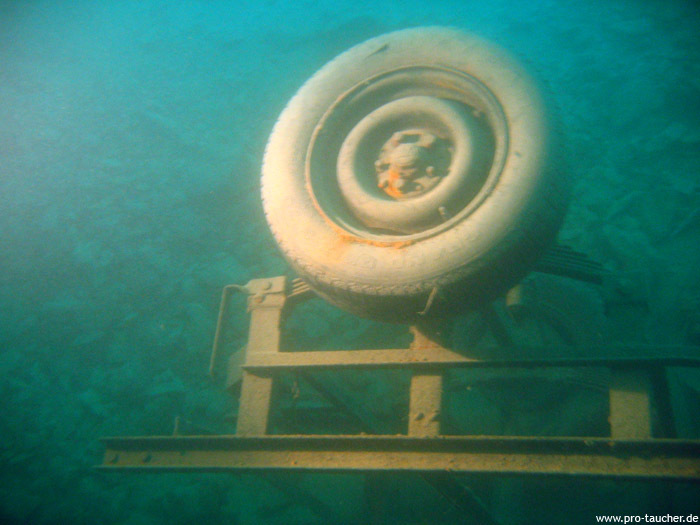 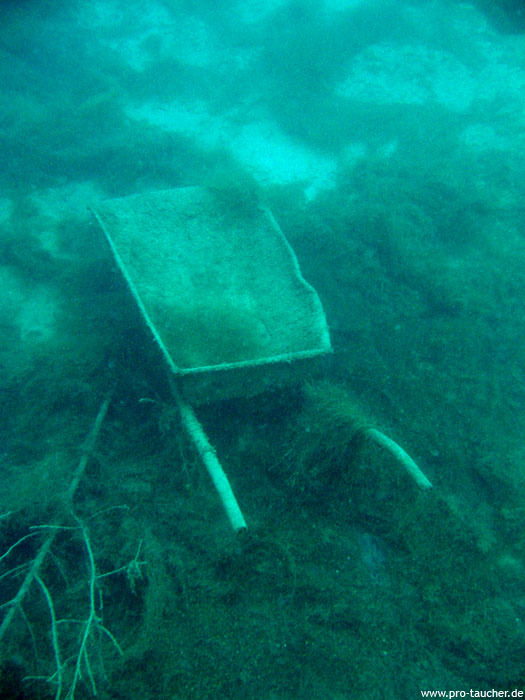 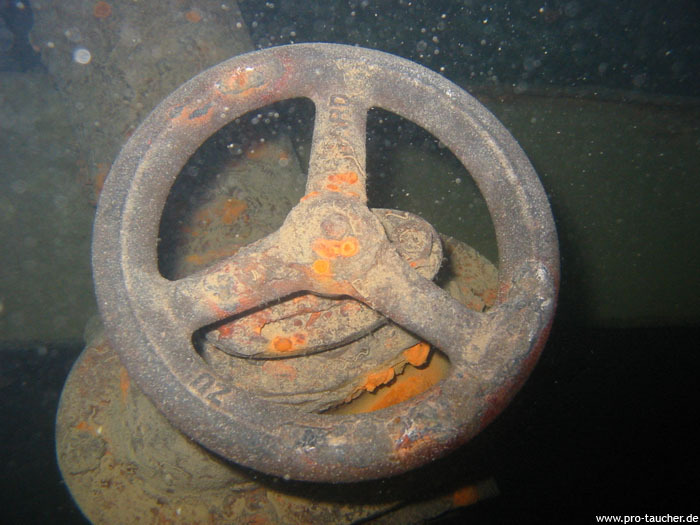 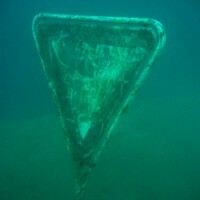 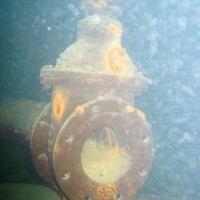 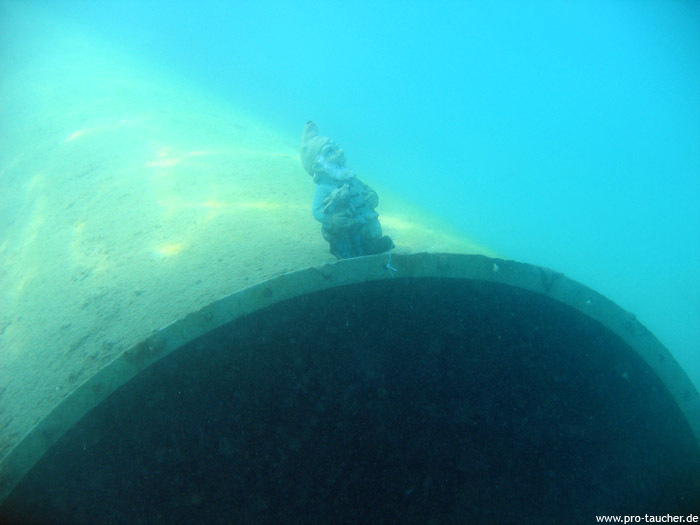 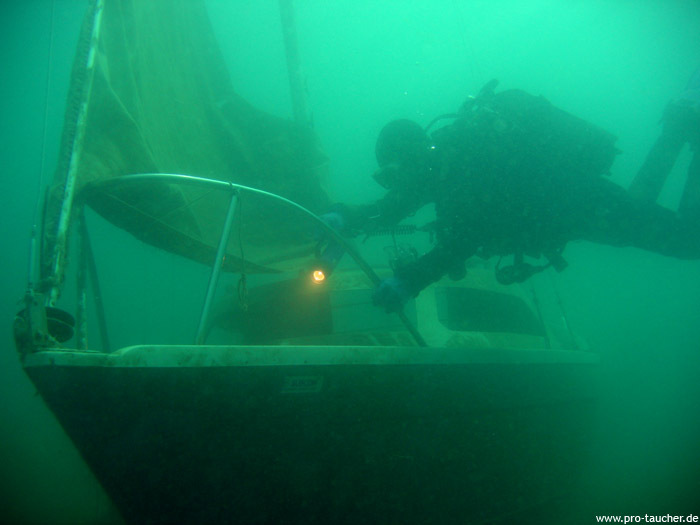 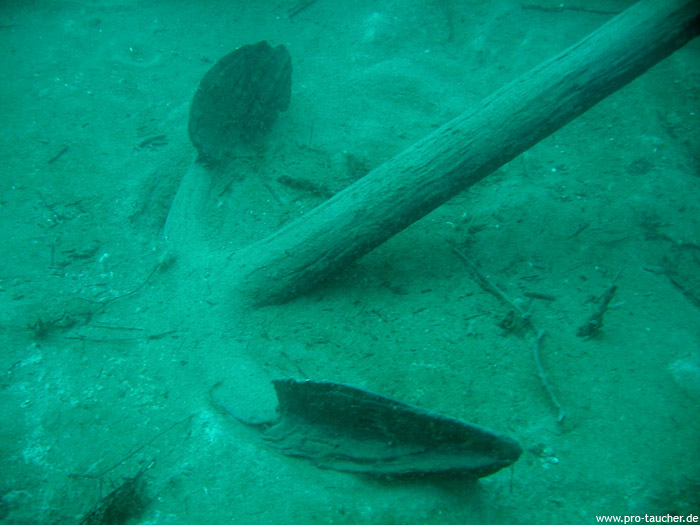 It is marked by a buoy and can be dived with the compass. 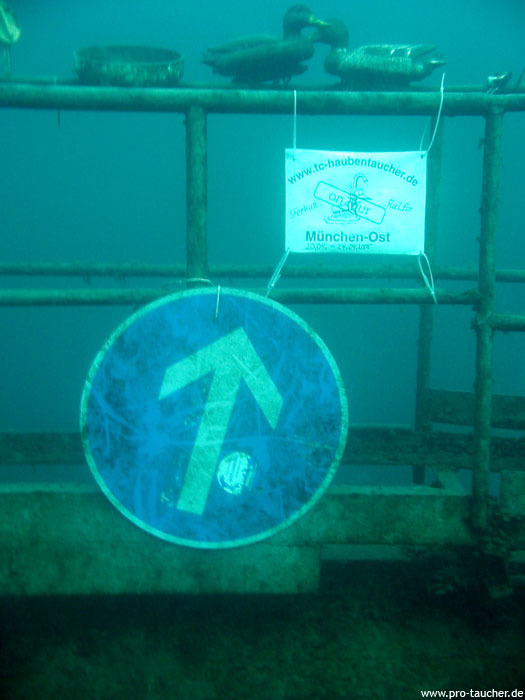 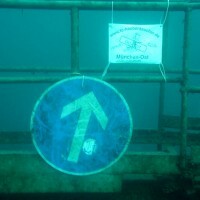 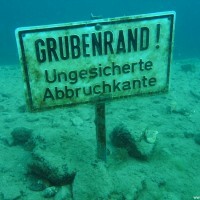 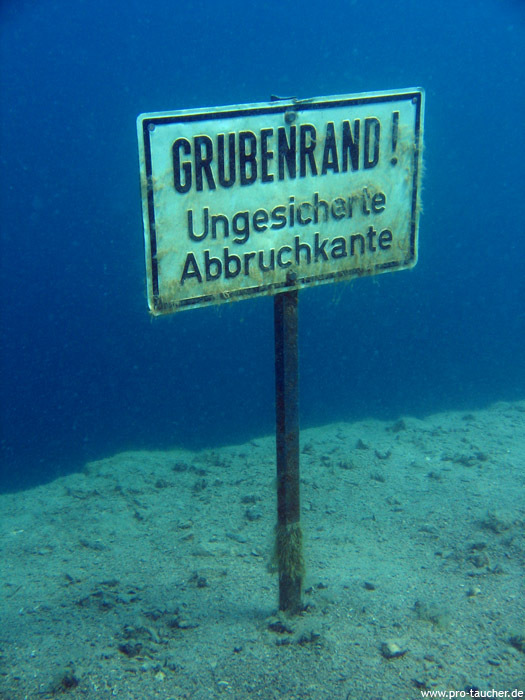 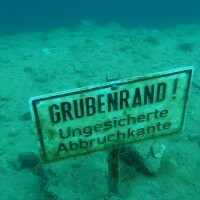 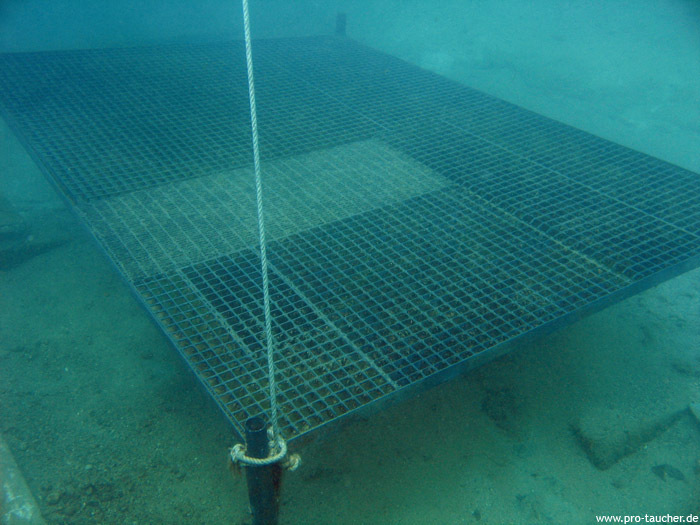 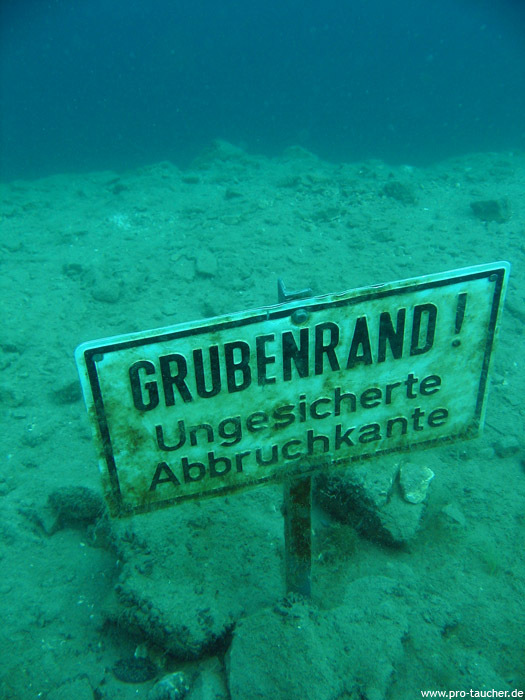 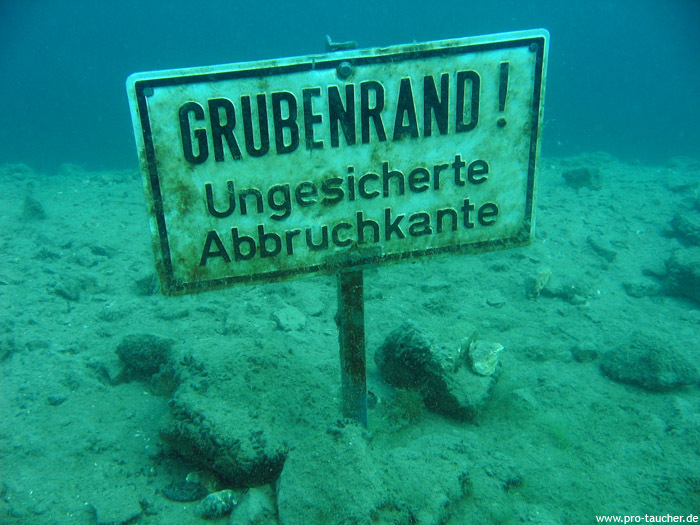 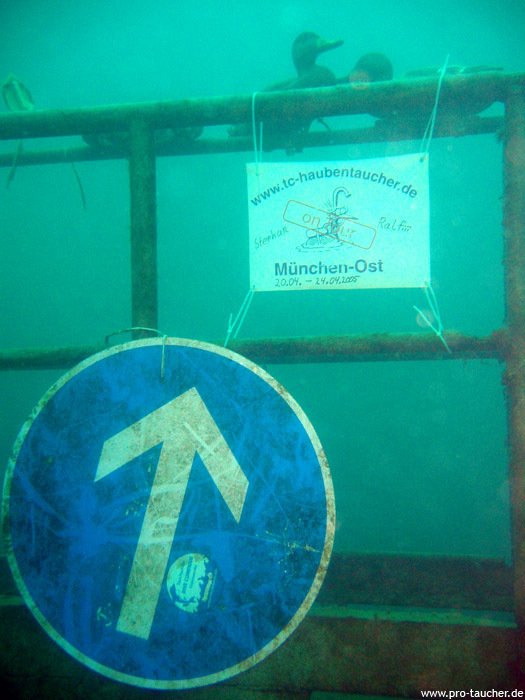 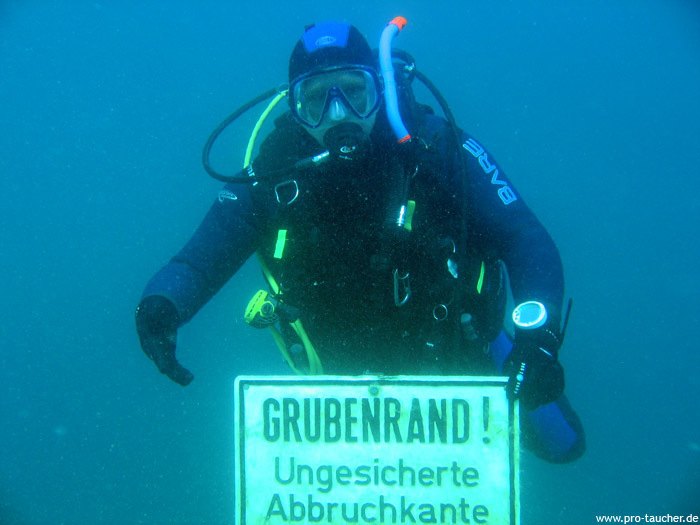 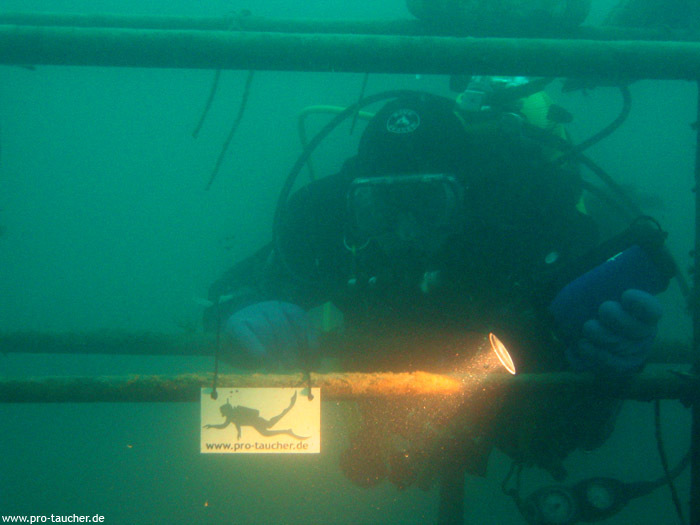 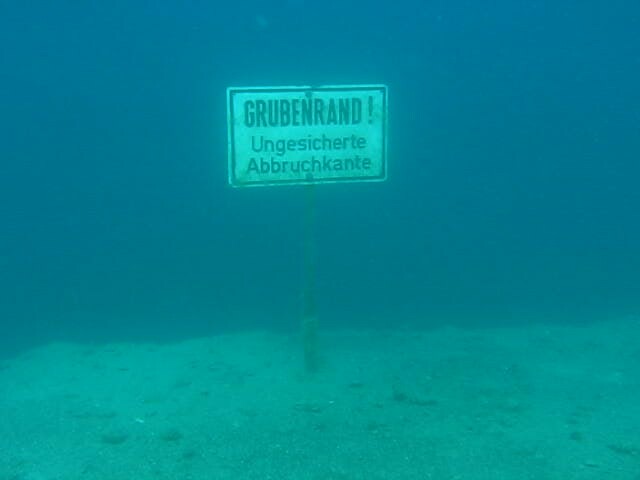 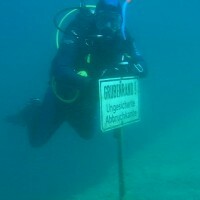 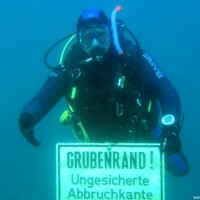 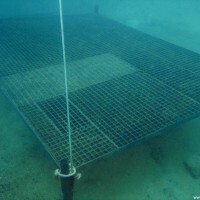 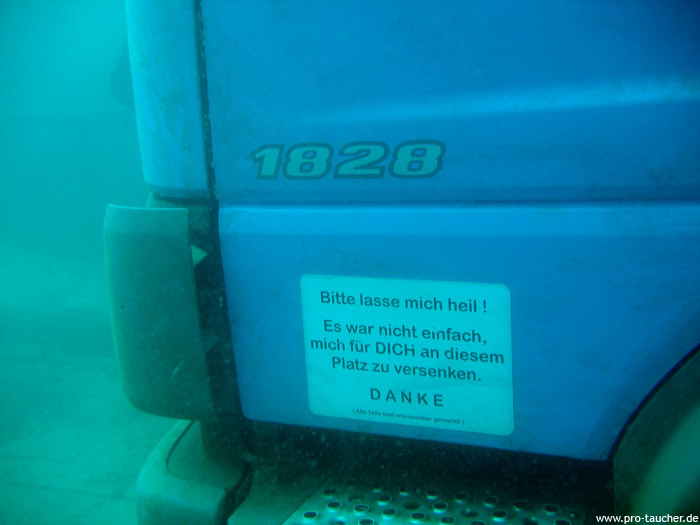 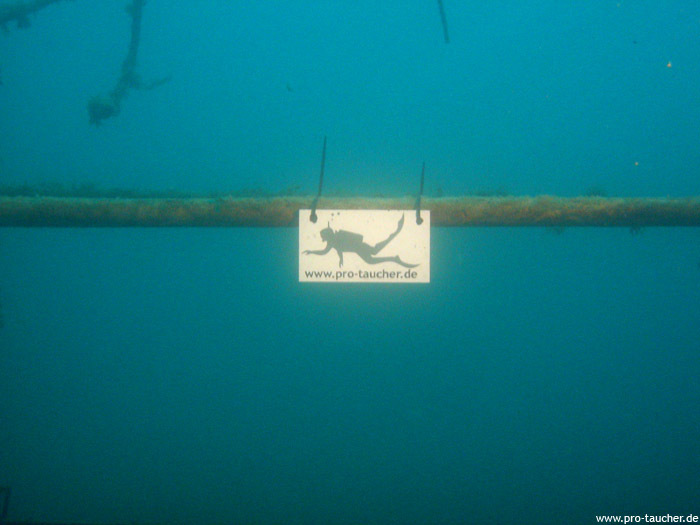 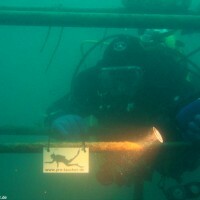 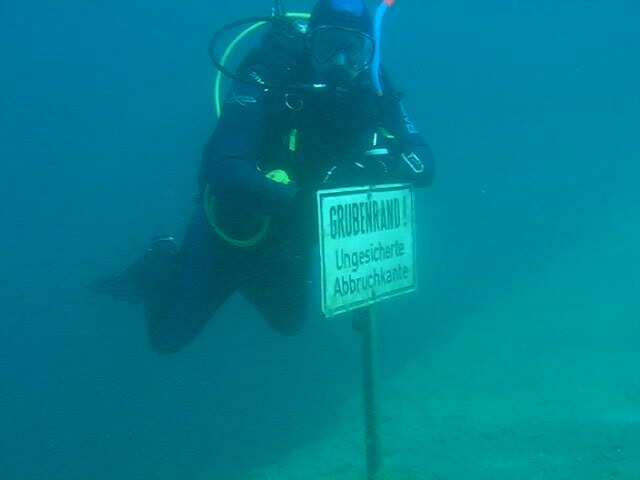 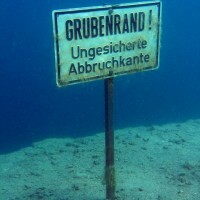 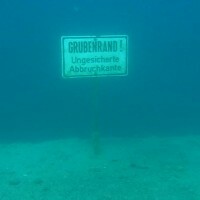 To the left there is the "pin board" and the VW Polo, until the fish breeding area begins (diving prohibited area!). 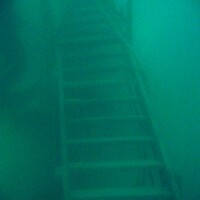 To the right you get to the conveyor belts and the drop off, which leads until shortly before entry 1. 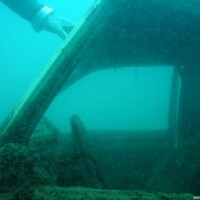 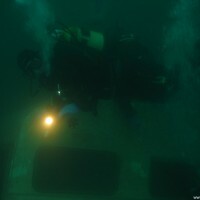 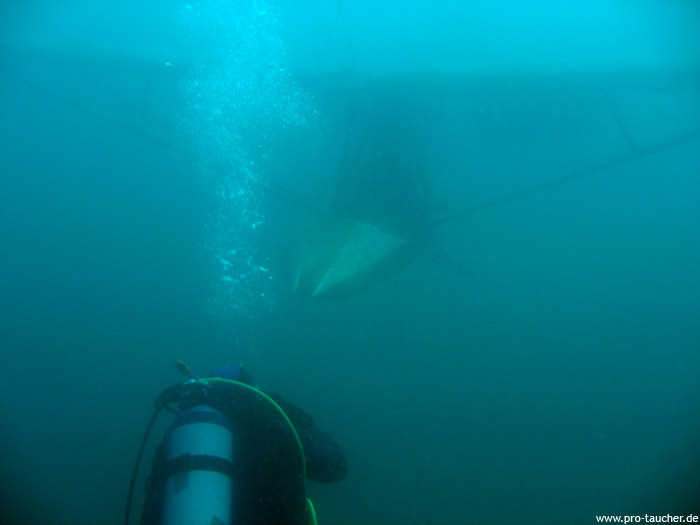 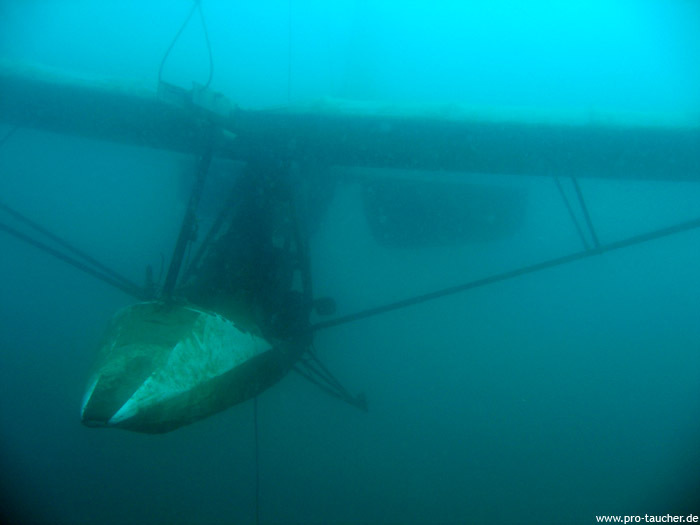 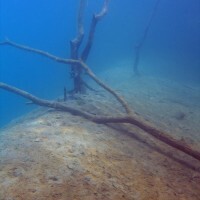 Entry 1: Over the old road you dive comfortably to two practice platforms at shallow depths, the sailboat at about 10 meters depth and the sunken forest on the right side. 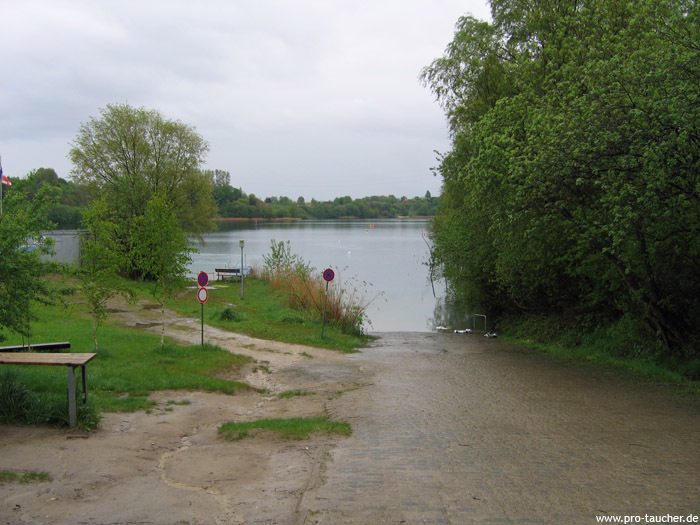 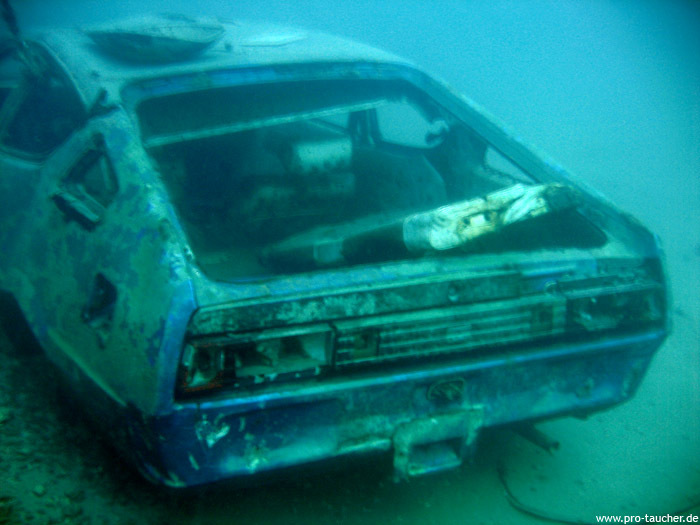 The white VW Polo, which stood across the road for a long time, had to give way to the sailboat and is now somewhere between entry 0 and entry 5. 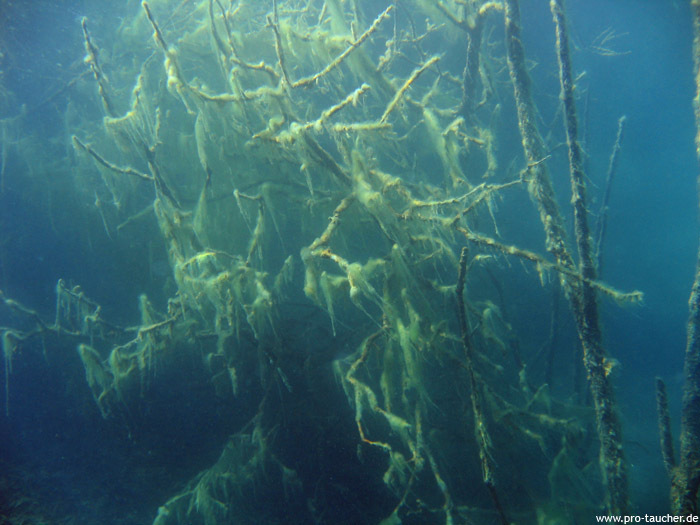 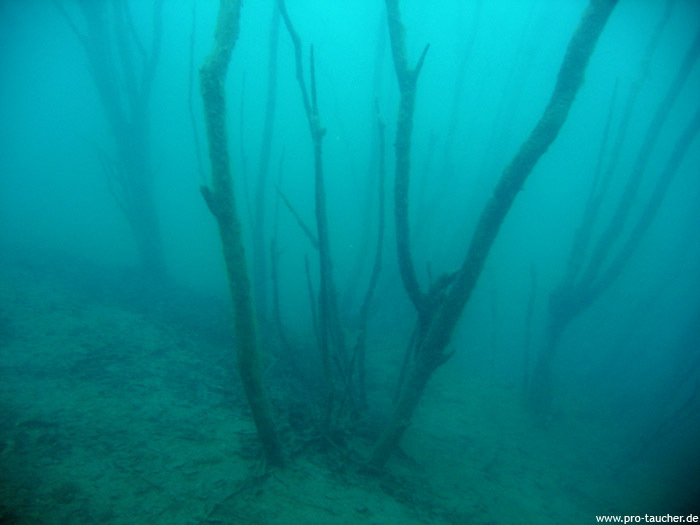 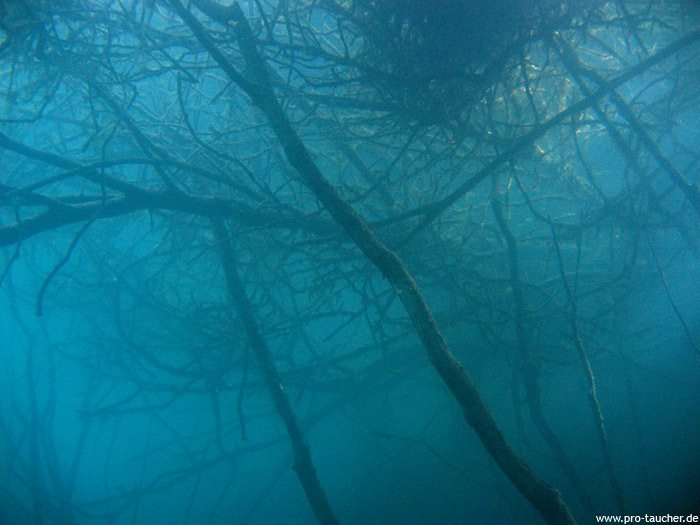 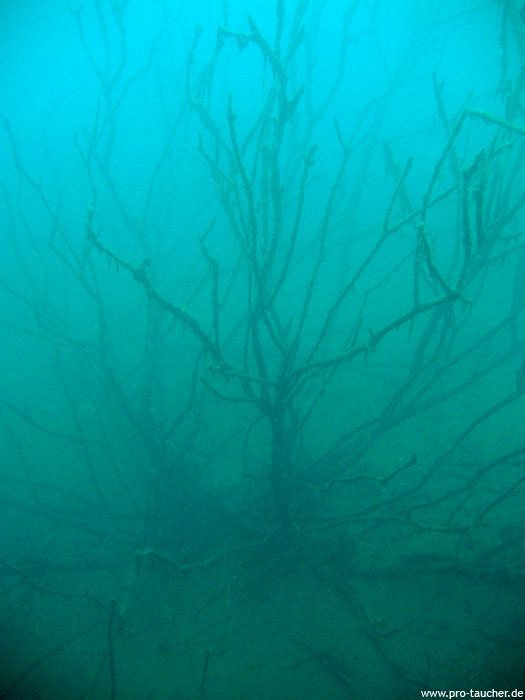 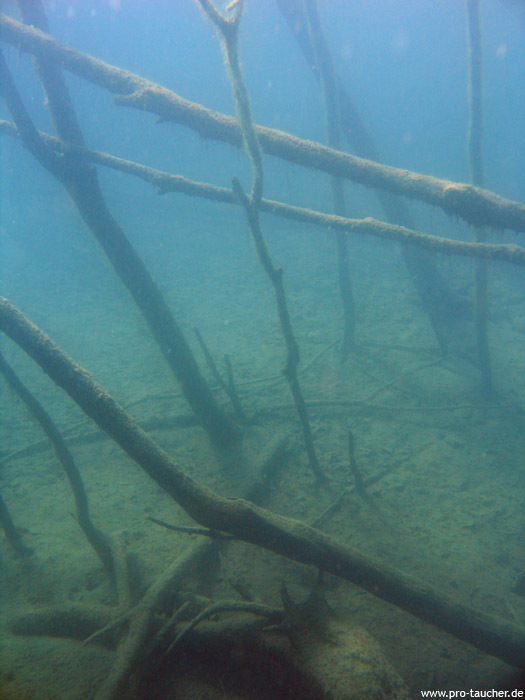 Entry 2: Get straight into the sunken forest. 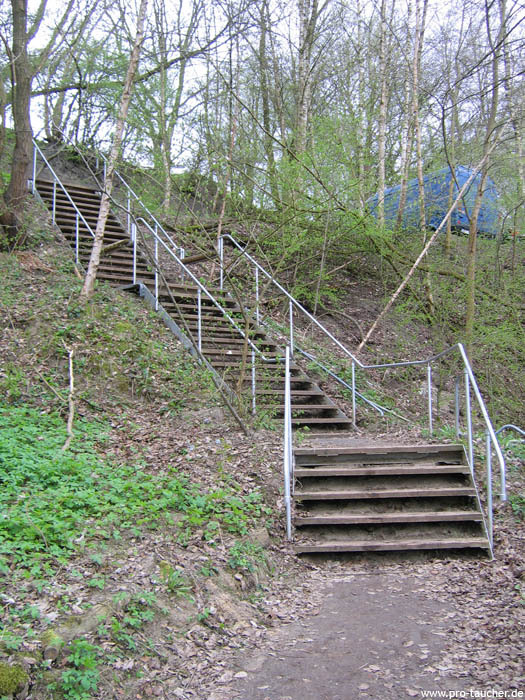 Entry 3: A steep but well maintained and well-walked wooden staircase leads to the entry. 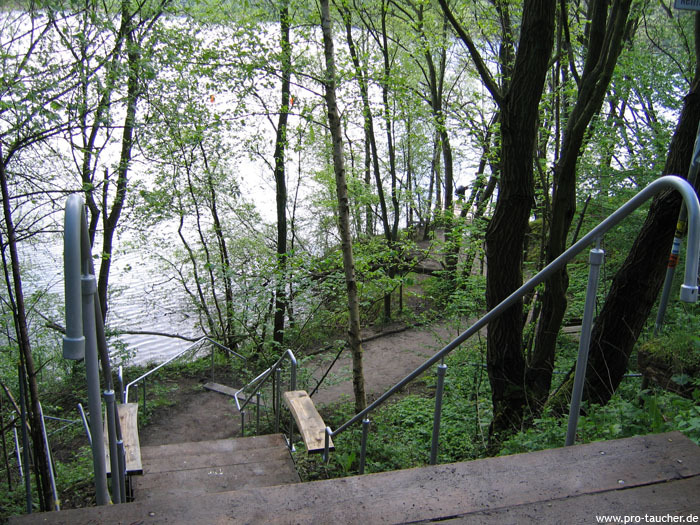 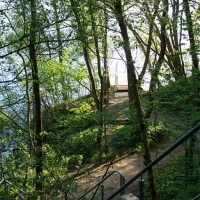 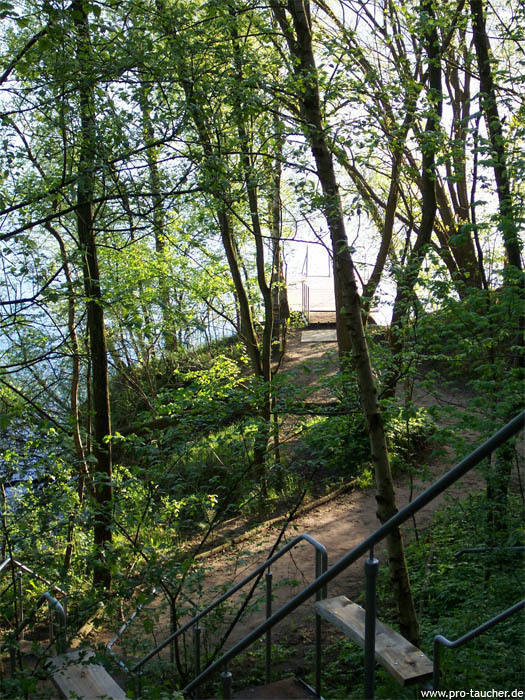 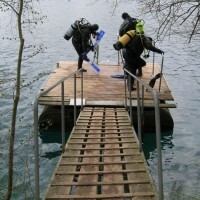 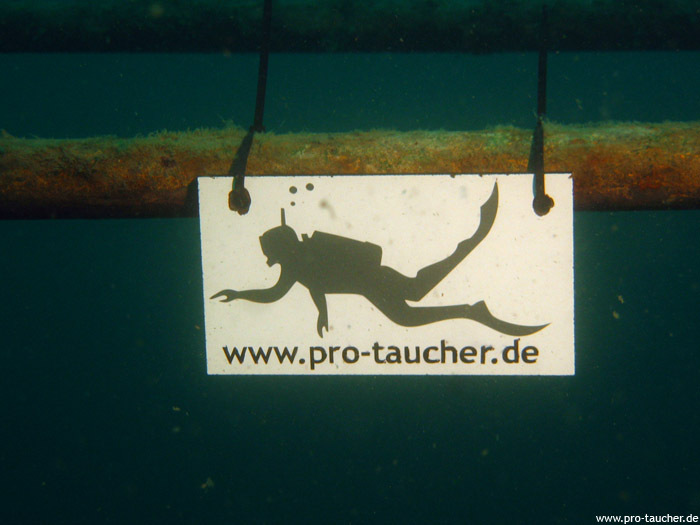 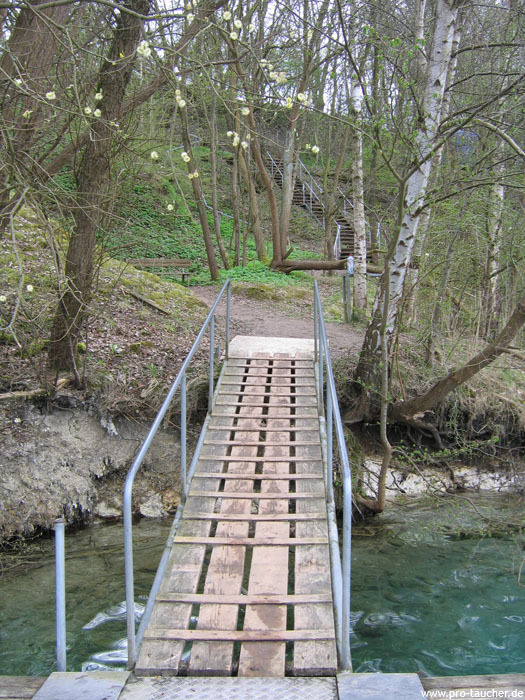 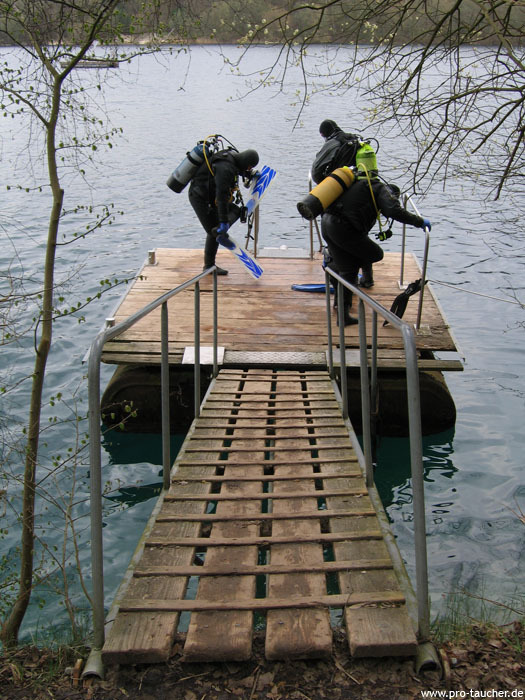 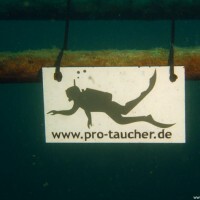 The Rüttler can be reached by diving down the steep slope from the entry platform directly into the lake. 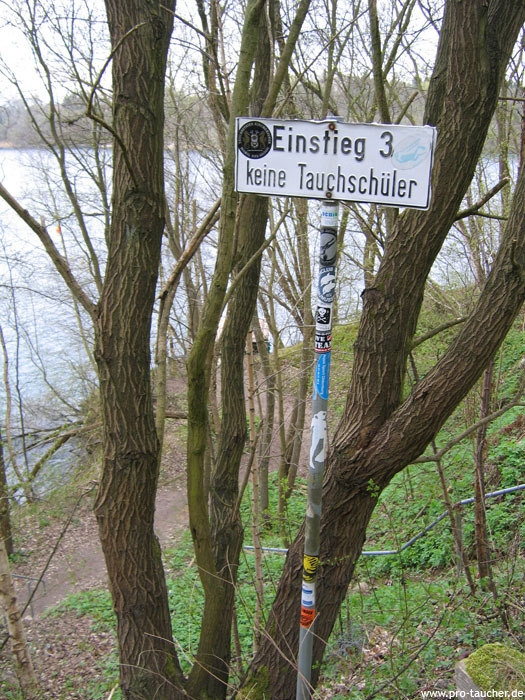 The Rüttler starts at 20 meters. 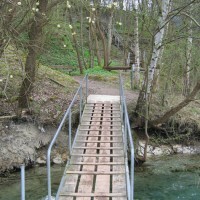 Here there are railings, street lamps and the funnel of the Rüttler, in the earlier the material to be separated (chalk and flint stone) was poured. 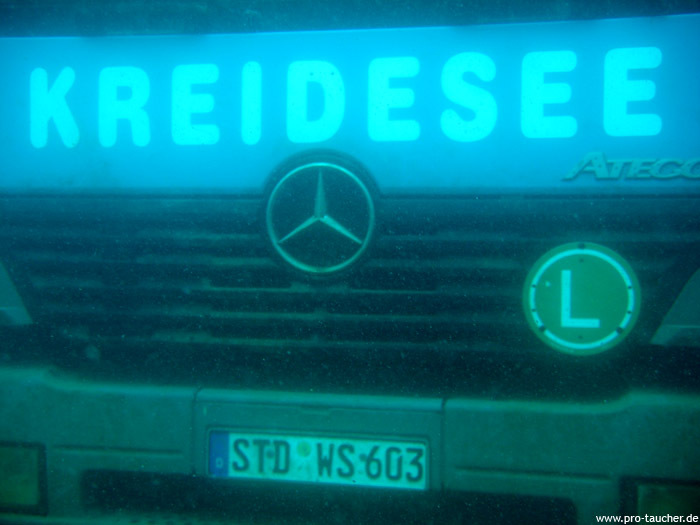 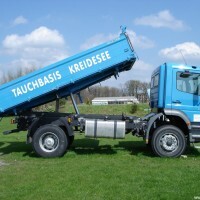 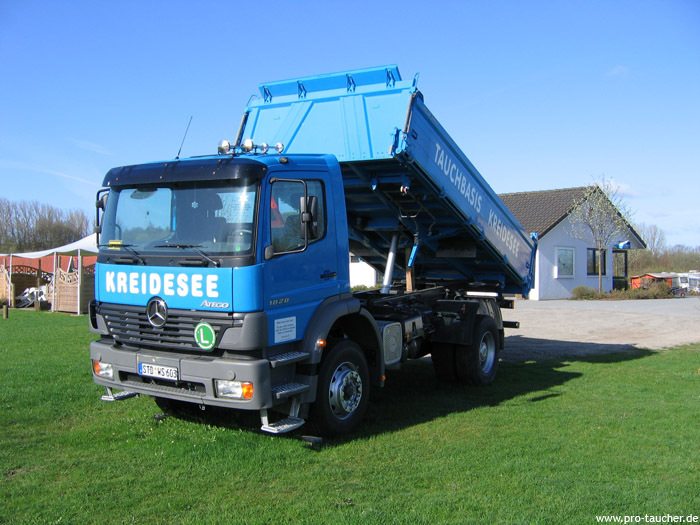 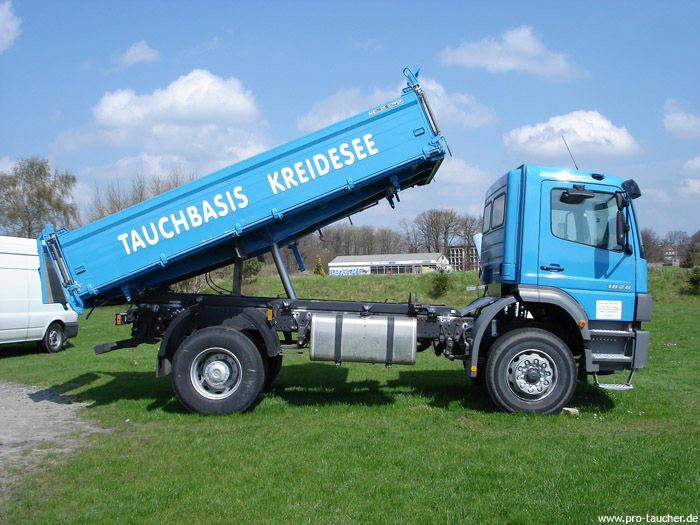 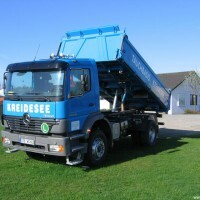 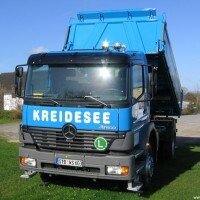 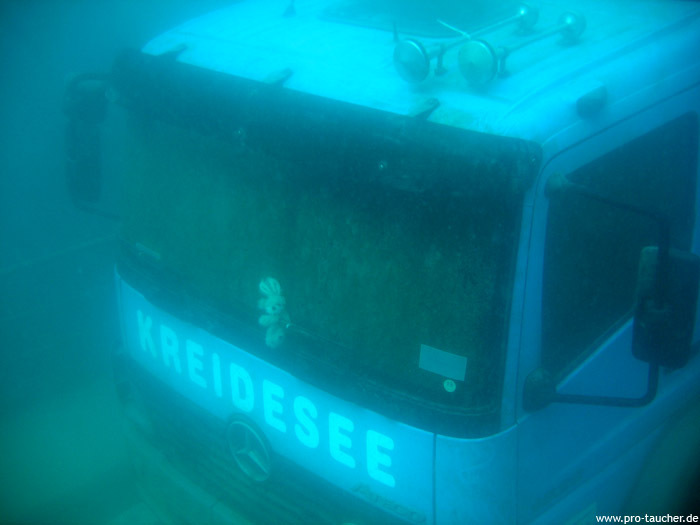 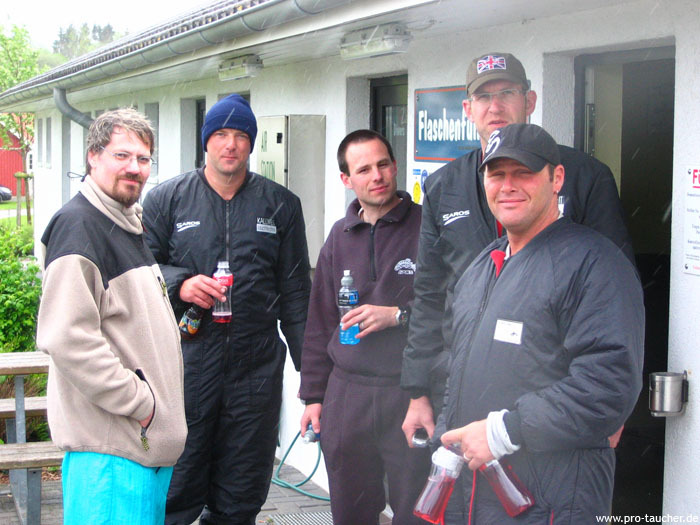 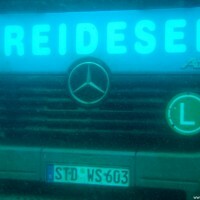 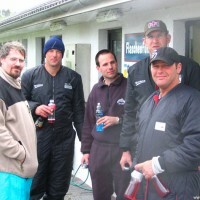 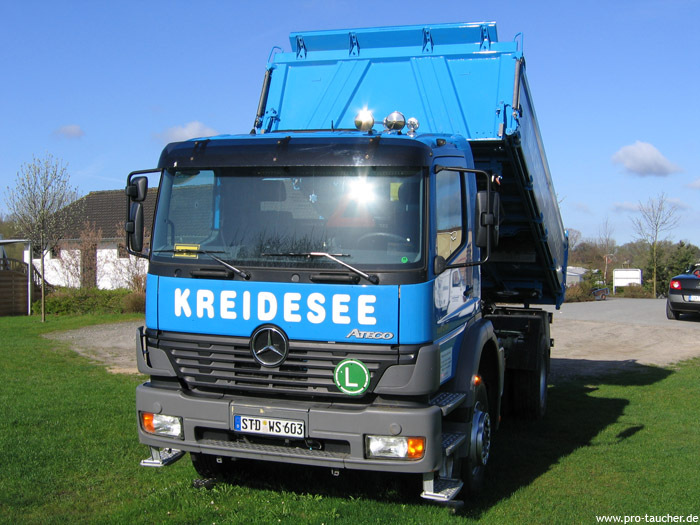 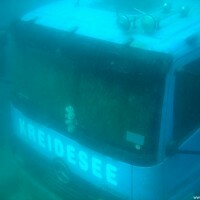 Since 2006, there is a Mercedes truck at the top of the Rüttler. 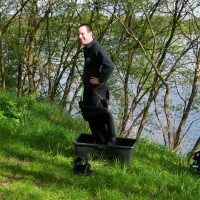 This stands with folded cargo bed as if he had just poured his load into the funnel of the Rüttler. 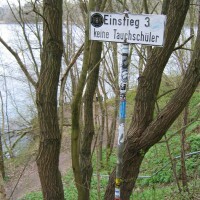 The foot of the Rüttler is located at 32 meters. 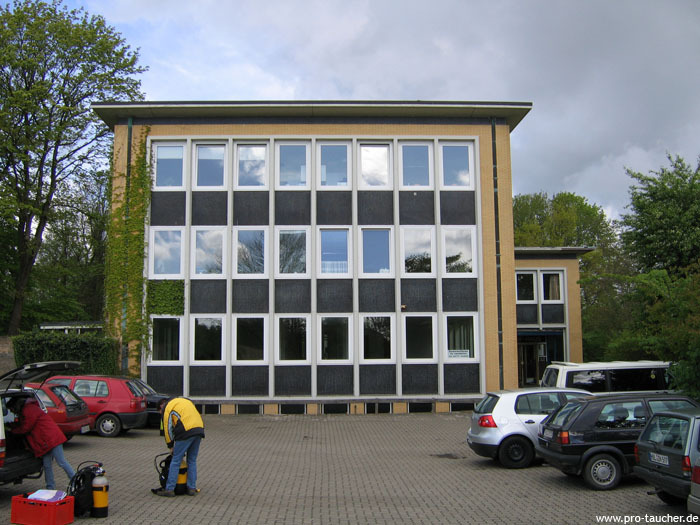 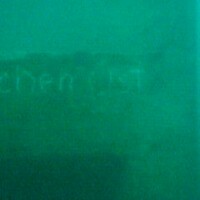 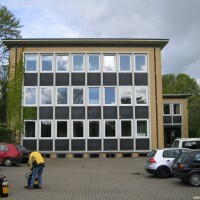 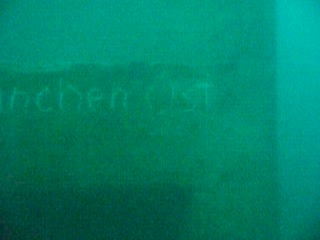 Here you will also find the 3 entrances of the Meisterbude (former office room). 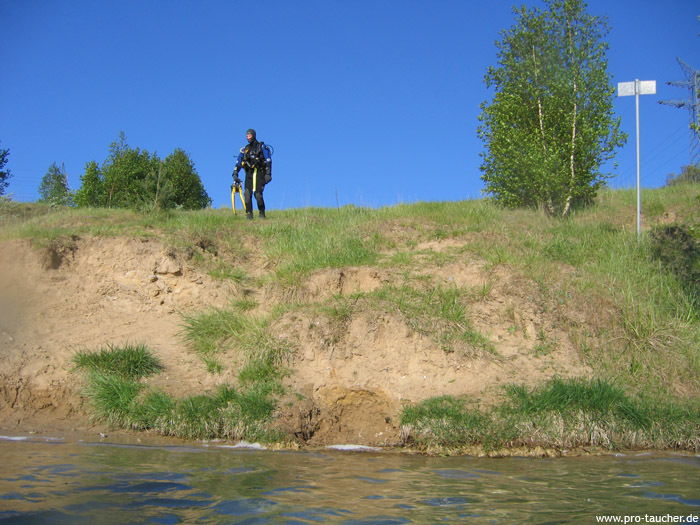 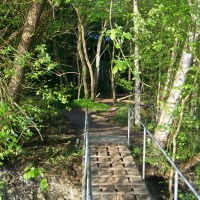 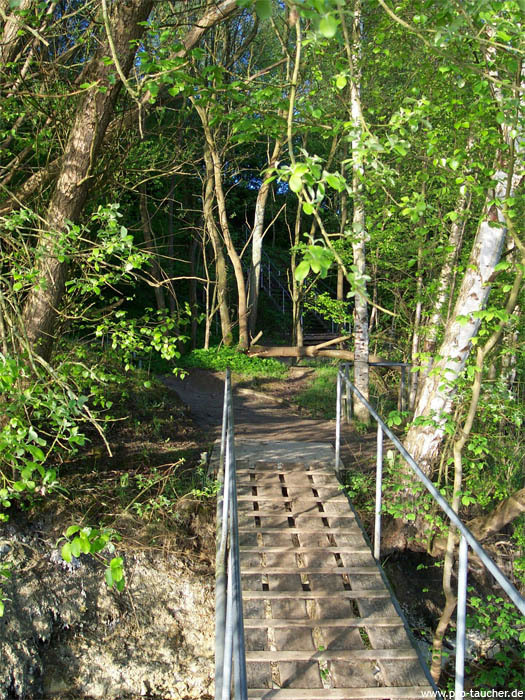 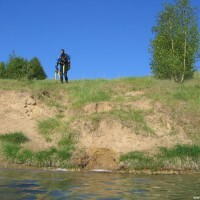 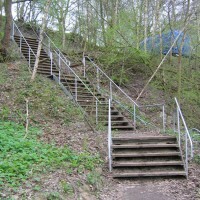 One in the Rüttler, one on the small upstream plateau and one on the side, a few meters lower than the plateau, in the direction of entry 1. 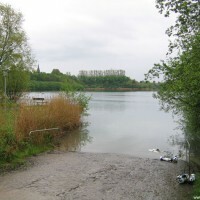 Beyond the plateau, the slope leads steeply down into the lake. 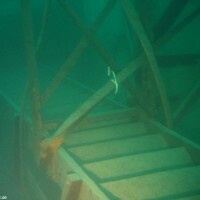 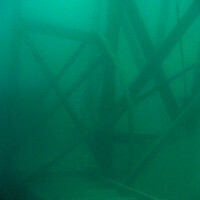 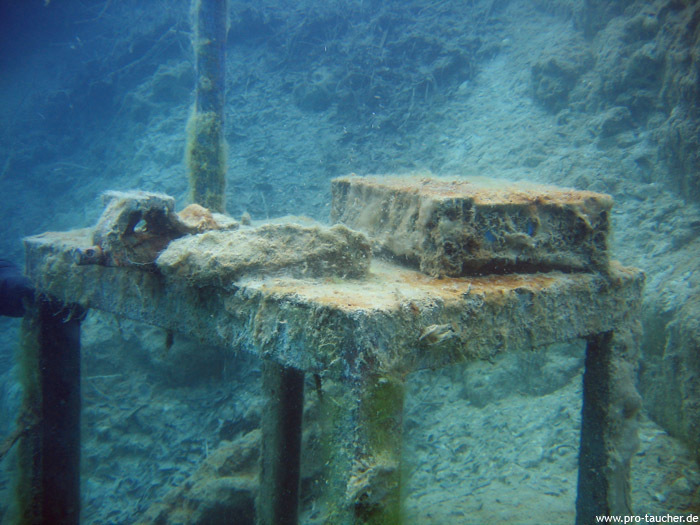 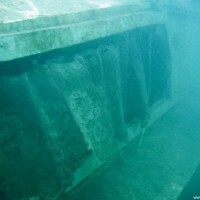 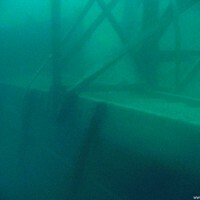 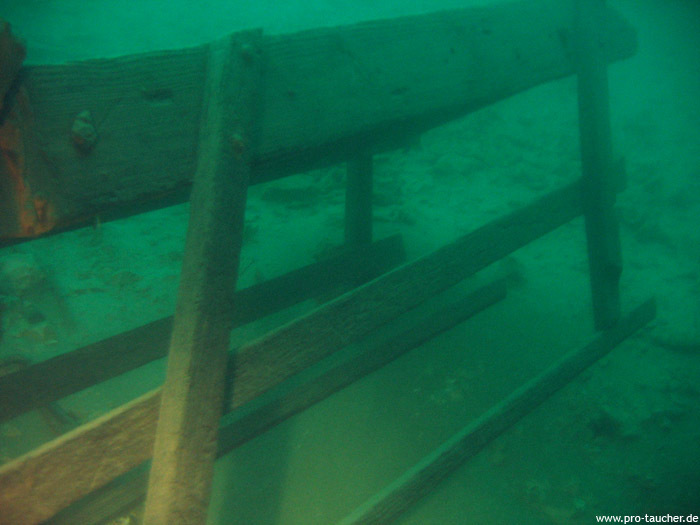 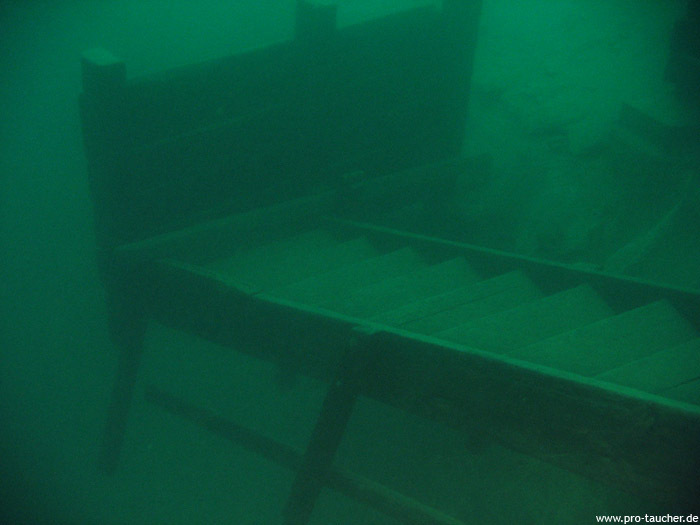 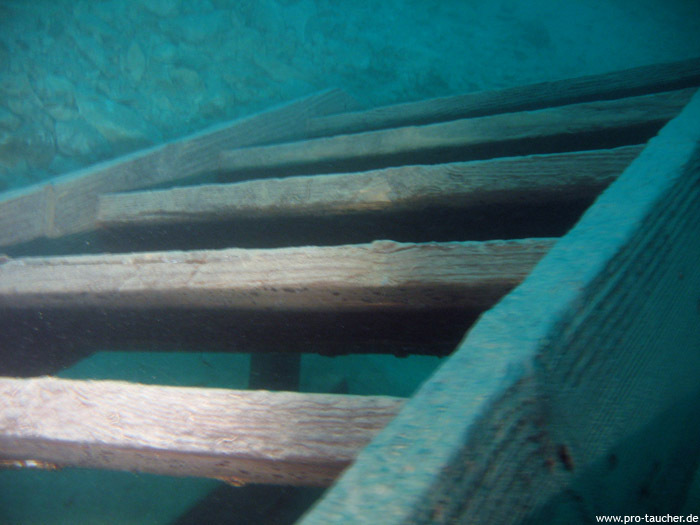 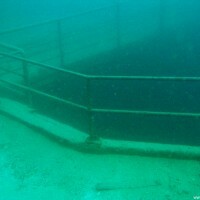 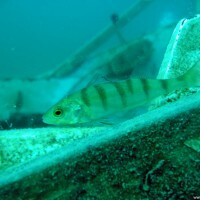 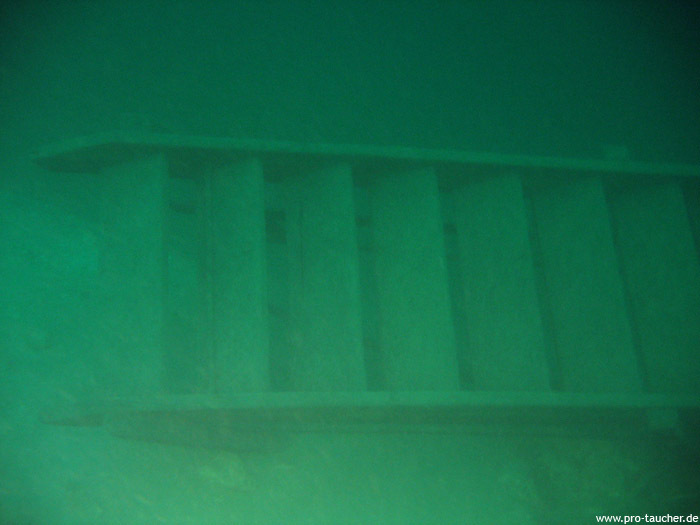 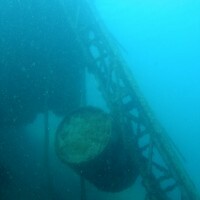 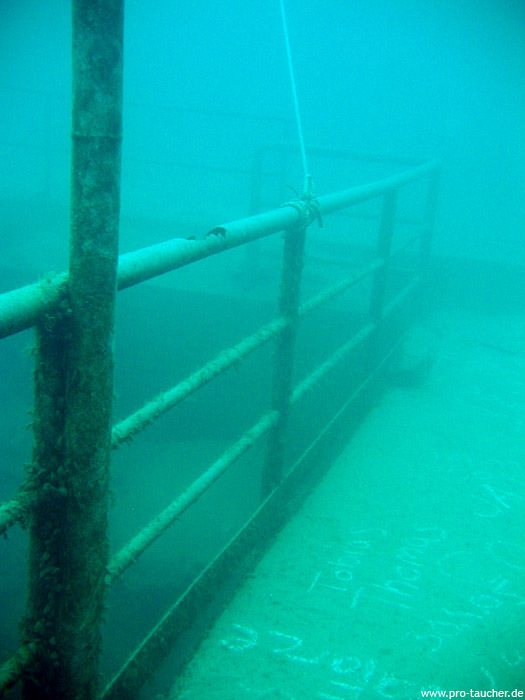 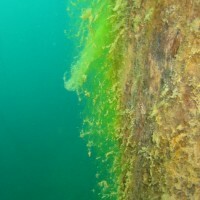 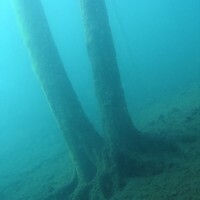 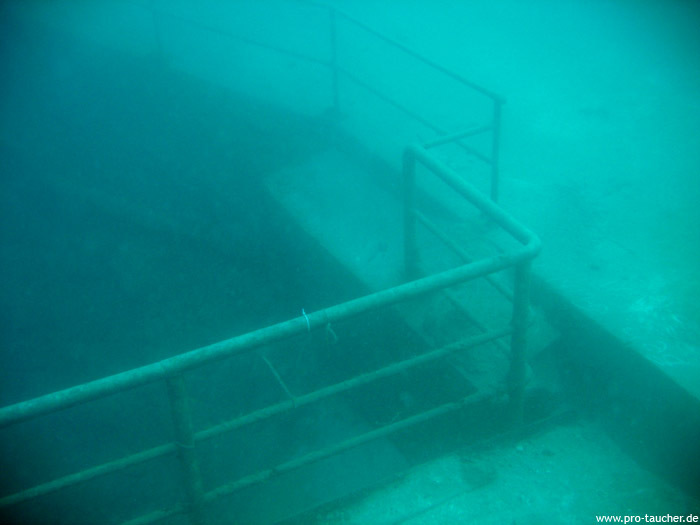 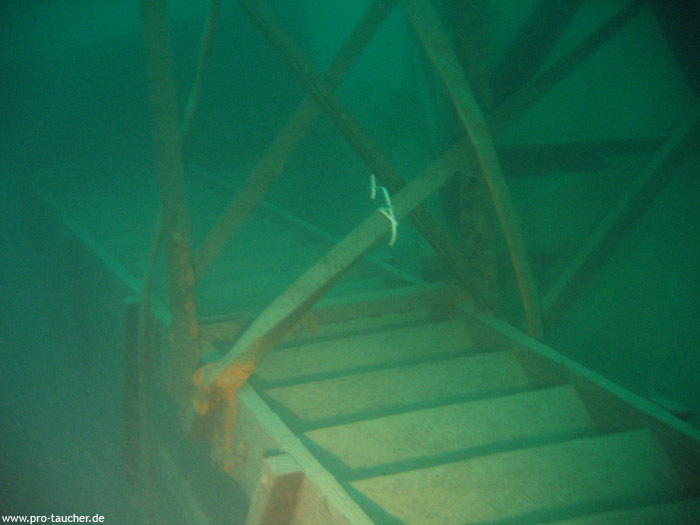 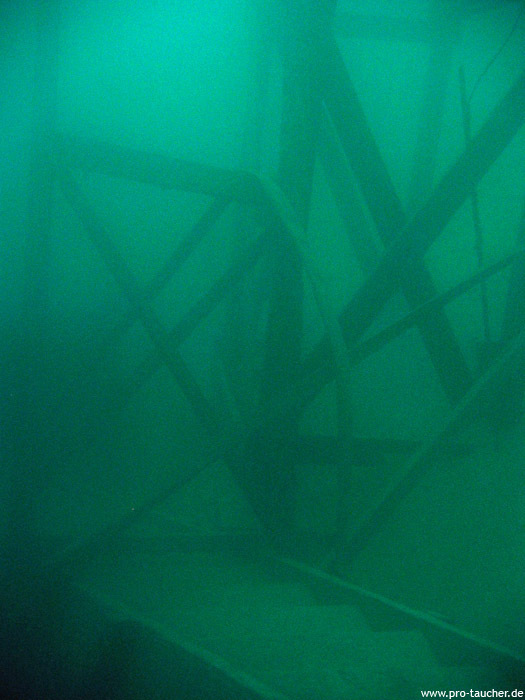 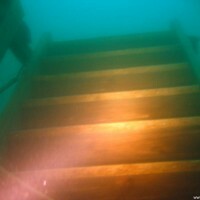 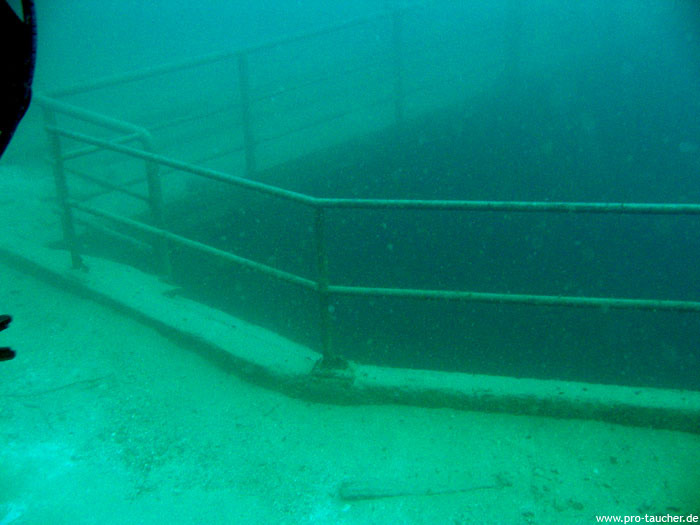 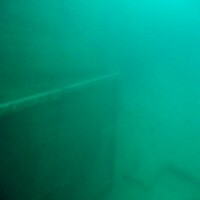 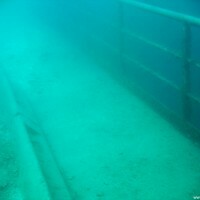 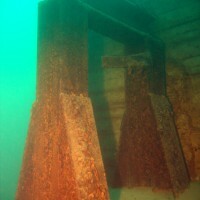  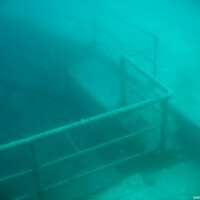 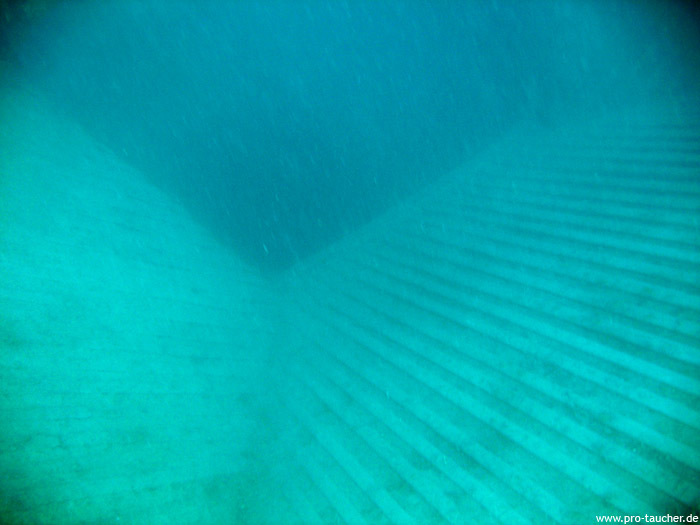 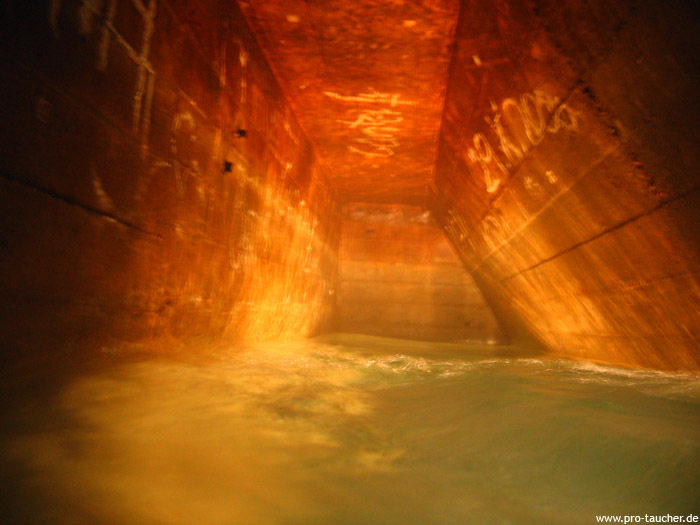 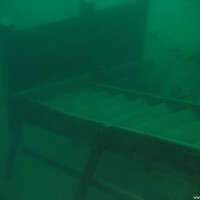 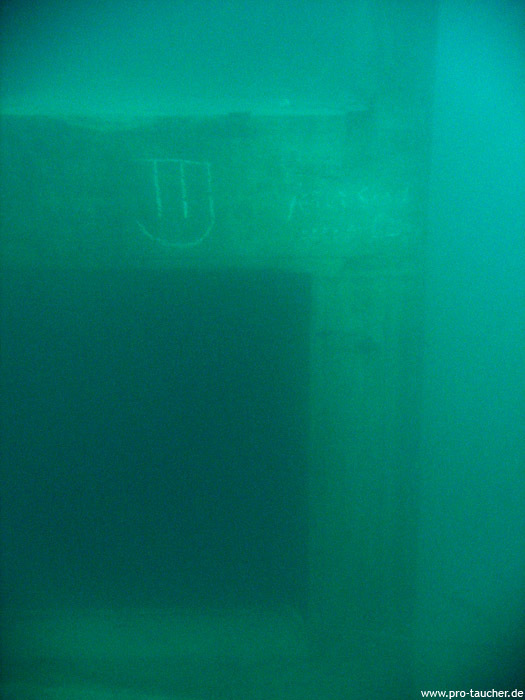 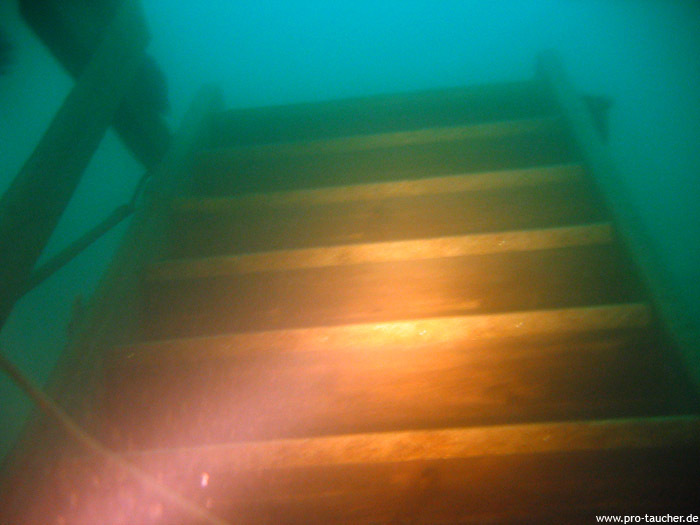 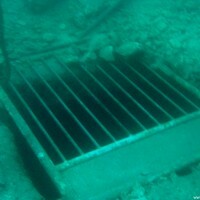 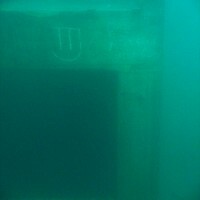 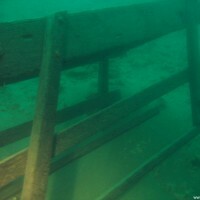 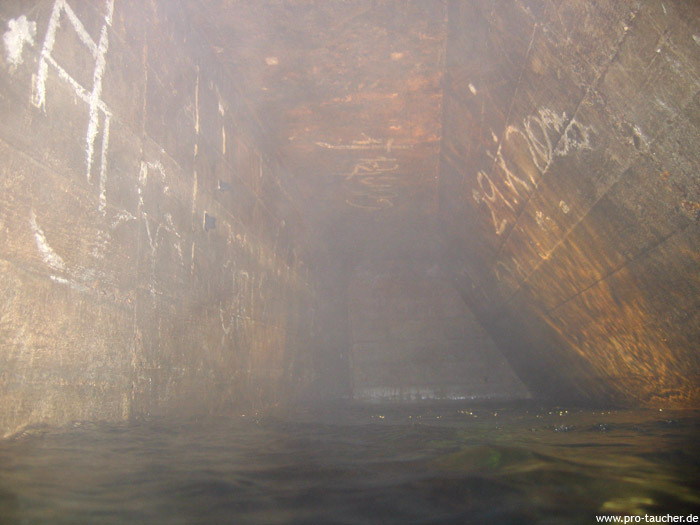 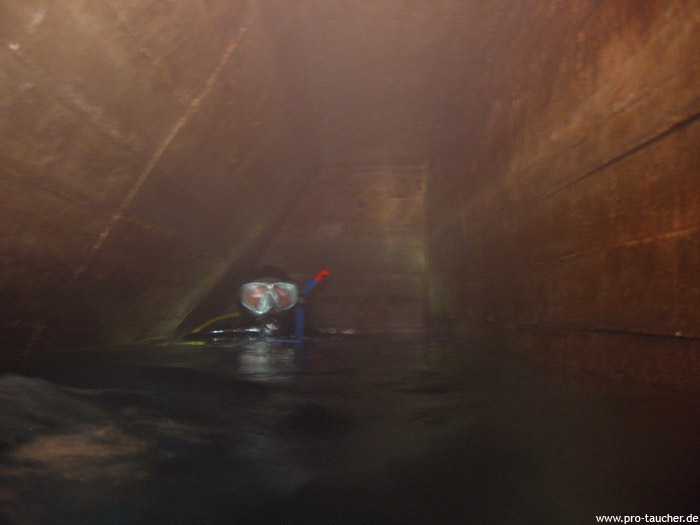 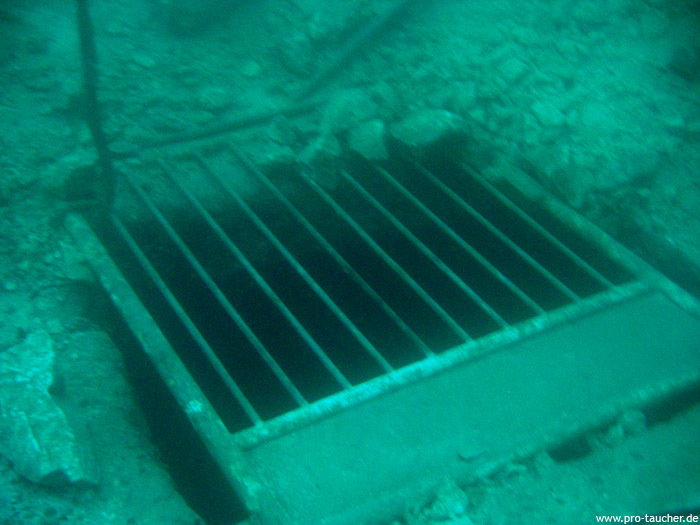 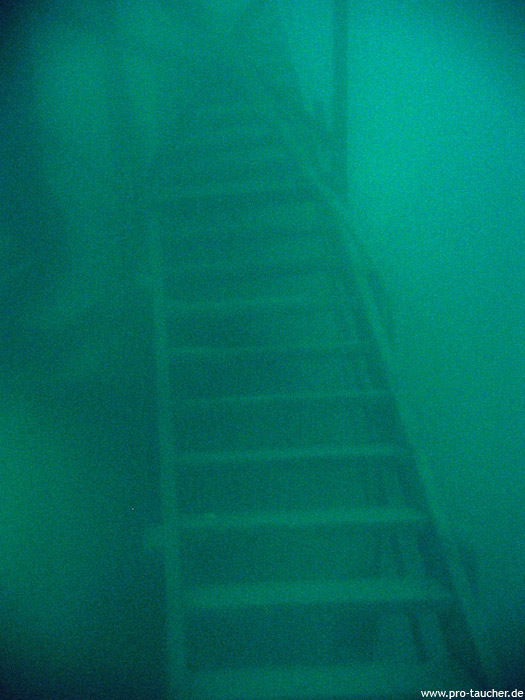 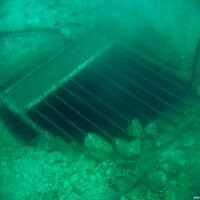 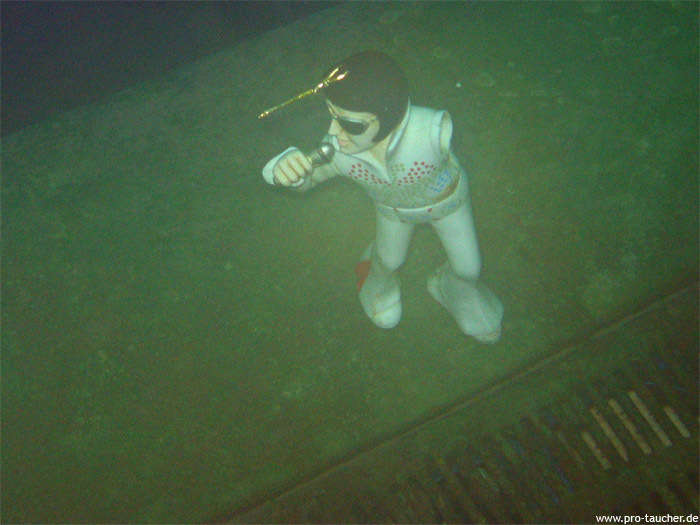 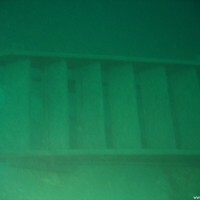 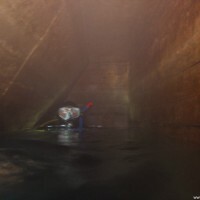 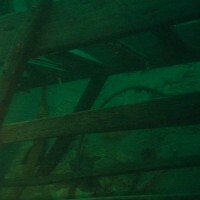 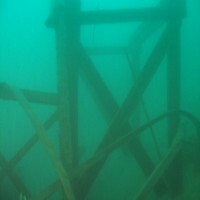 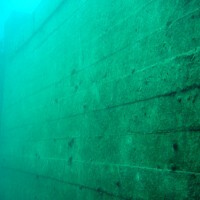 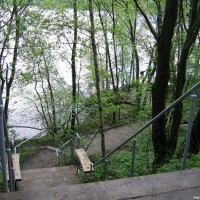 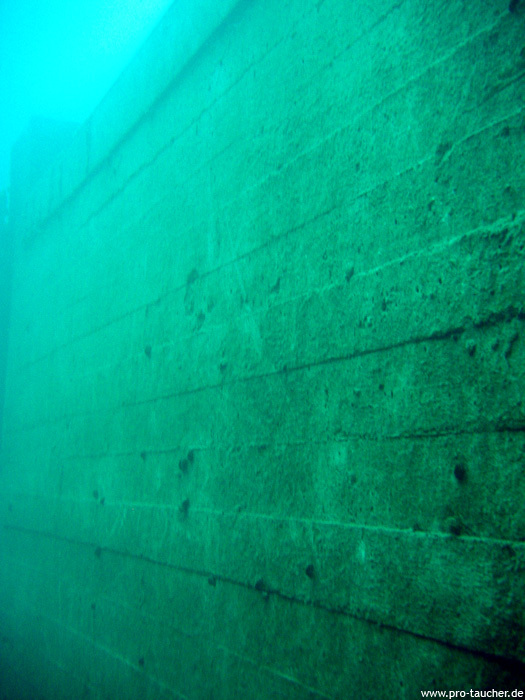 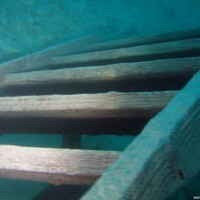 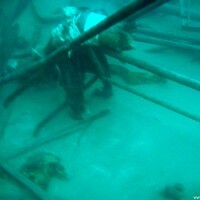 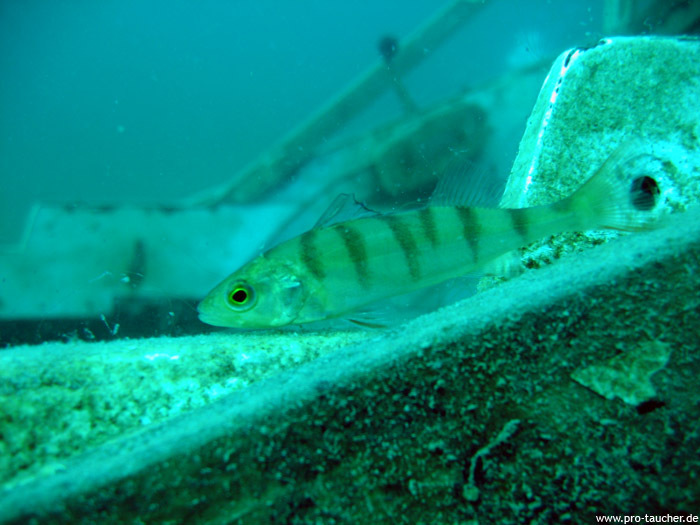 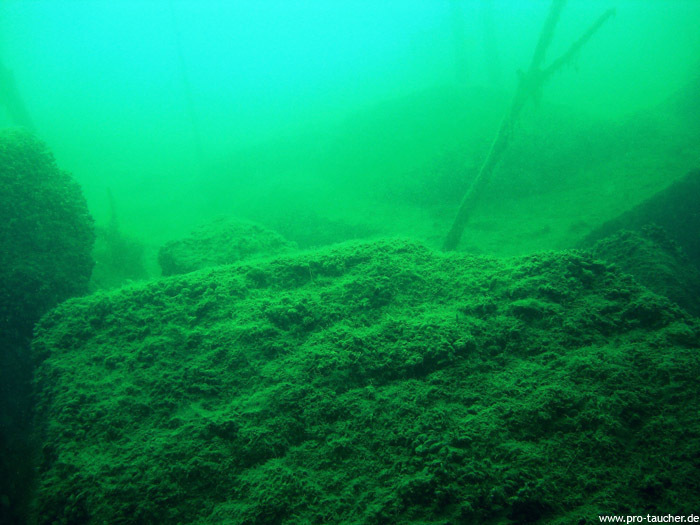 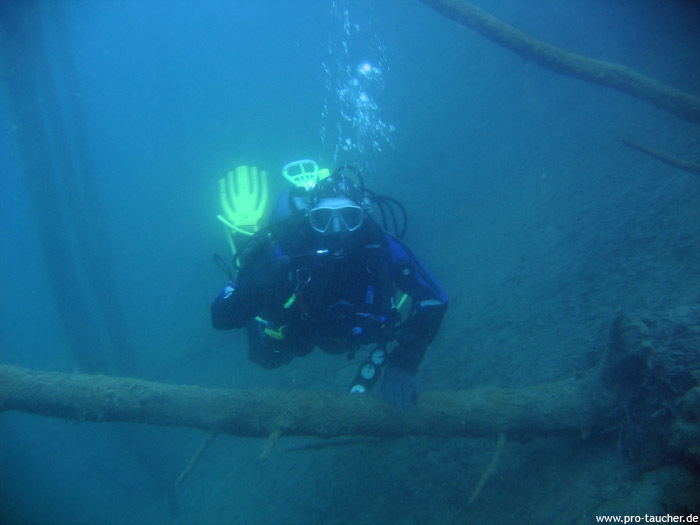 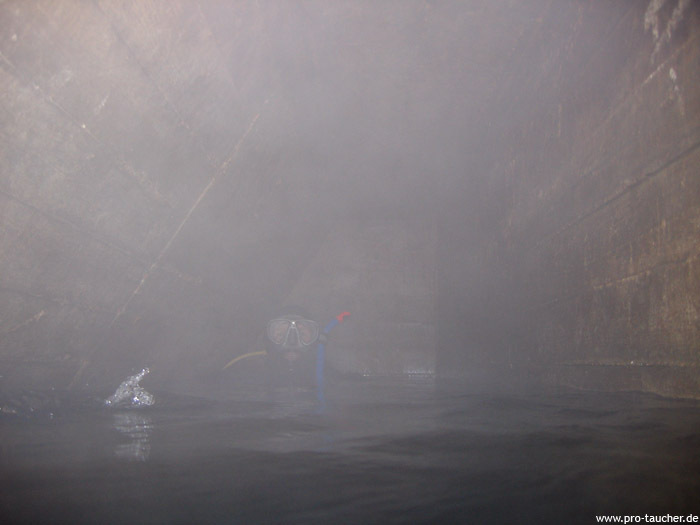 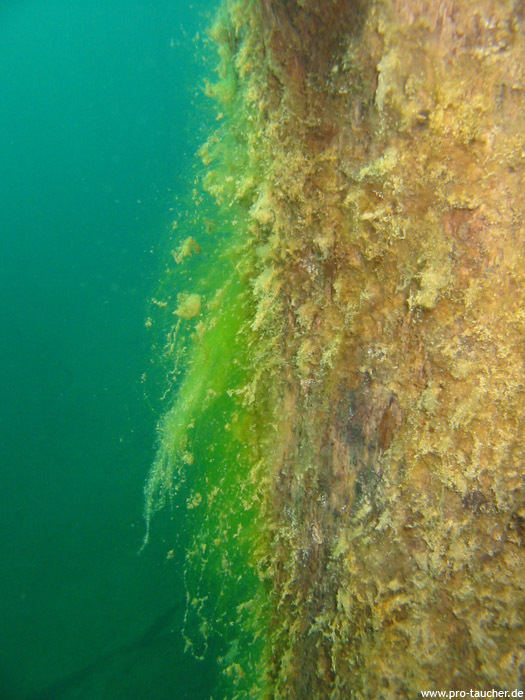 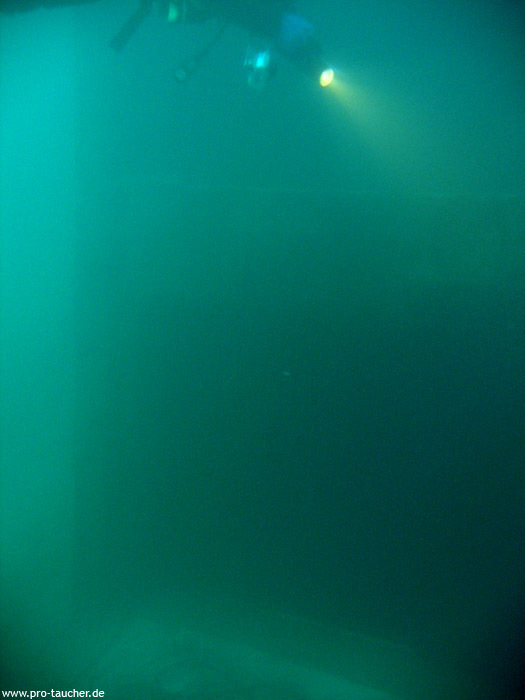 Here, 43 and 53 meters deep, are well-preserved wooden stairs. 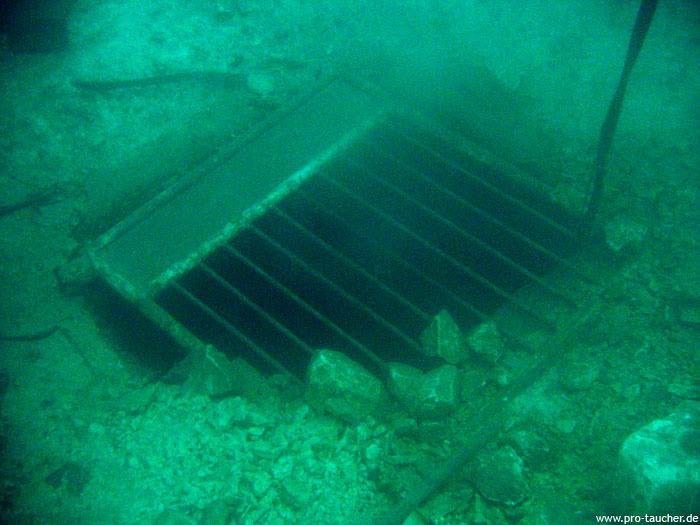 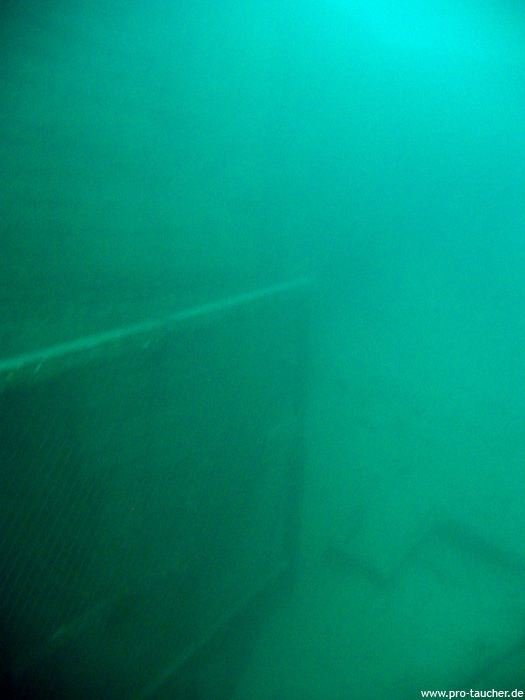 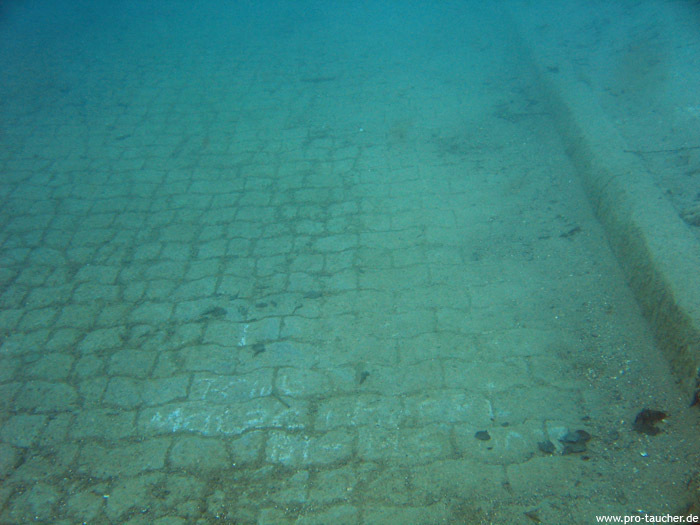 In the shallow water on the slope in the direction of entry 4 there are plenty of steel mats that used to be used to fortify the slope. 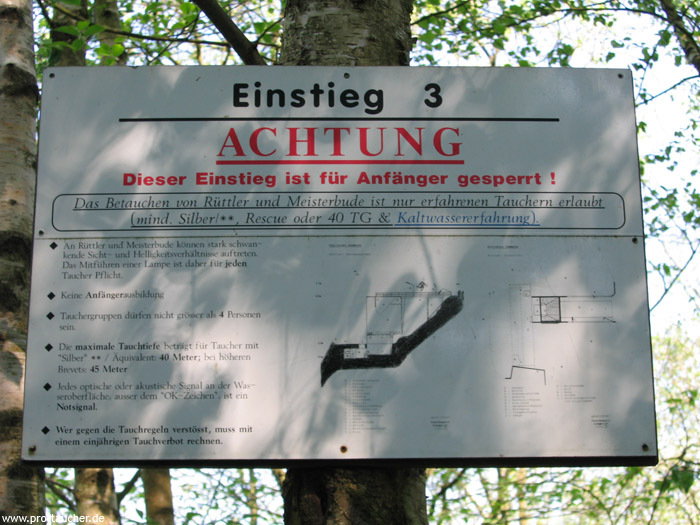 Entry 4: At this entrance, you have to take a short walk of about 3-5 minutes. 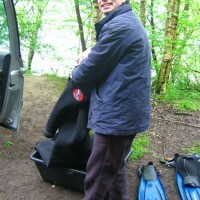 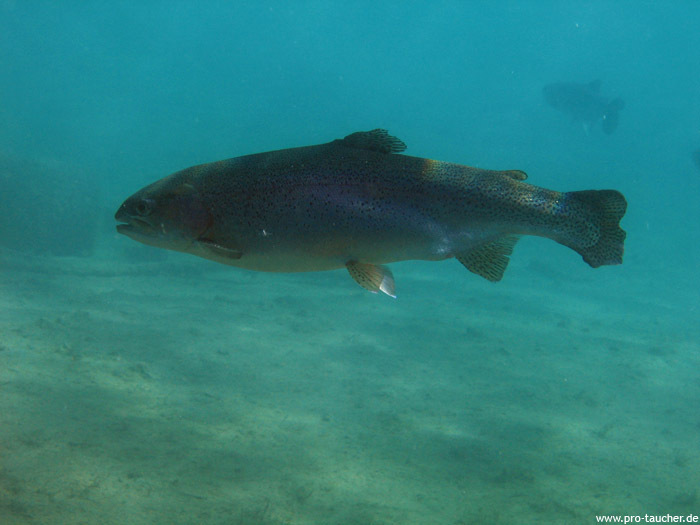 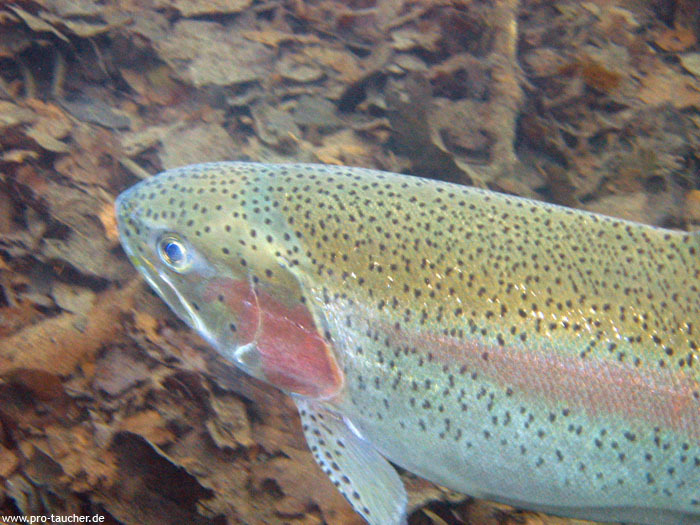 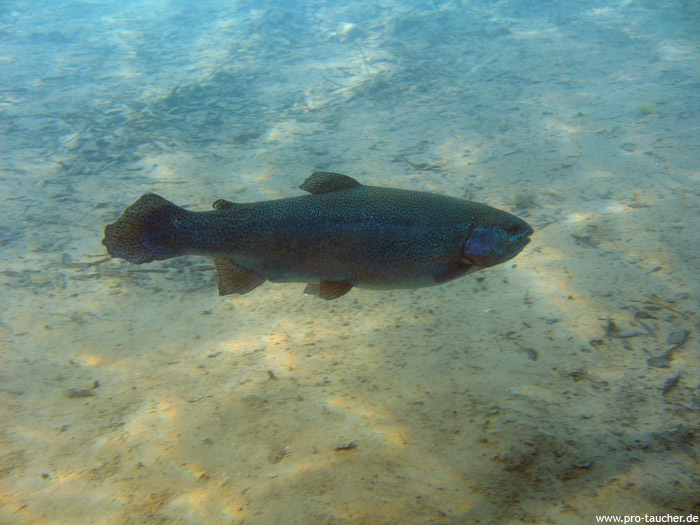 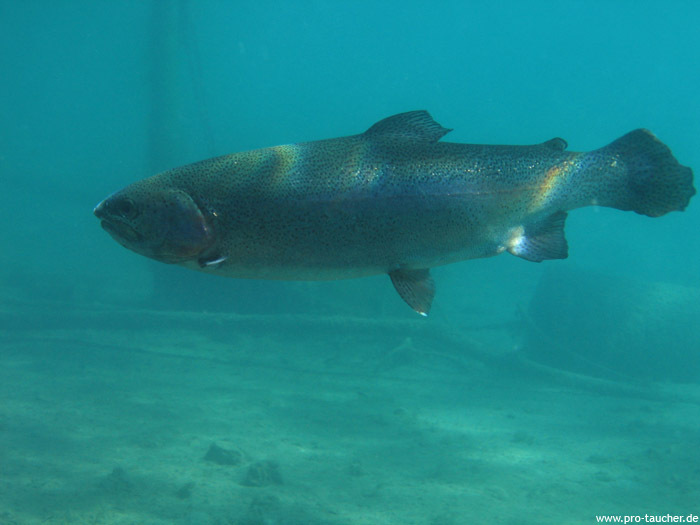 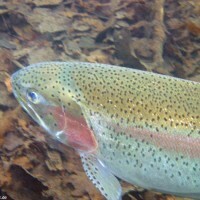 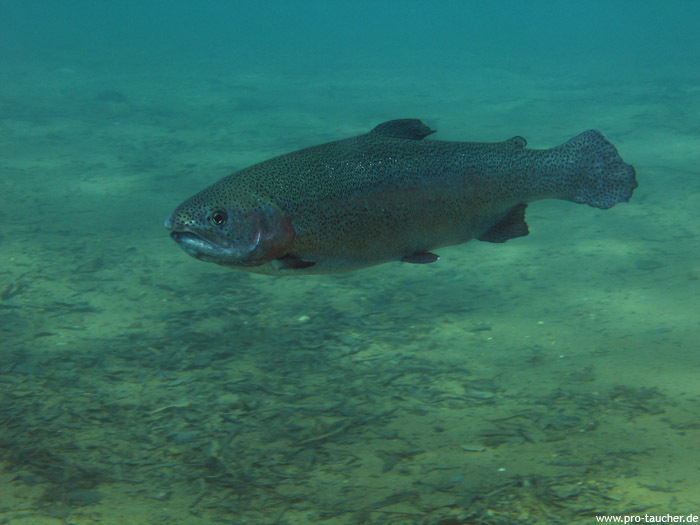 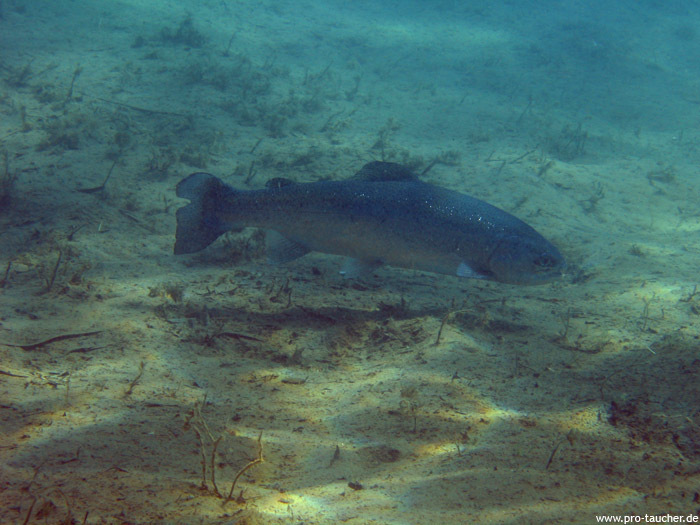 Putting on the fins can be comfortably done sitting in the water on the small sandy beach. 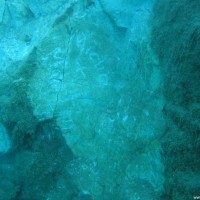 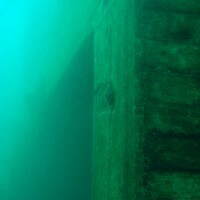 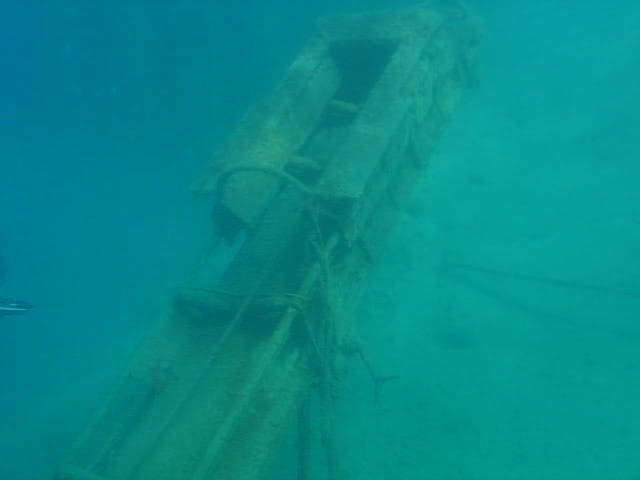 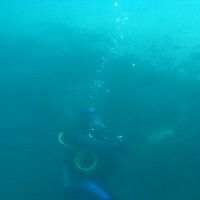 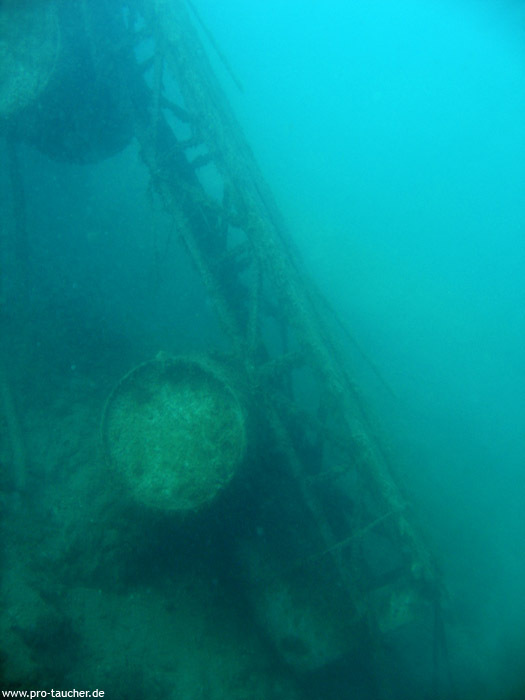 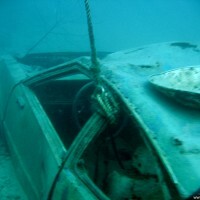 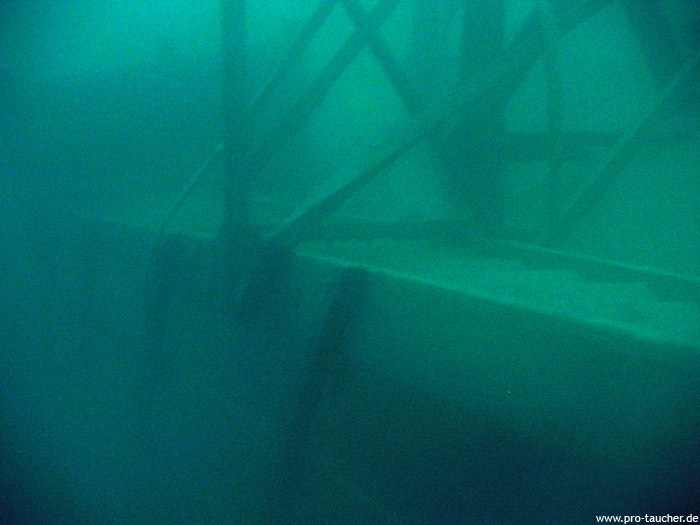 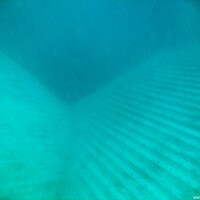 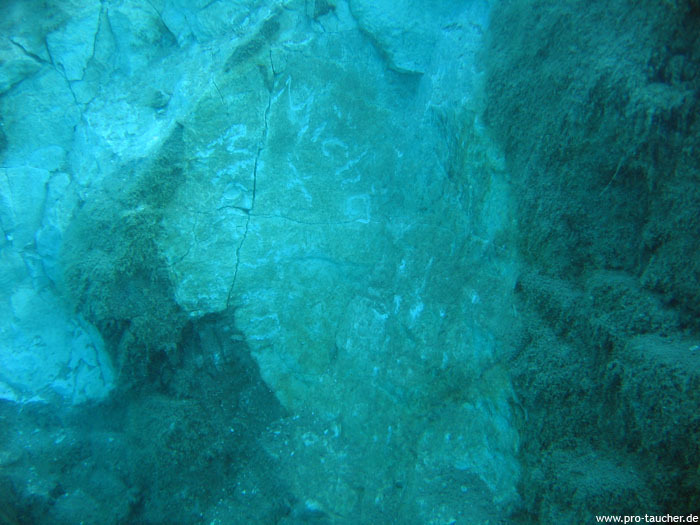 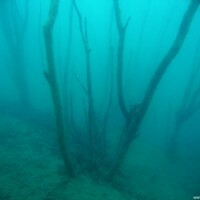 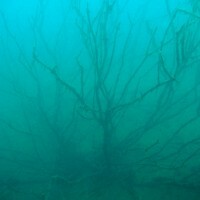 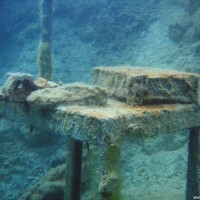 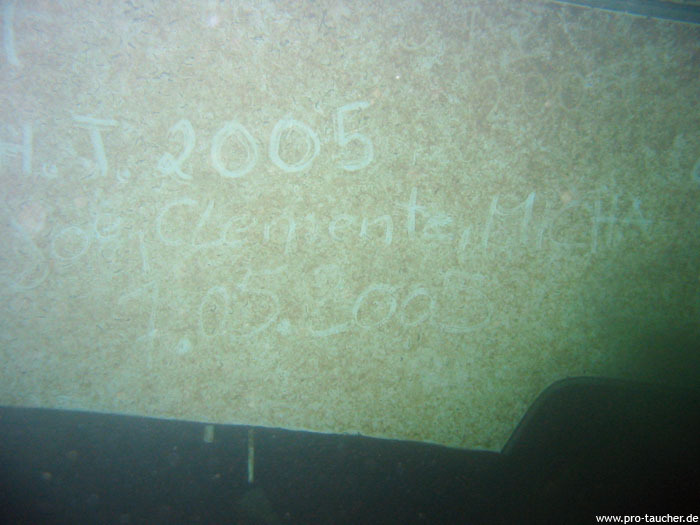 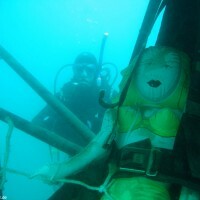 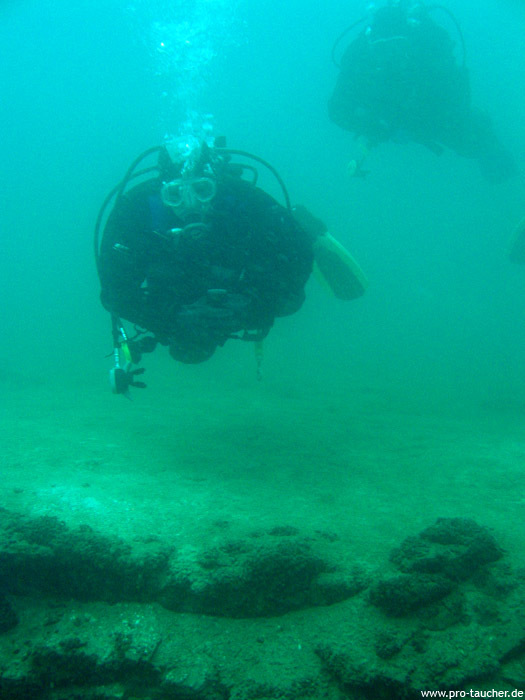 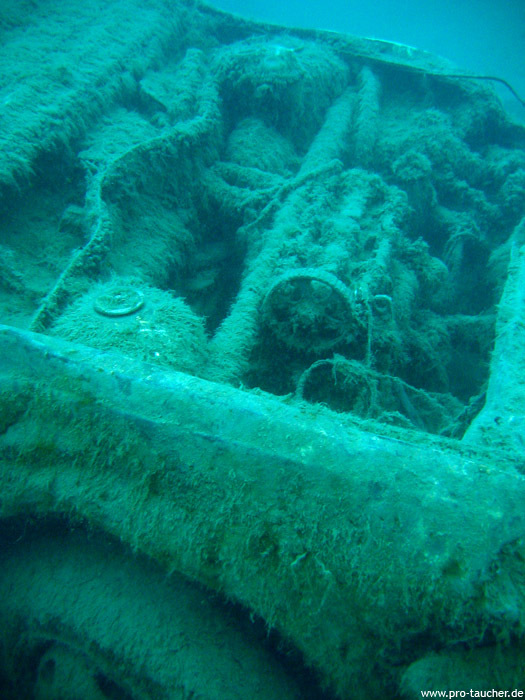 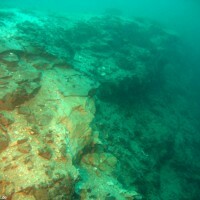 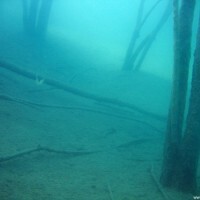 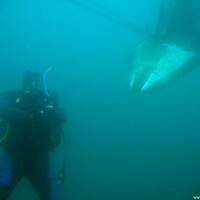 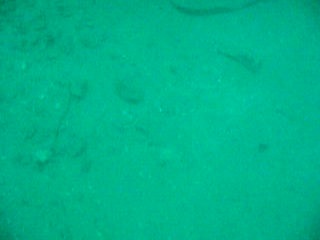 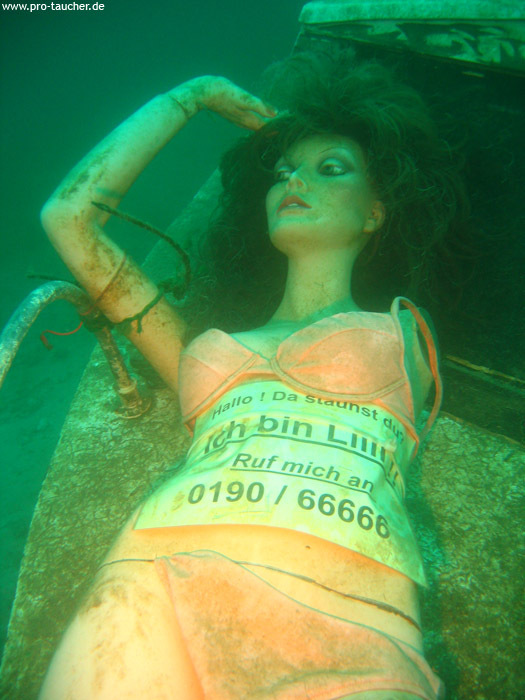 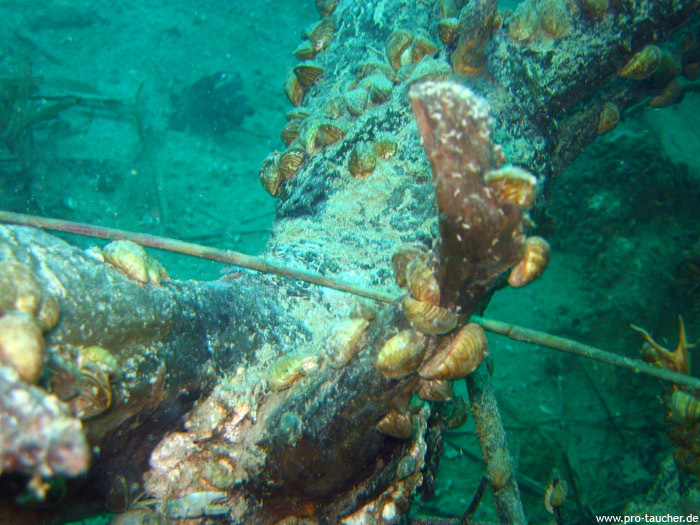 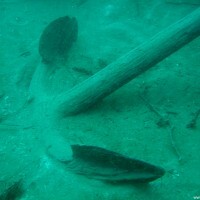 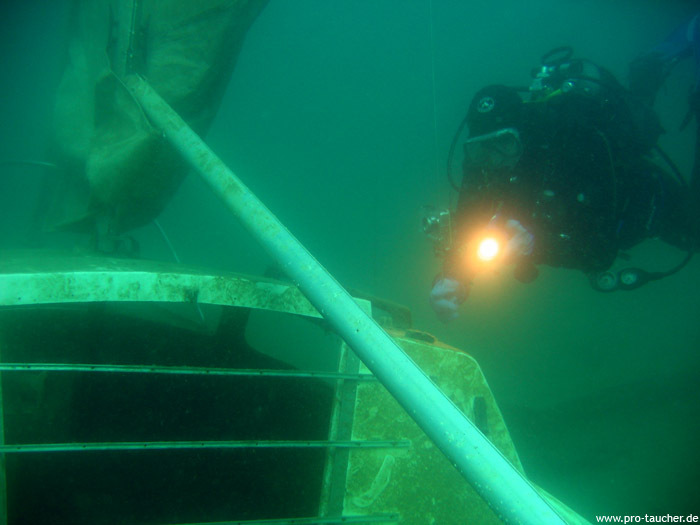 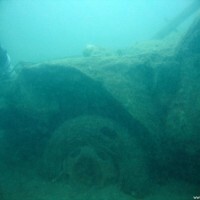 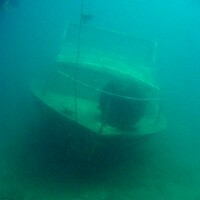 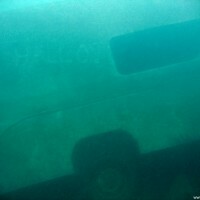 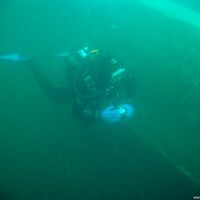 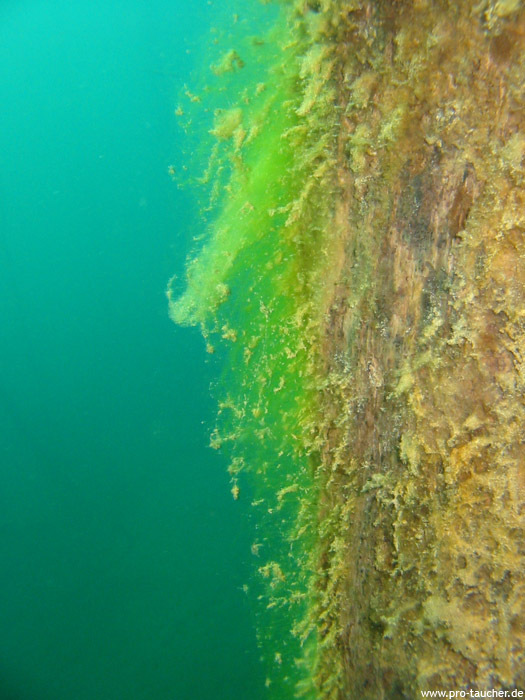 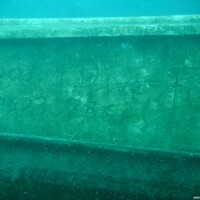 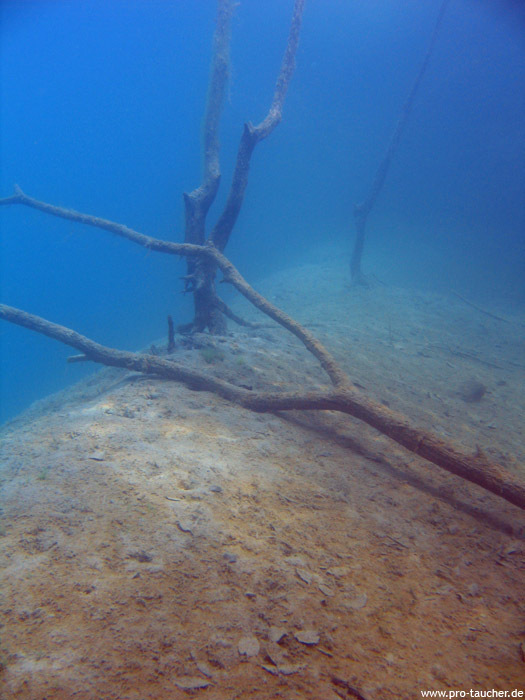 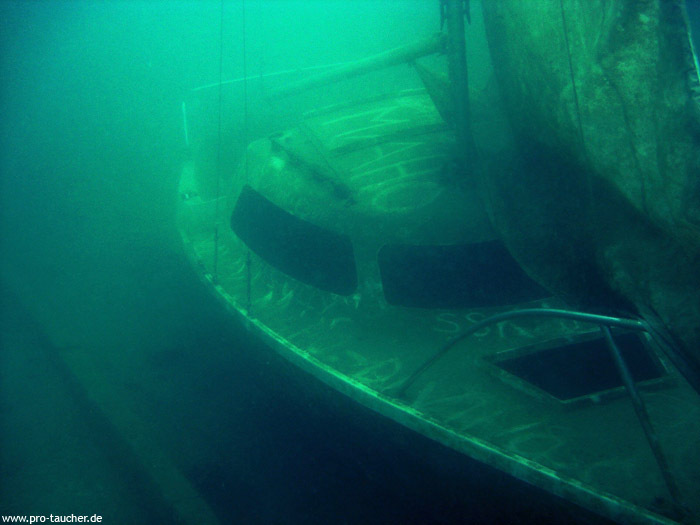 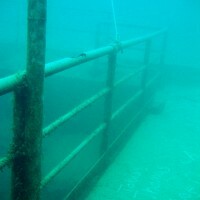 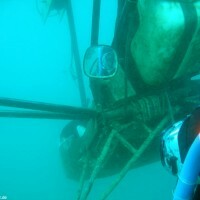 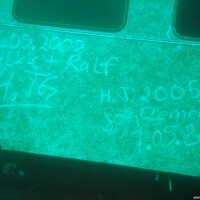 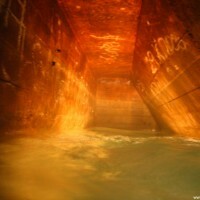 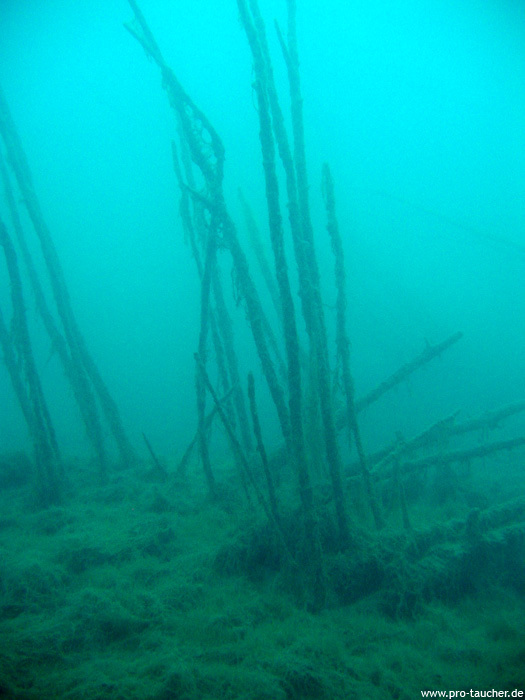 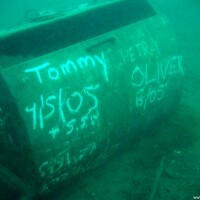 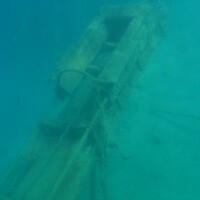 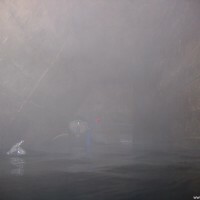 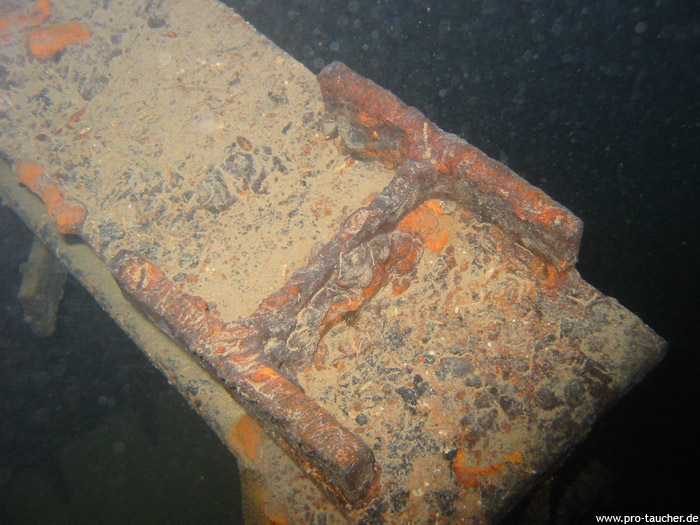 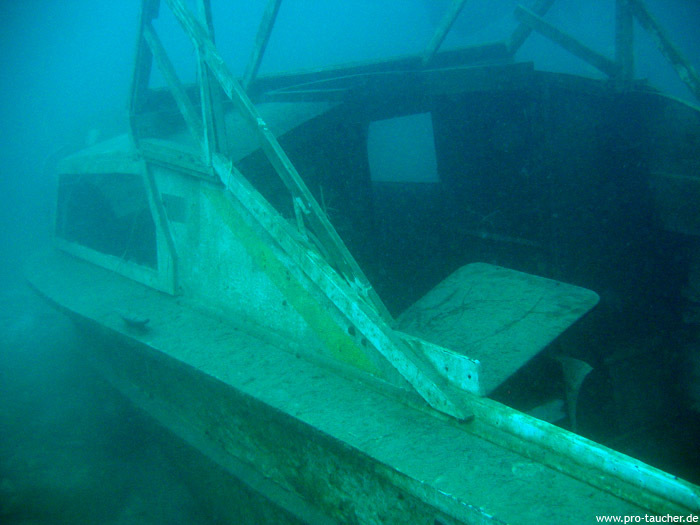 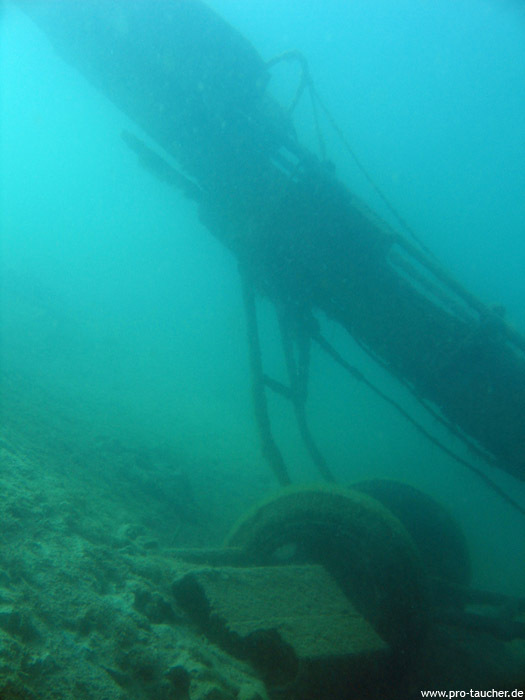 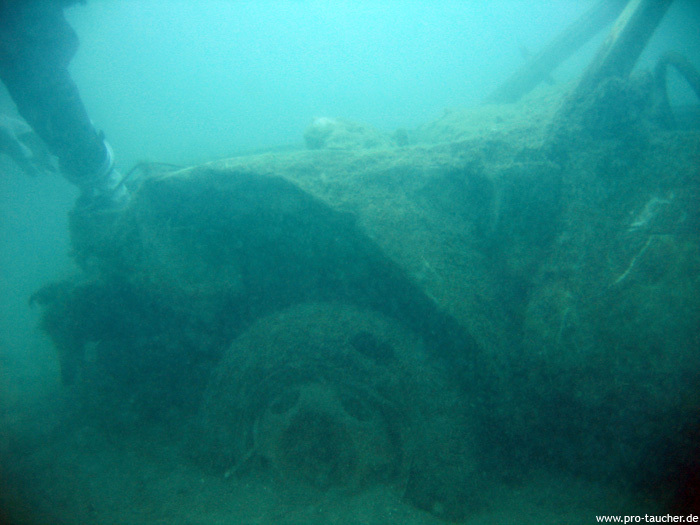 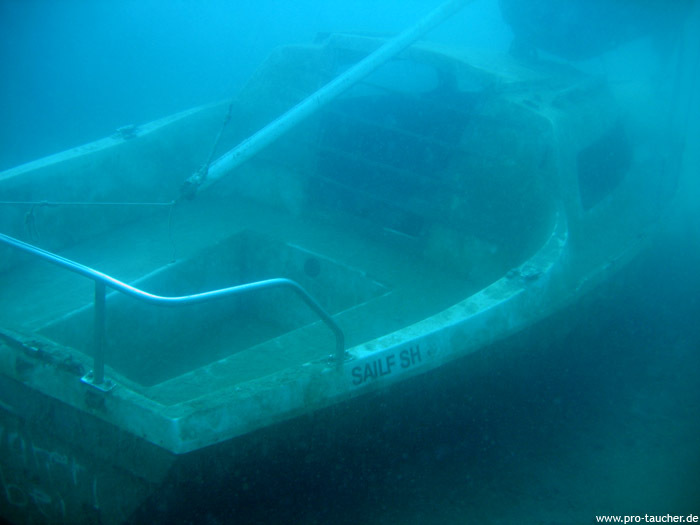 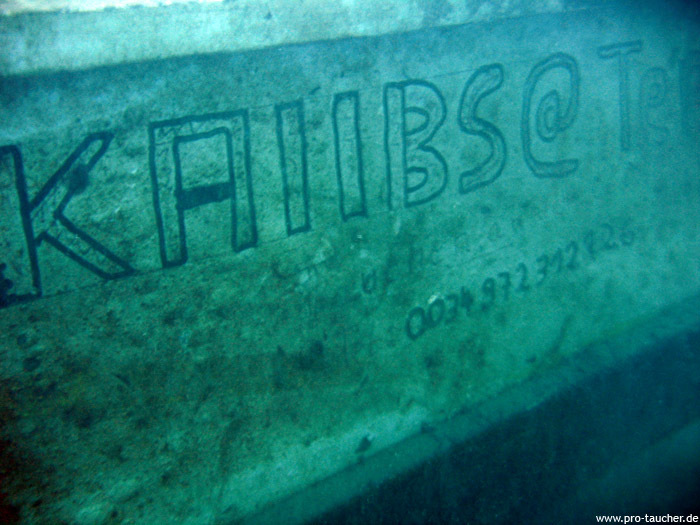 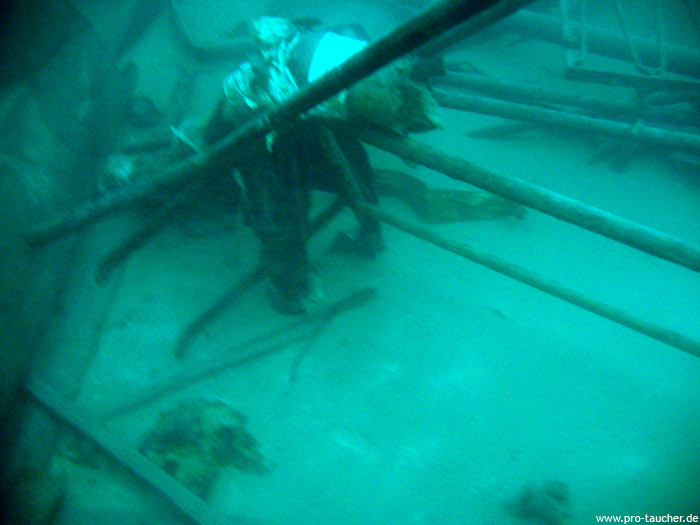 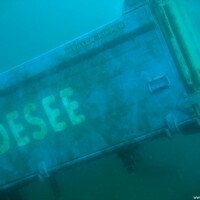 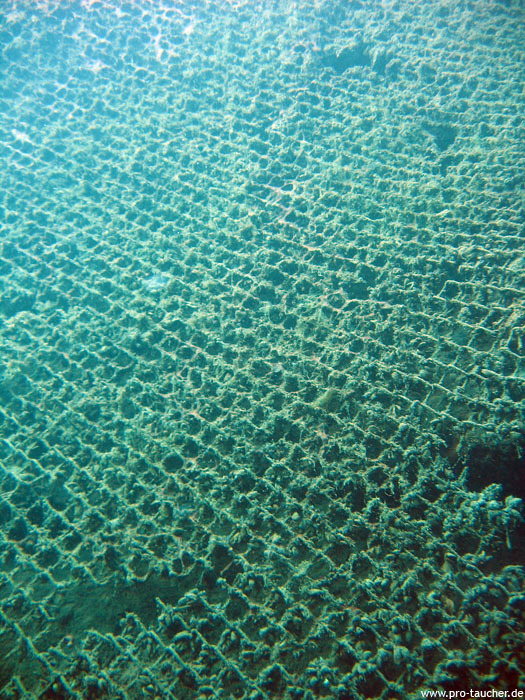 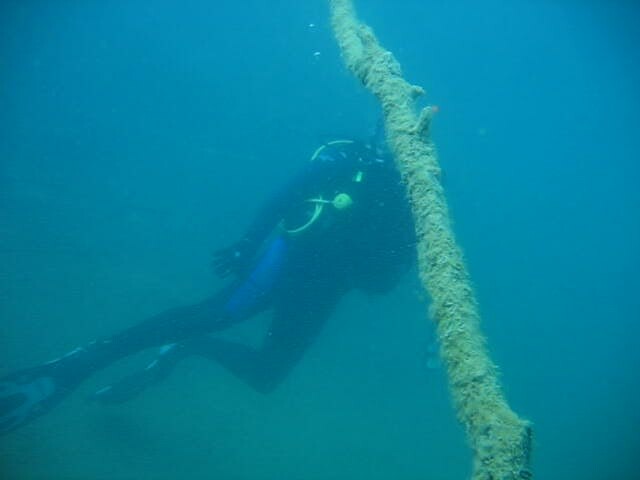 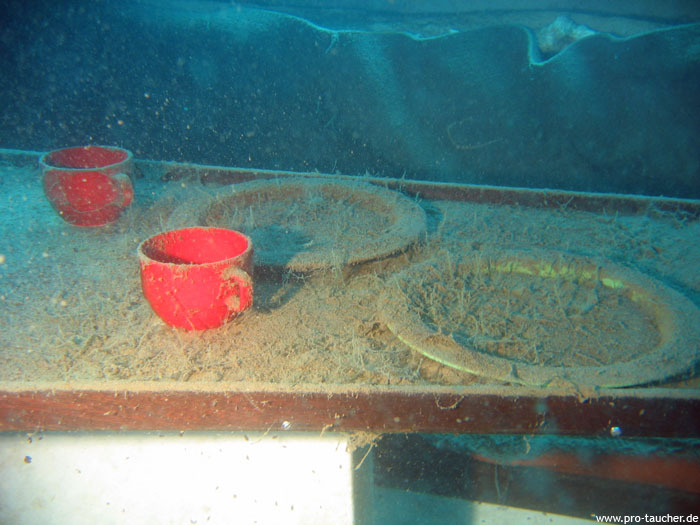 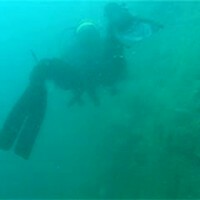 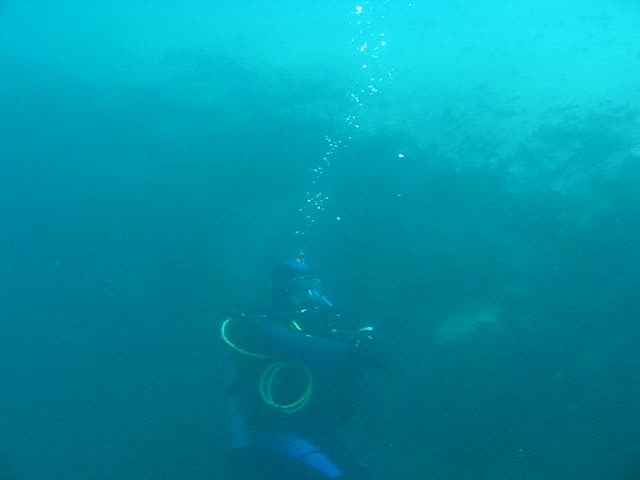 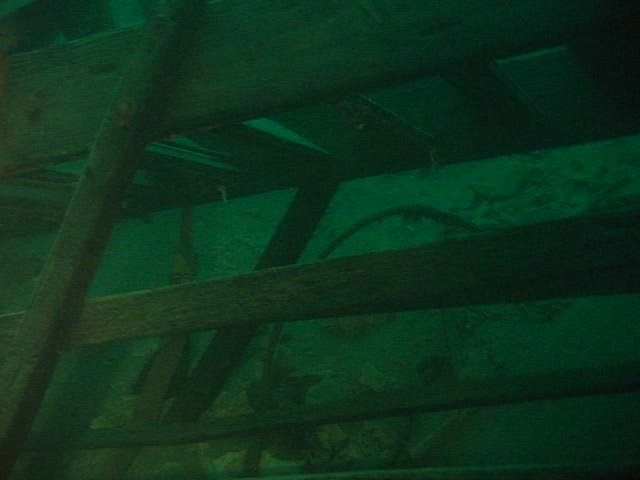 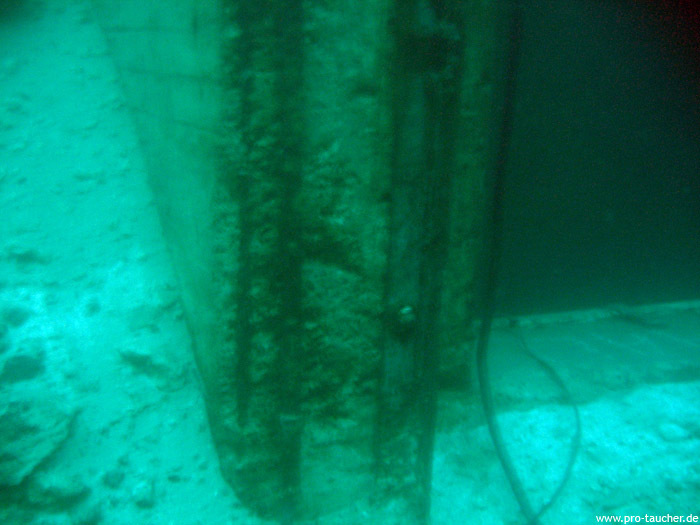 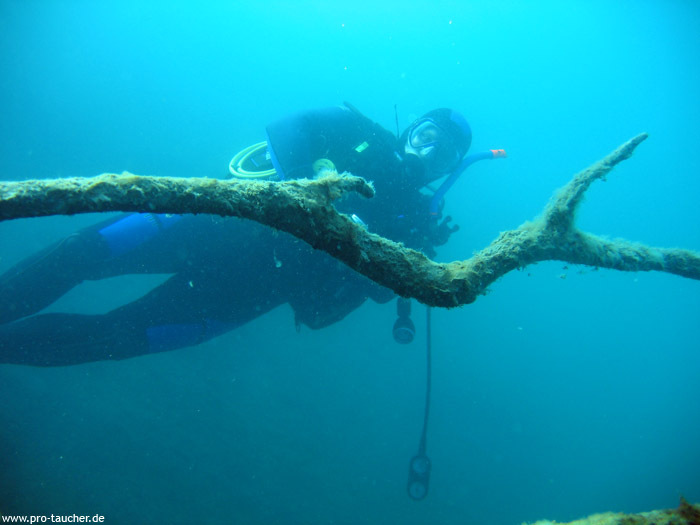 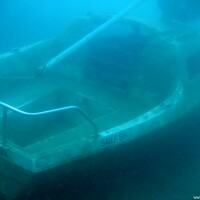 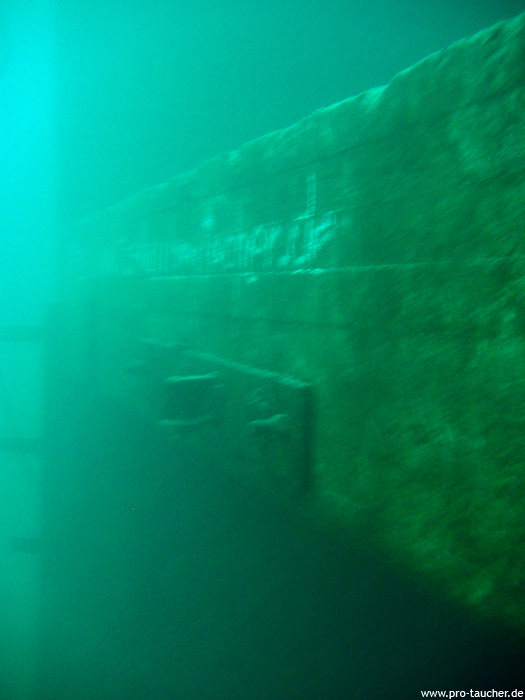 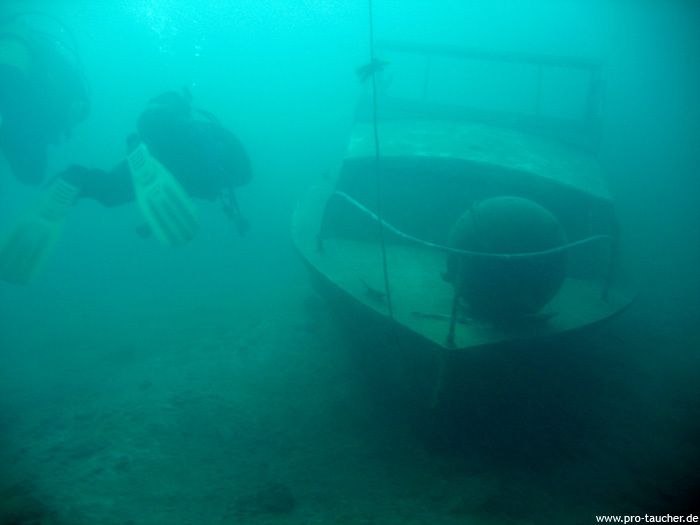 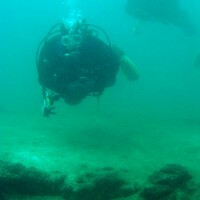 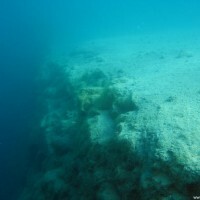 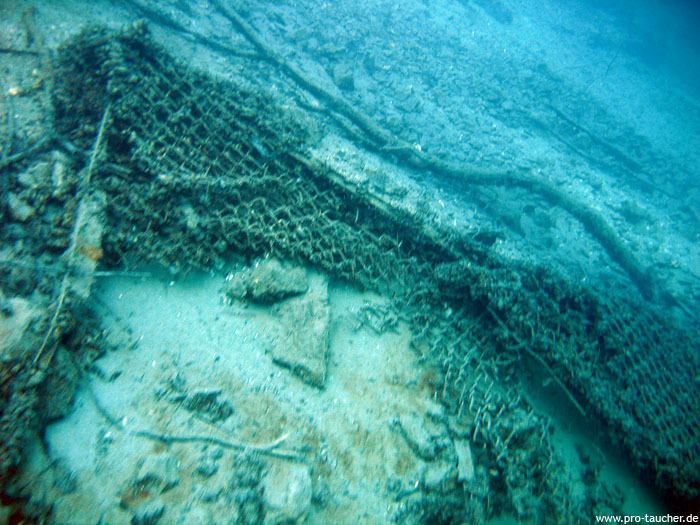 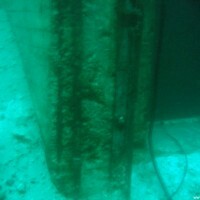 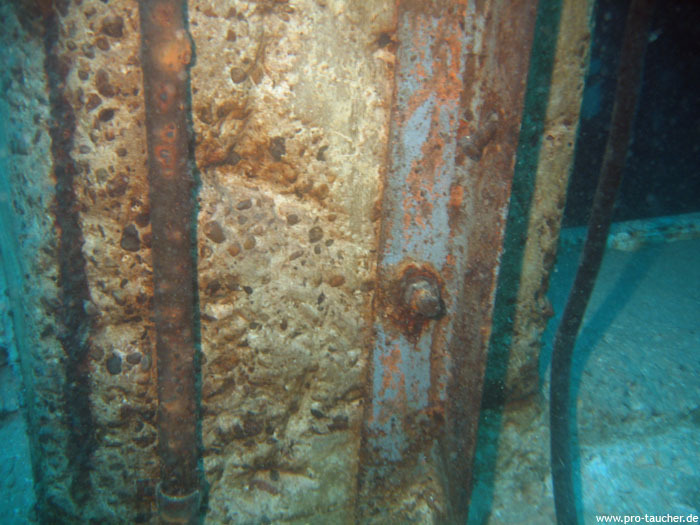 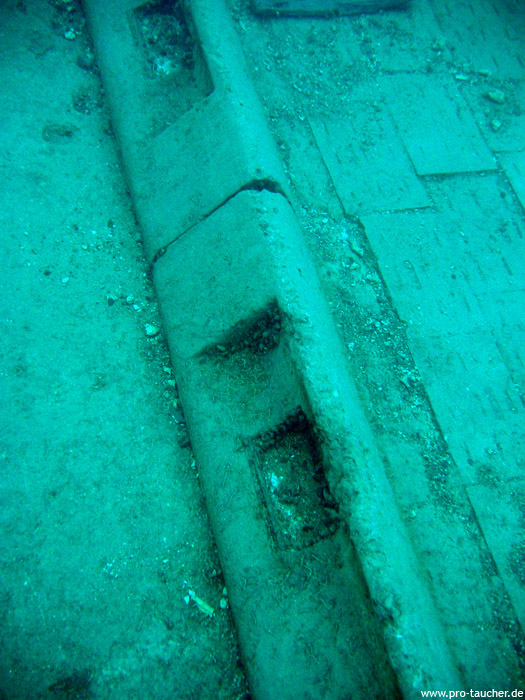 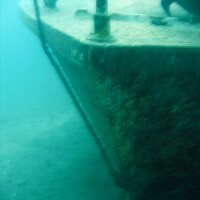 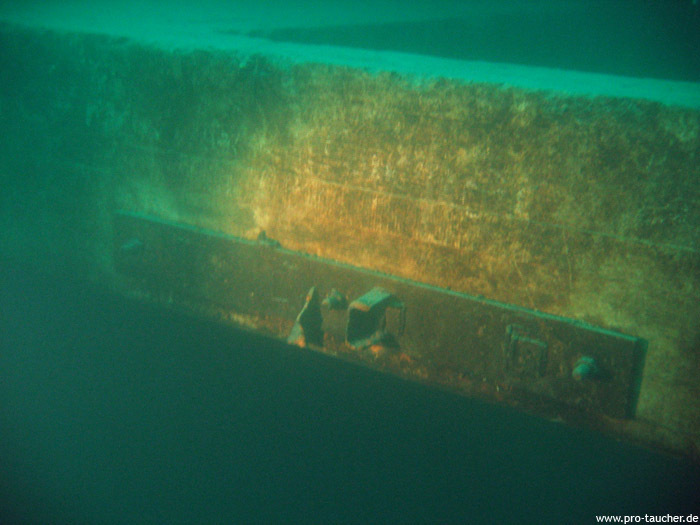 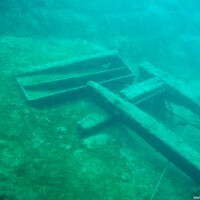 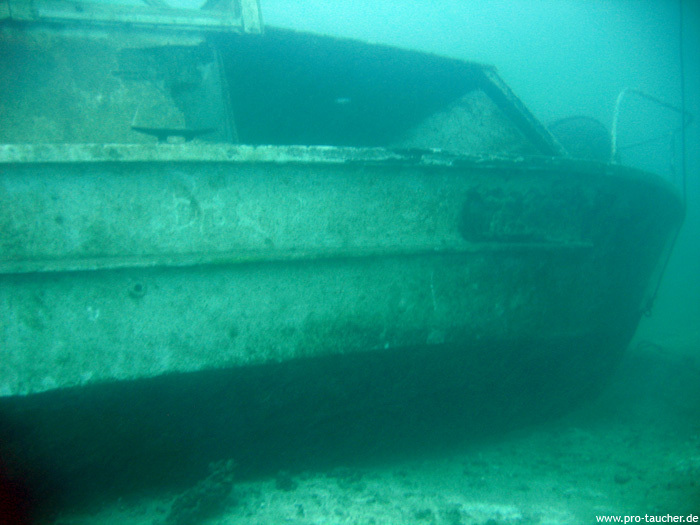 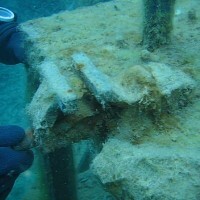 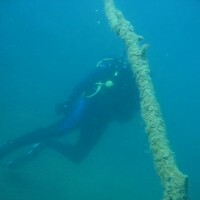 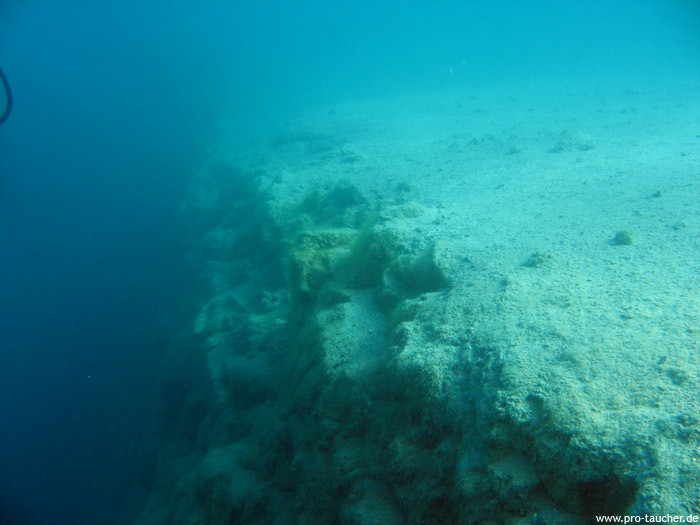 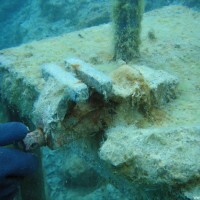 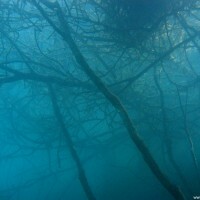 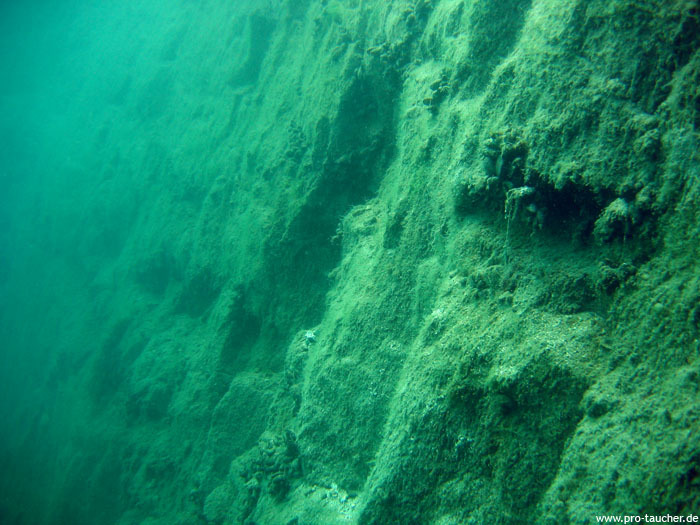 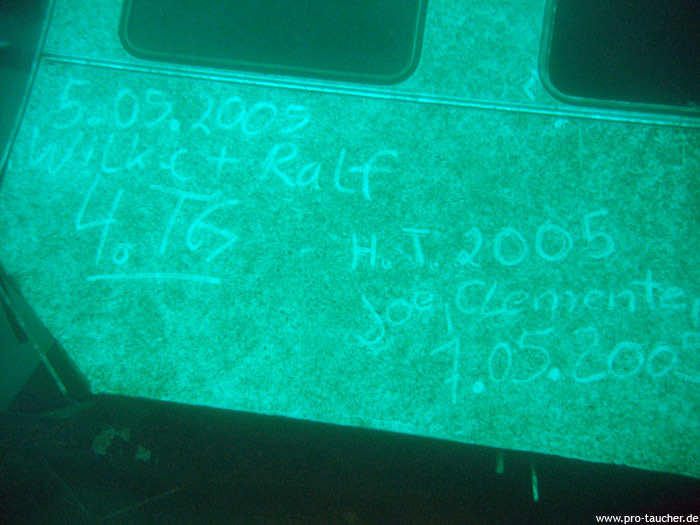 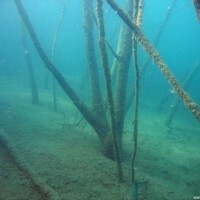 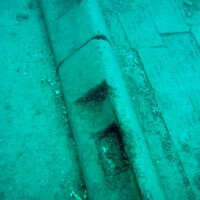 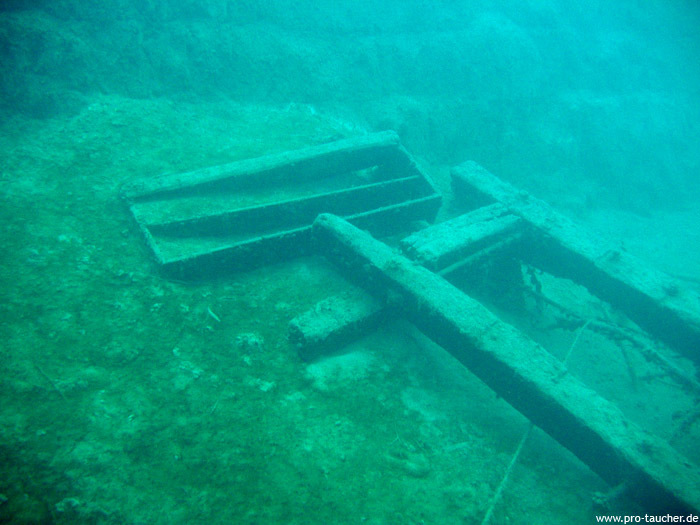 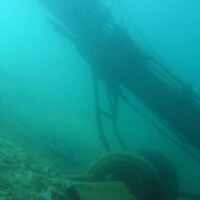 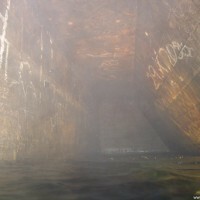 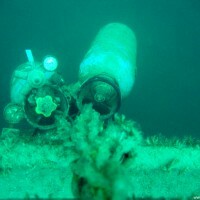 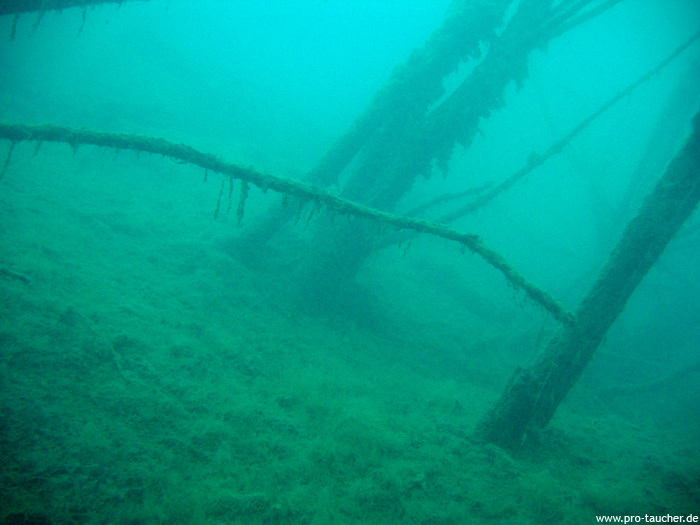 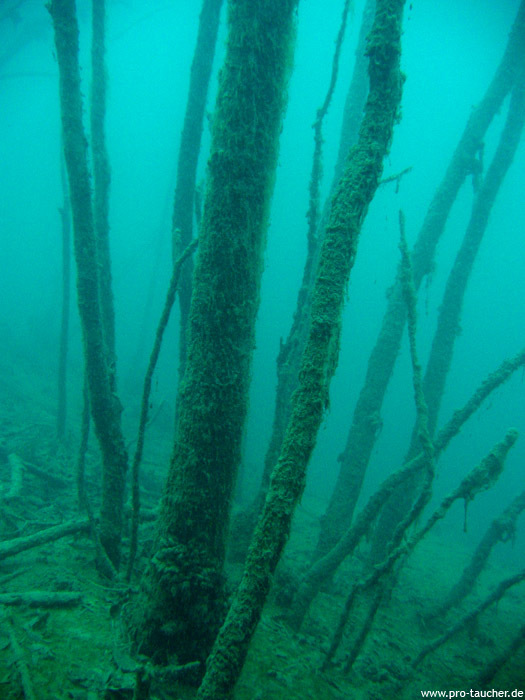 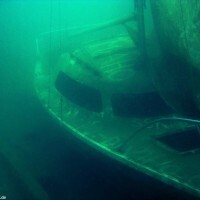 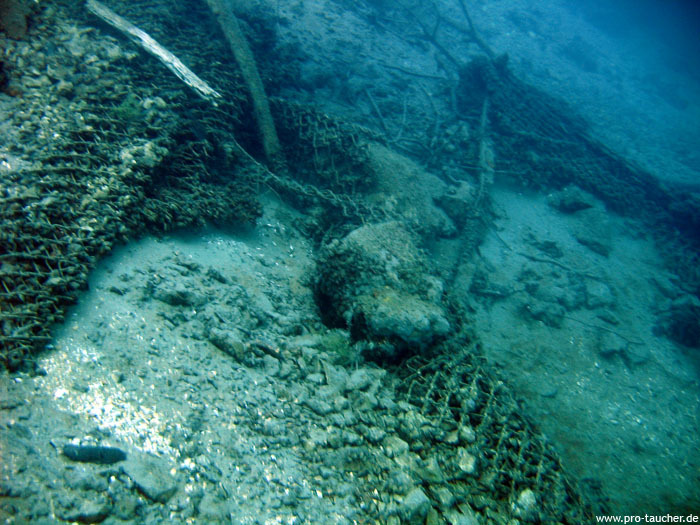 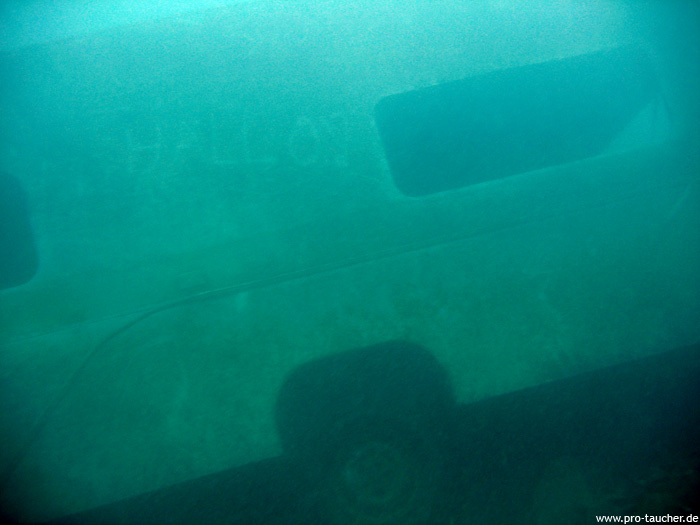 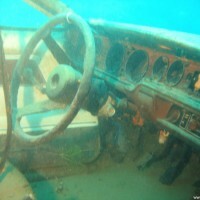 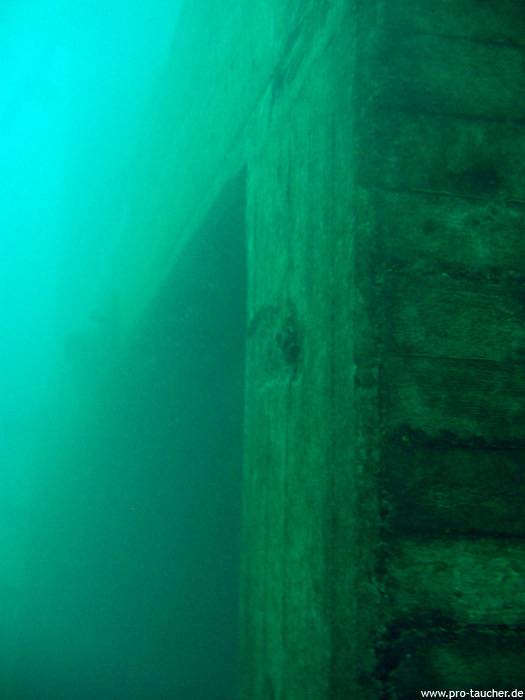 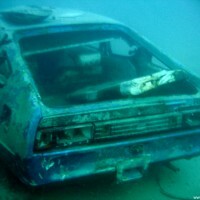 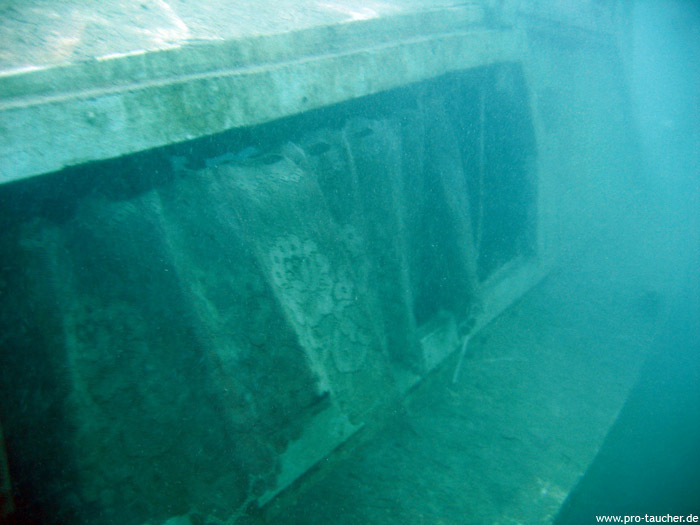 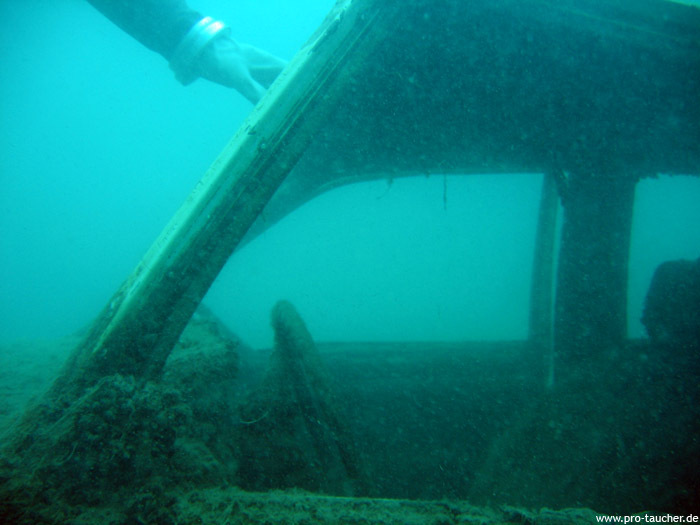 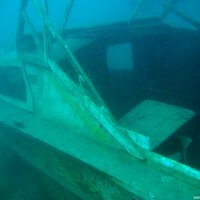 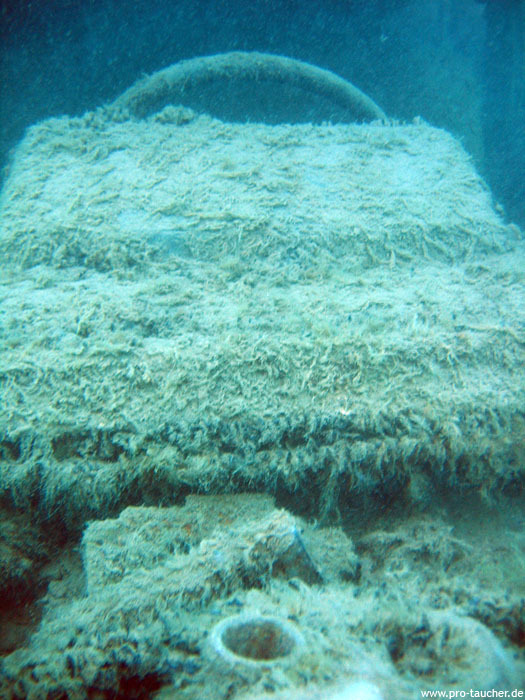 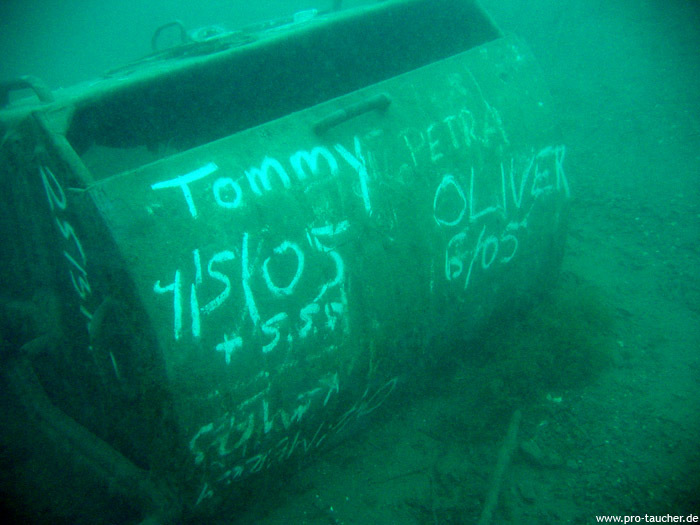 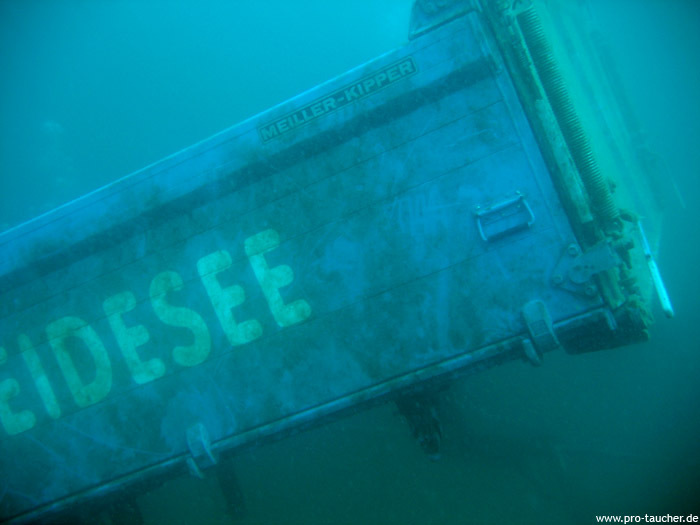 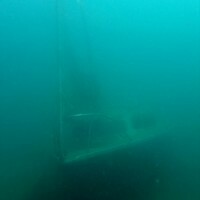 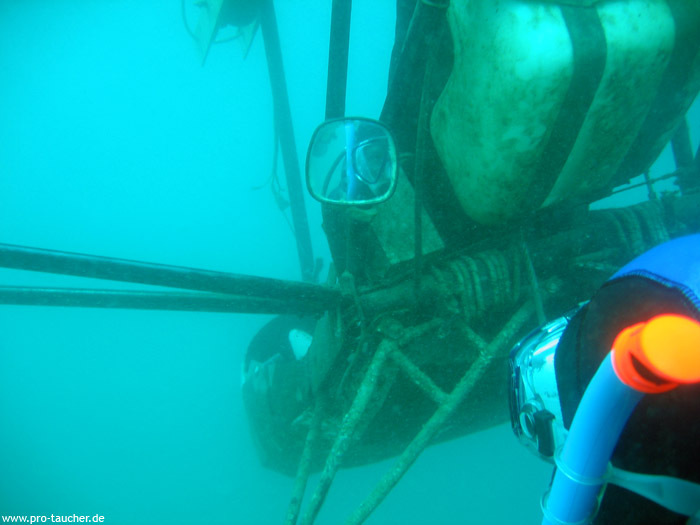 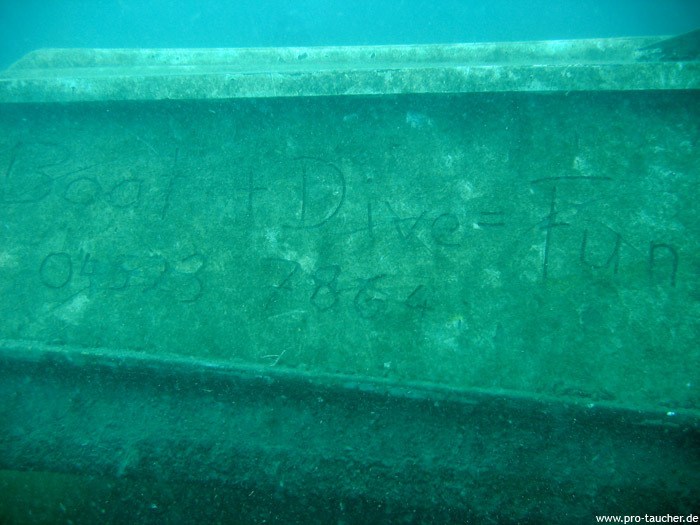 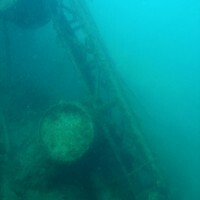 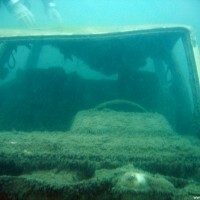 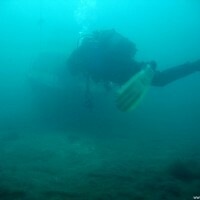 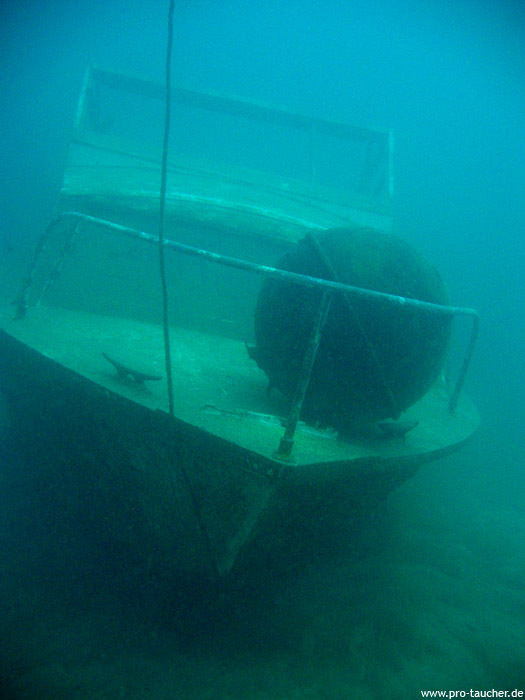 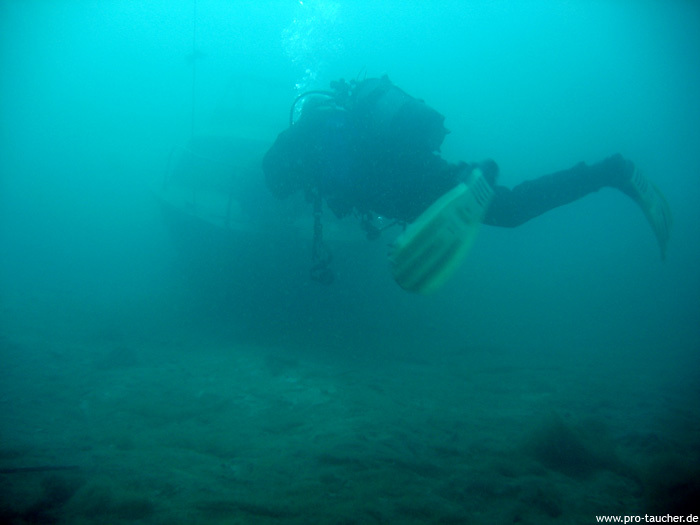 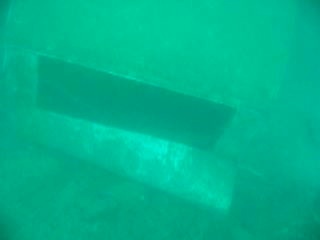 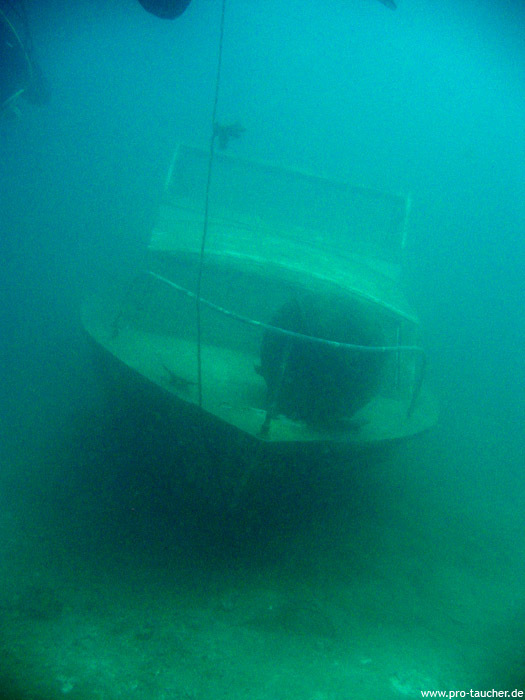 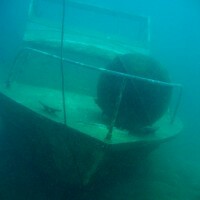 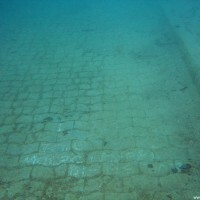 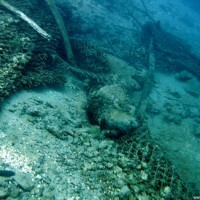 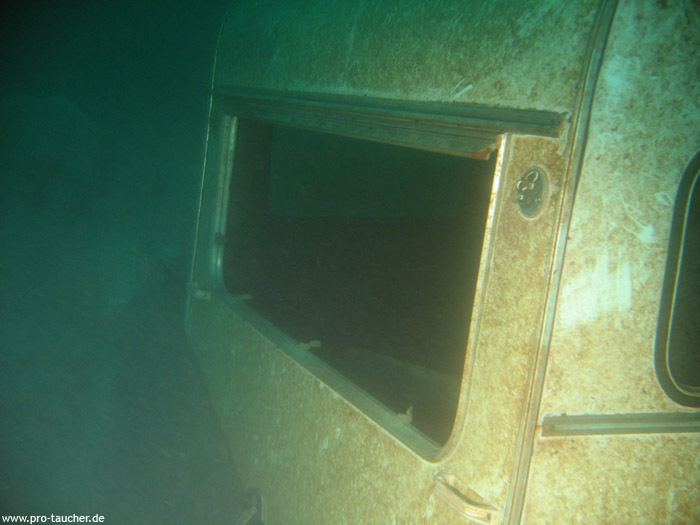 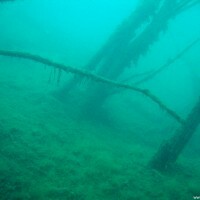 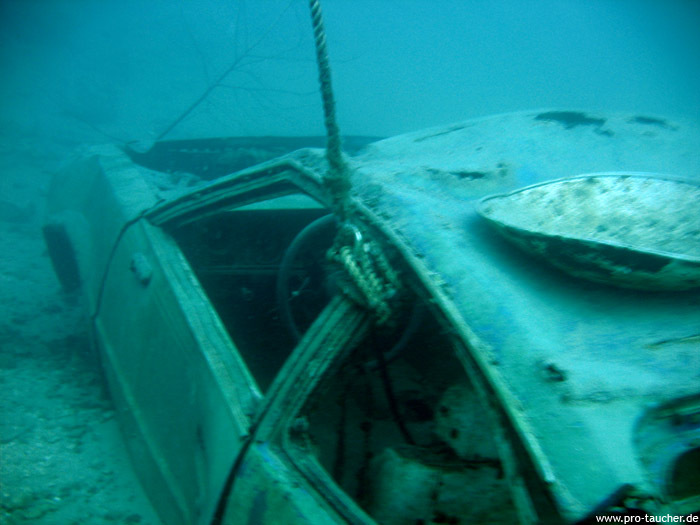 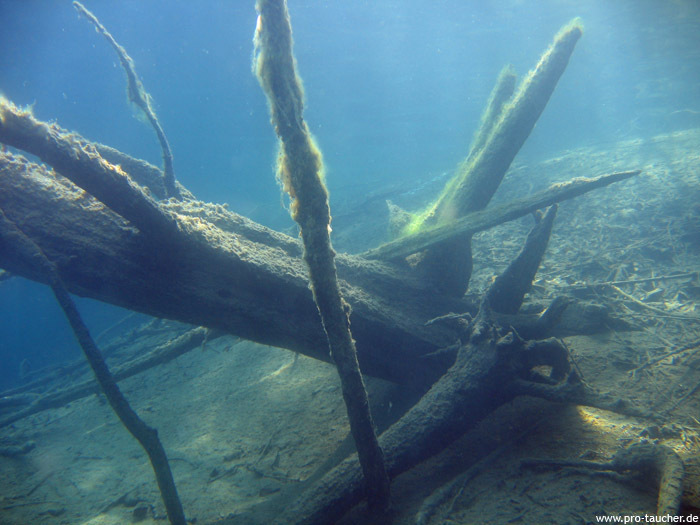 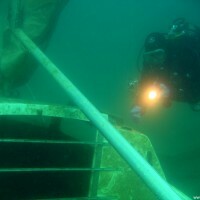 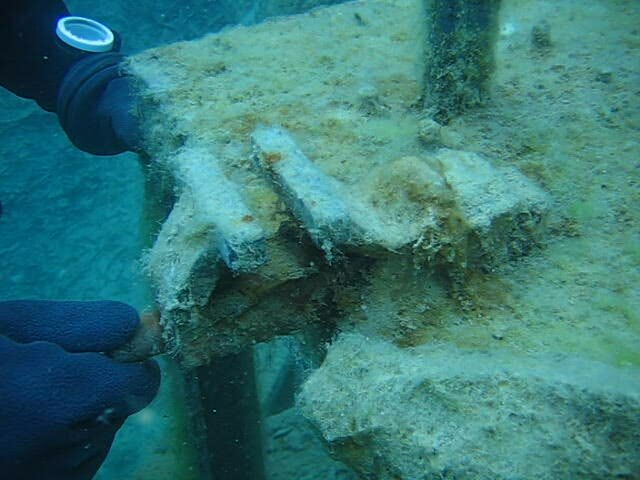 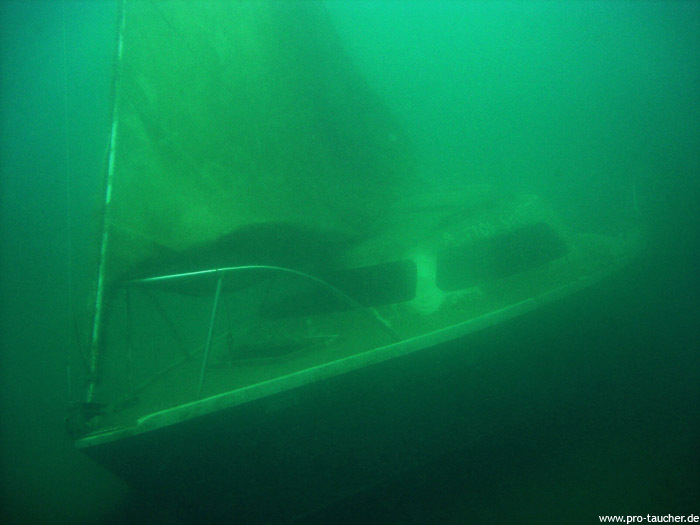 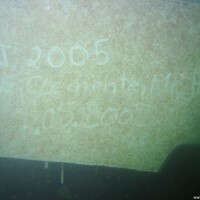 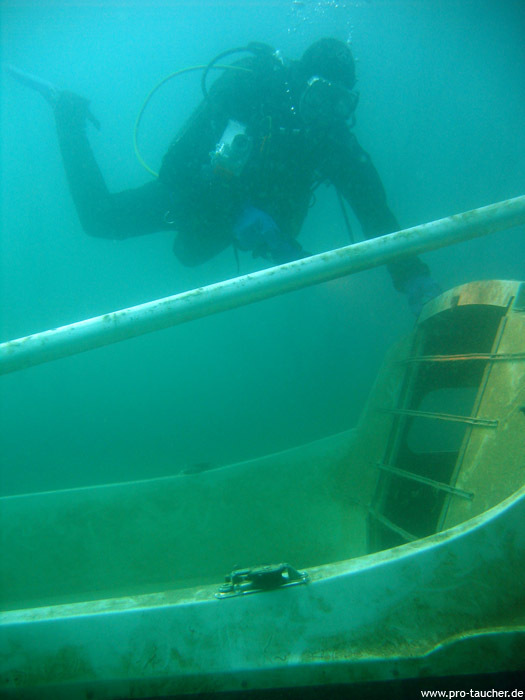 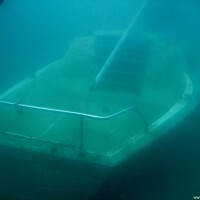 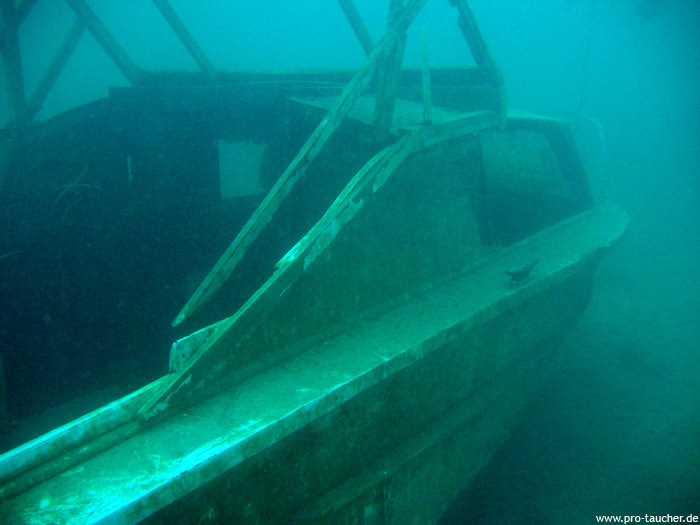 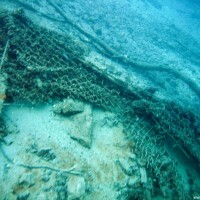 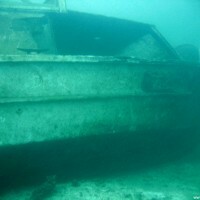 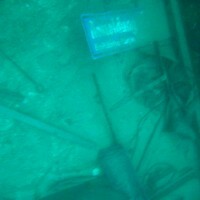 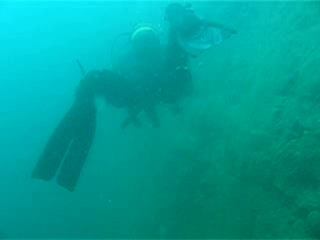 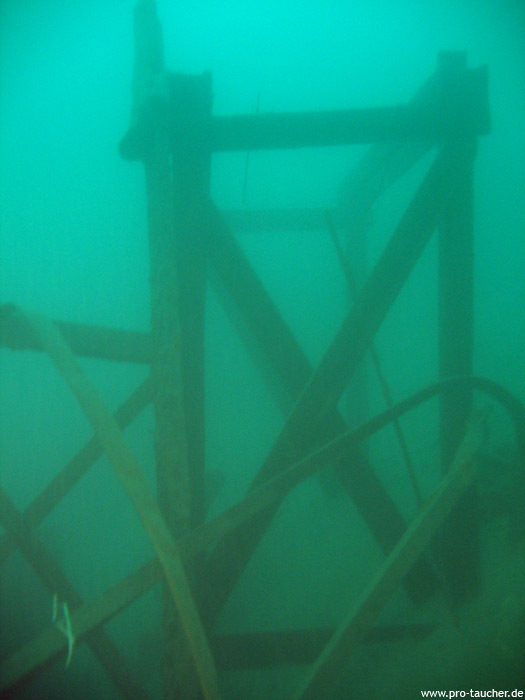 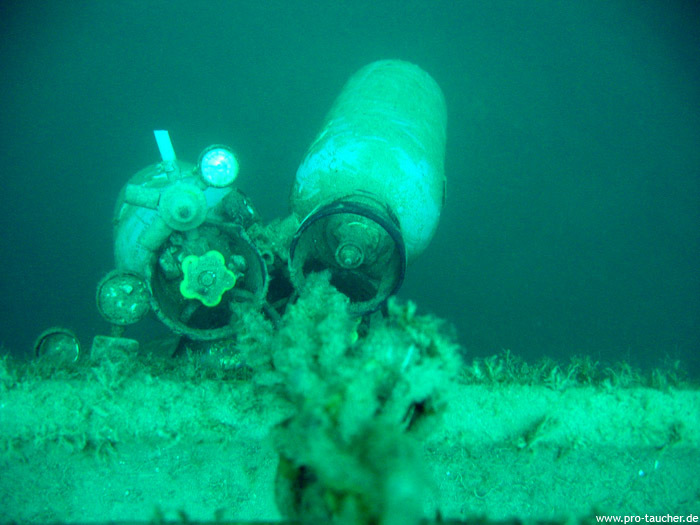 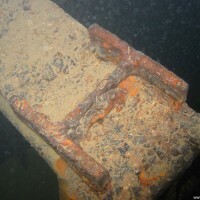 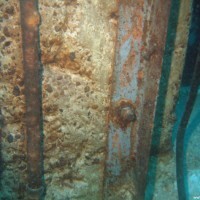 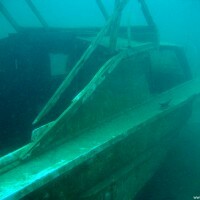 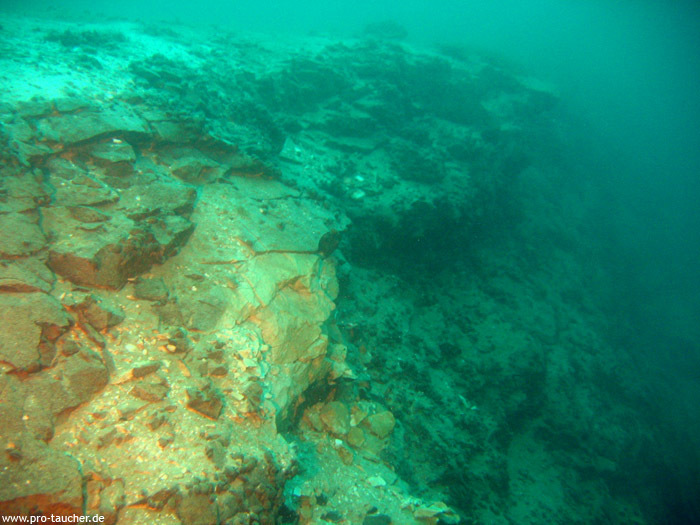 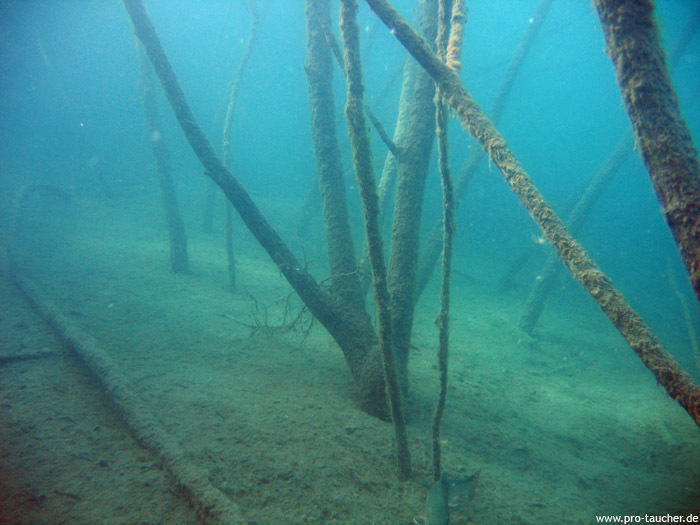 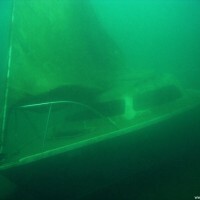 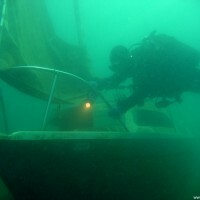 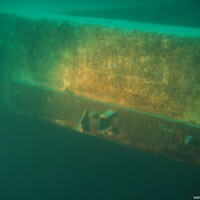 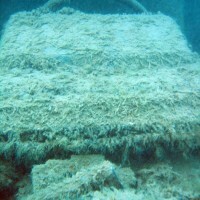 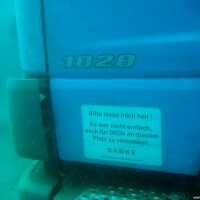 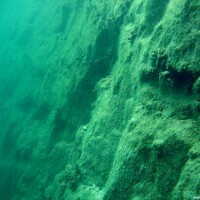 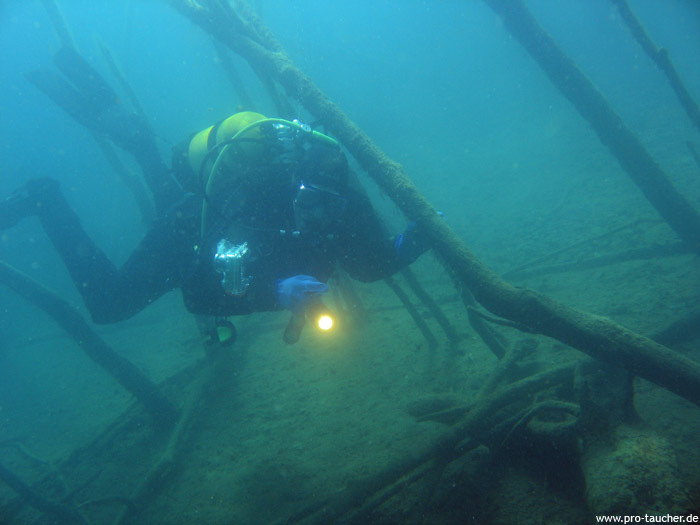 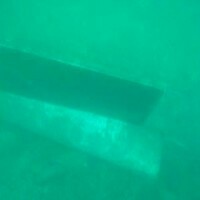 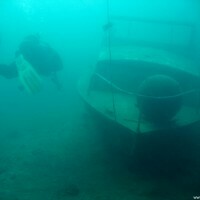 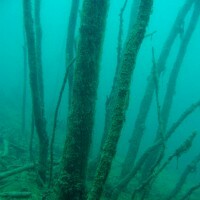 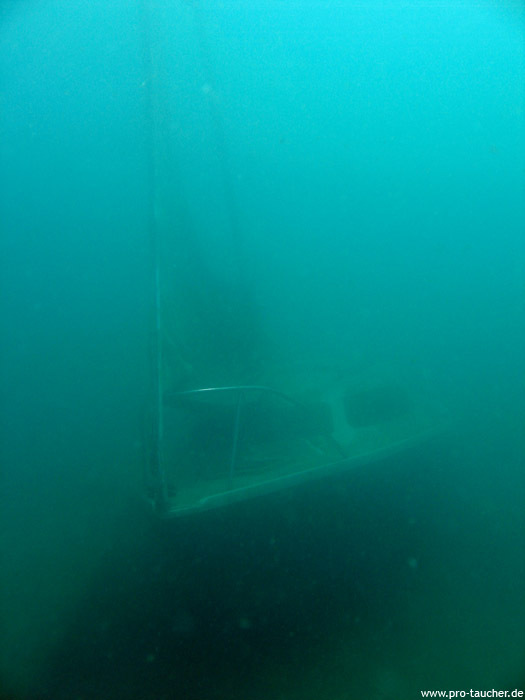 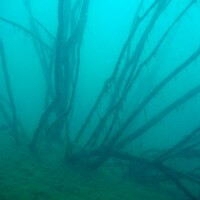 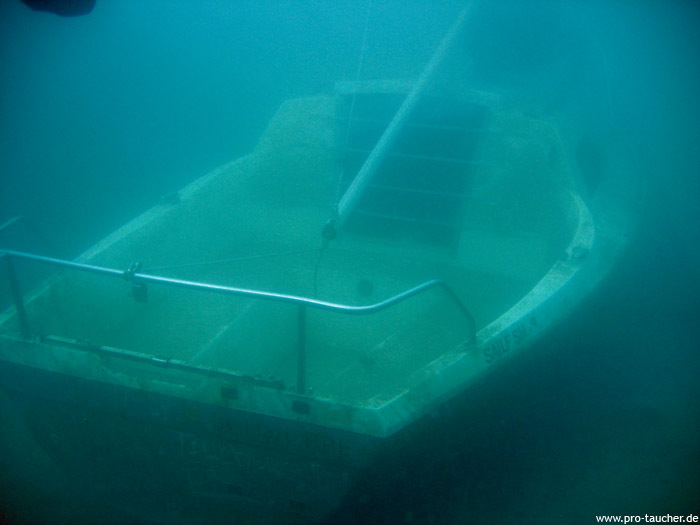 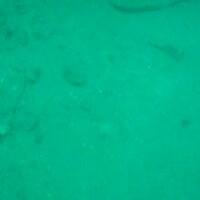 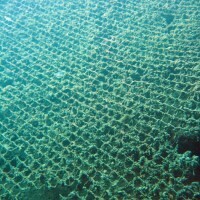 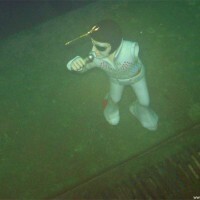 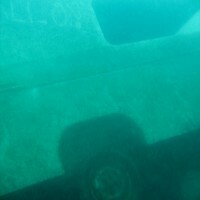 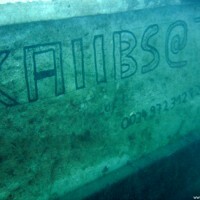 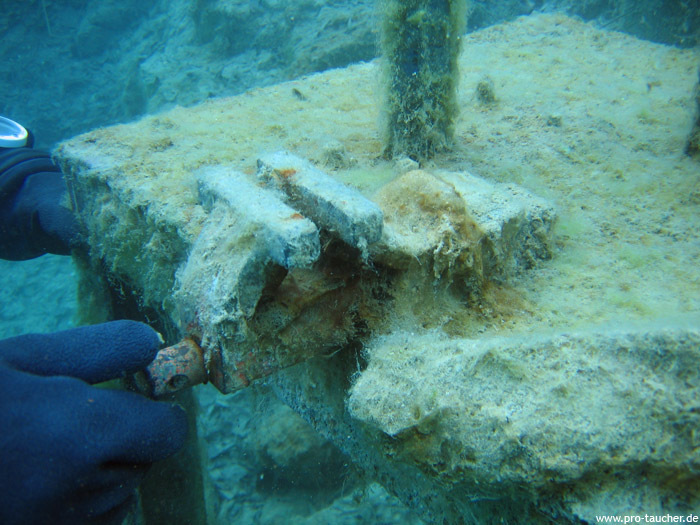 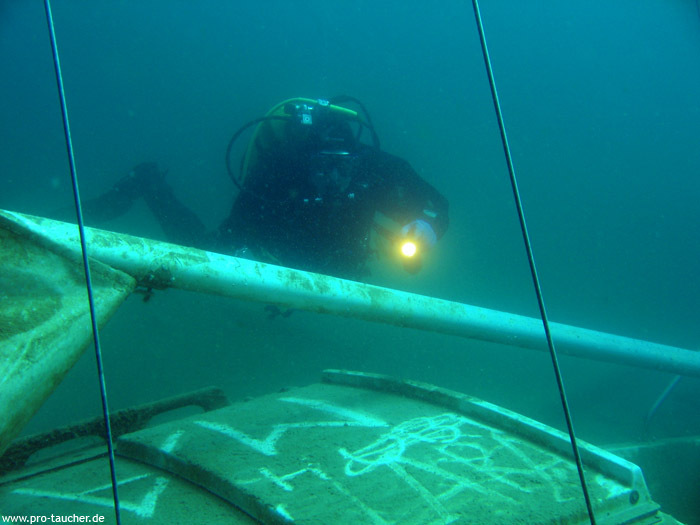 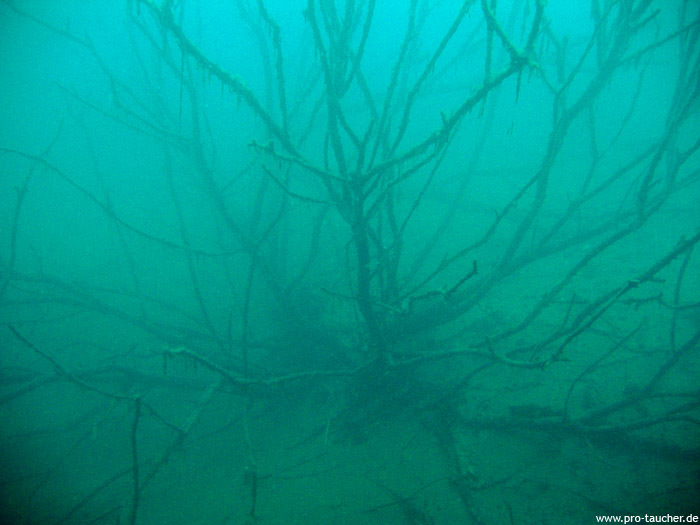 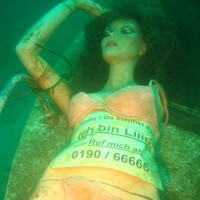 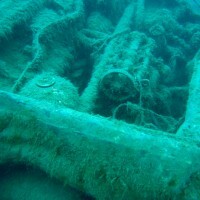 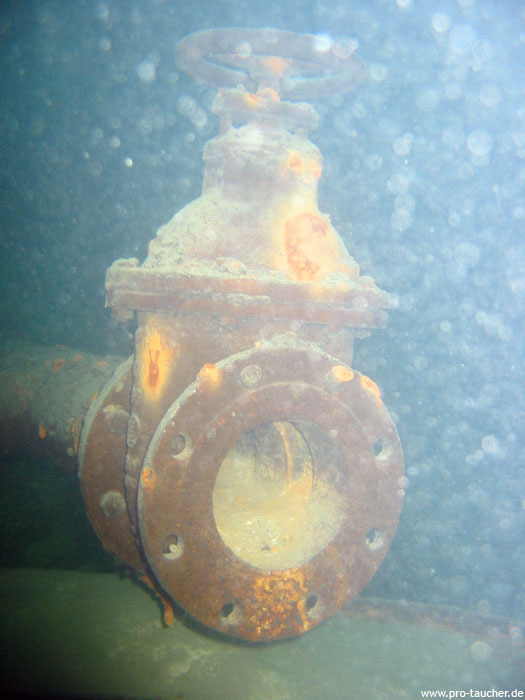 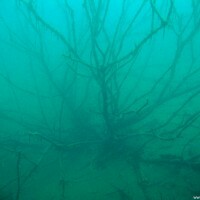 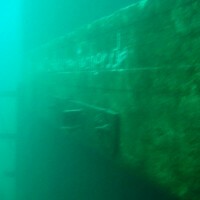 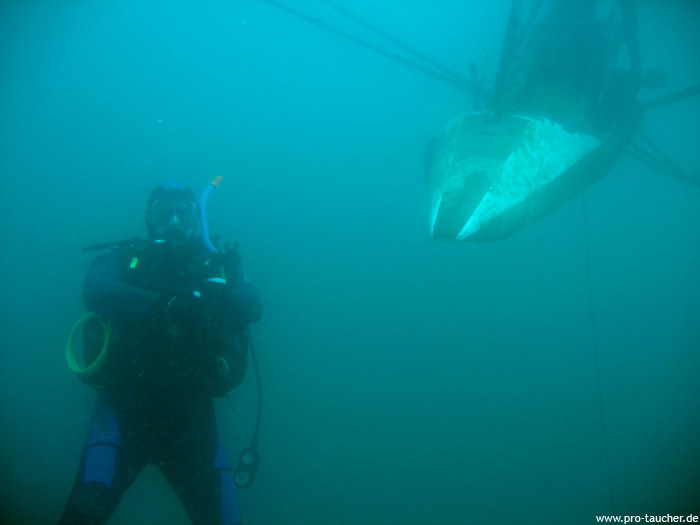 Here is, 15 meters deep, an 8-meter-long boat wreck. 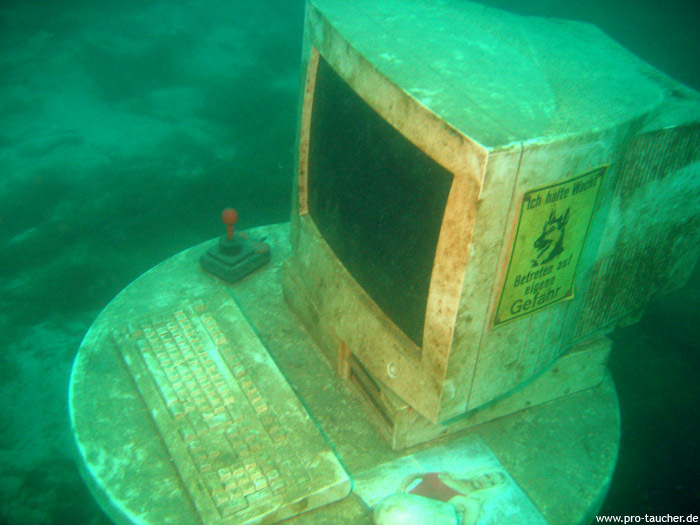 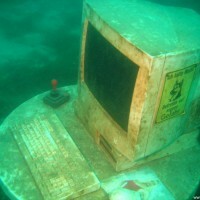 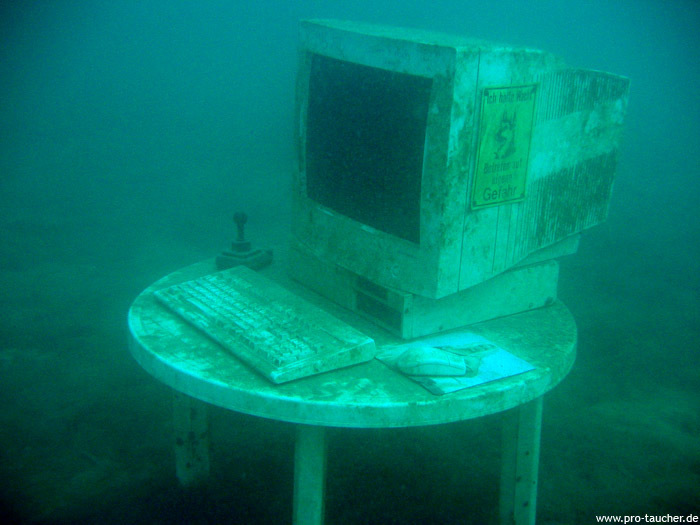 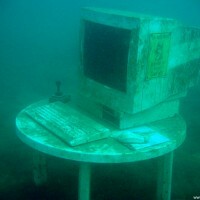 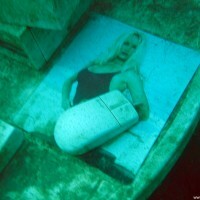 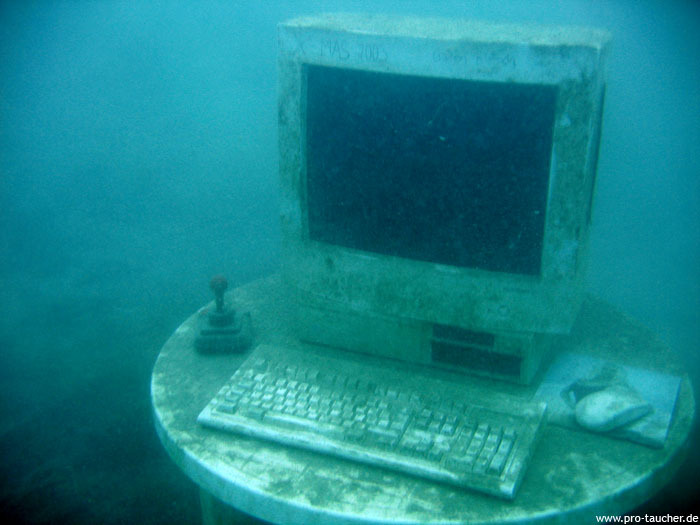 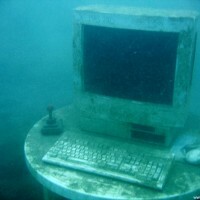 Right next to it in the direction of the shore is a computer. 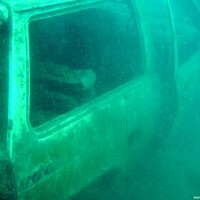 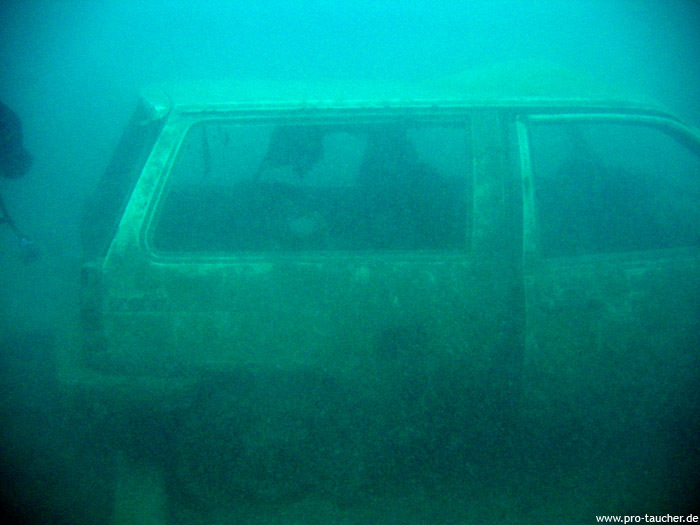 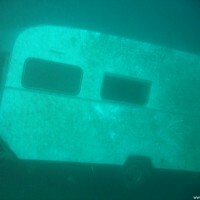 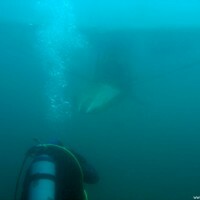 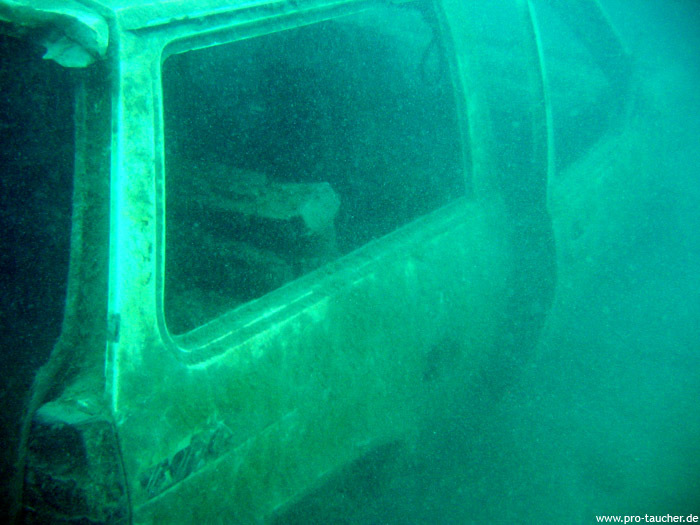 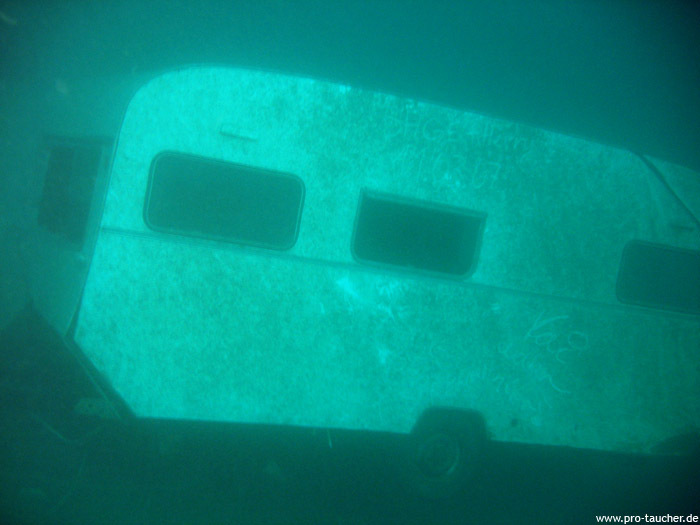 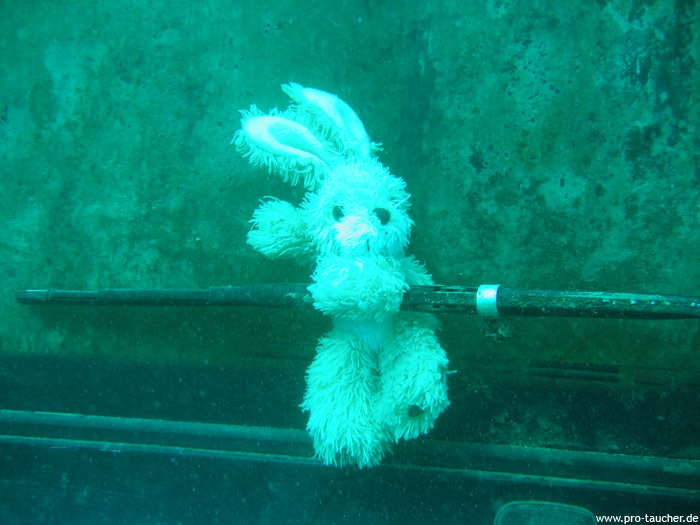 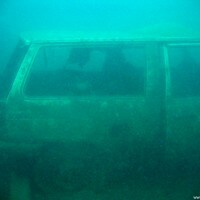 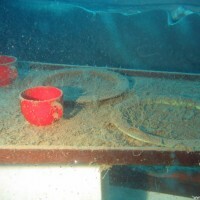 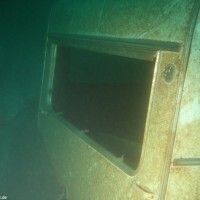 In addition, you can enjoy here two caravans in 25 meters and 37 meters depth. 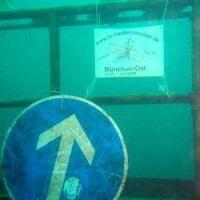 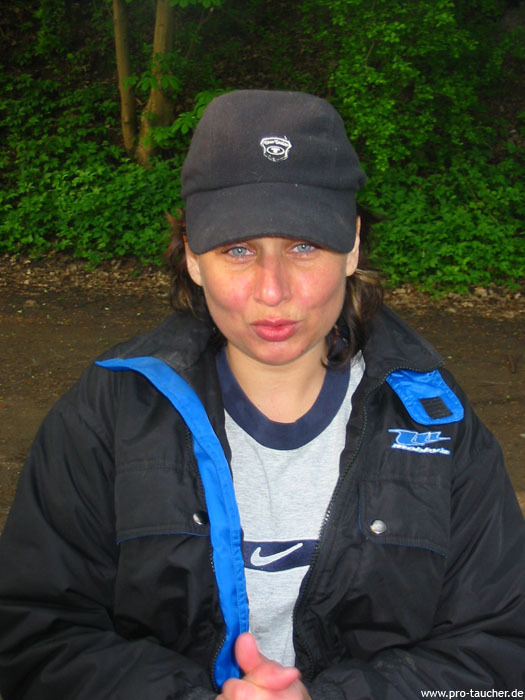 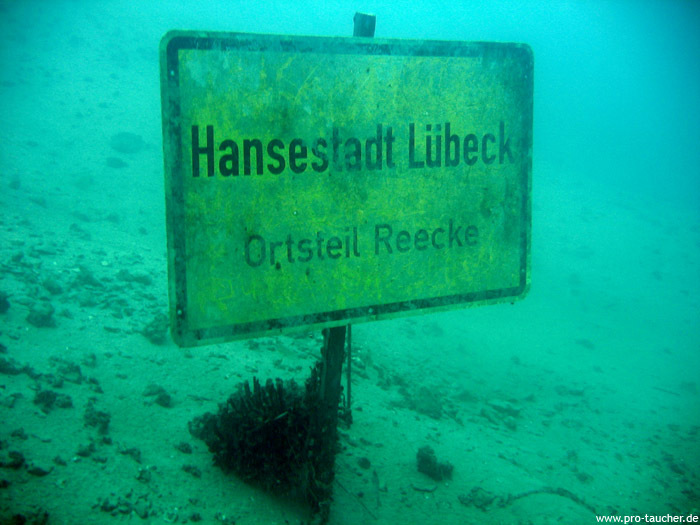 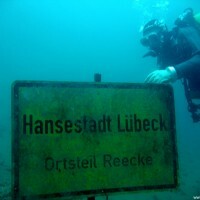 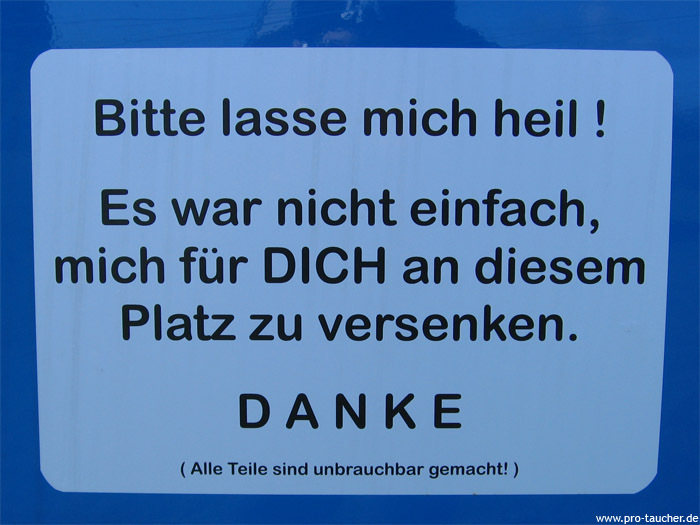 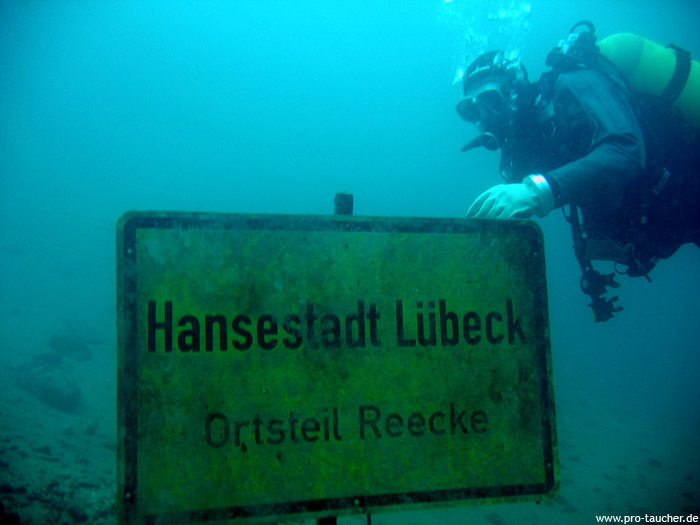 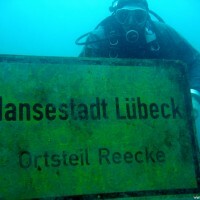 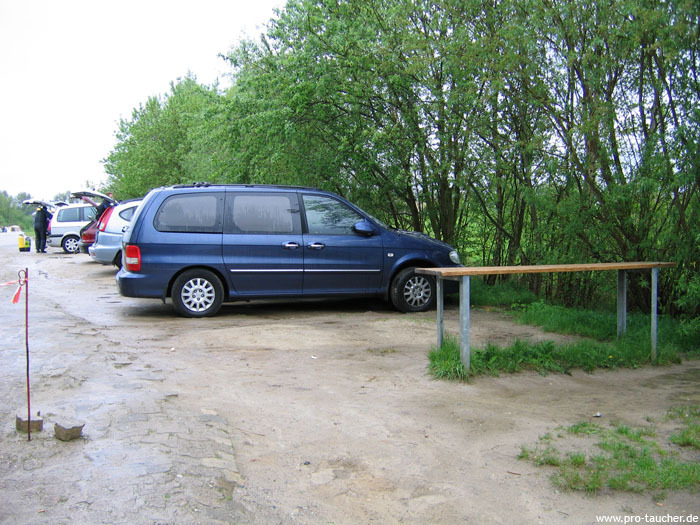 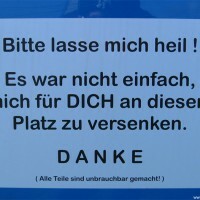 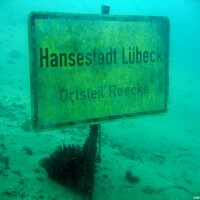 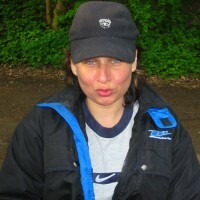 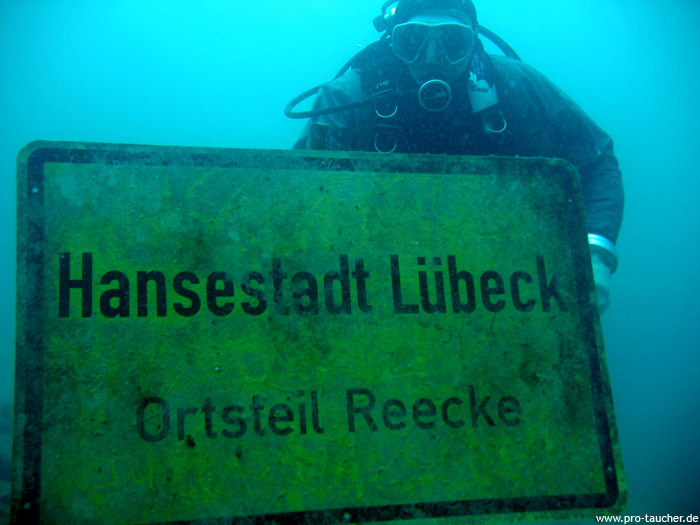 In the direction of entry 3, about 15 minutes away, is a sign from Lübeck and the blue Mitsubishi car, which can be found at about 20 meters. 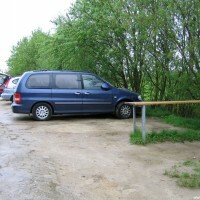 Entry 5: Here, too, a short walk of 3-5 minutes is needed. 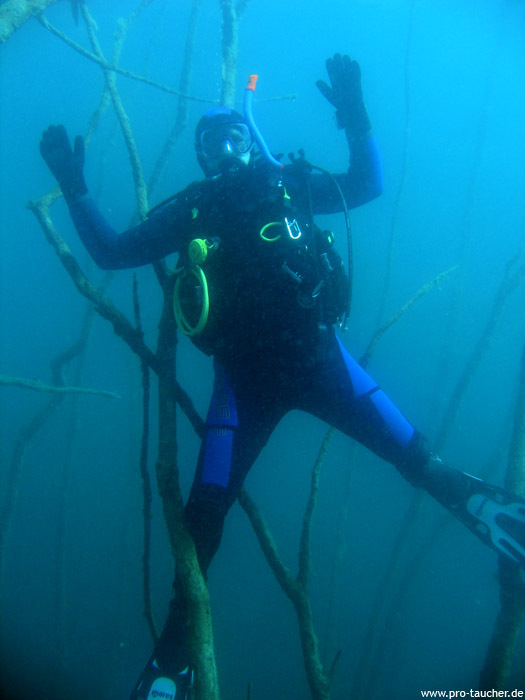 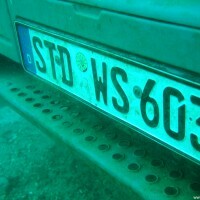 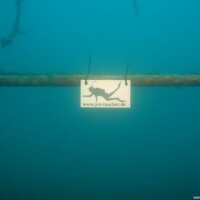 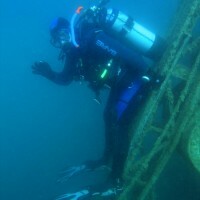 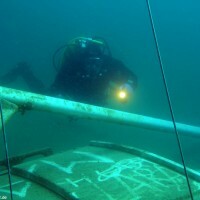 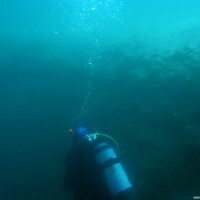 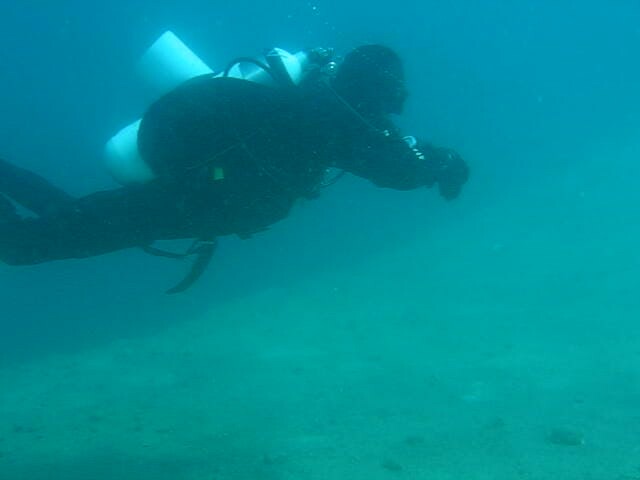 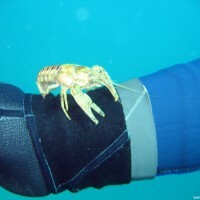 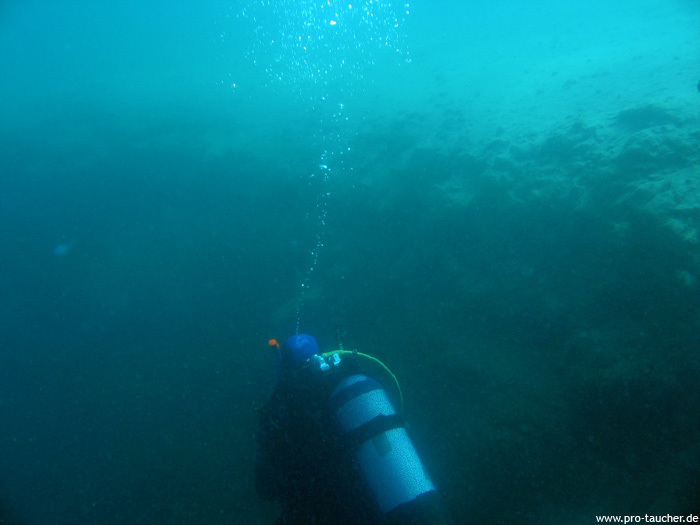 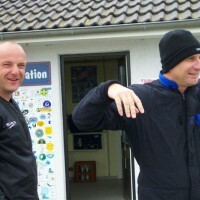 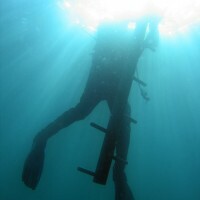 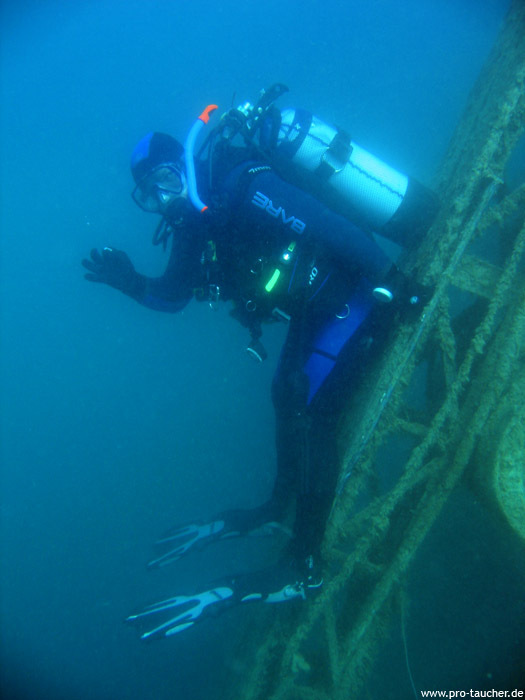 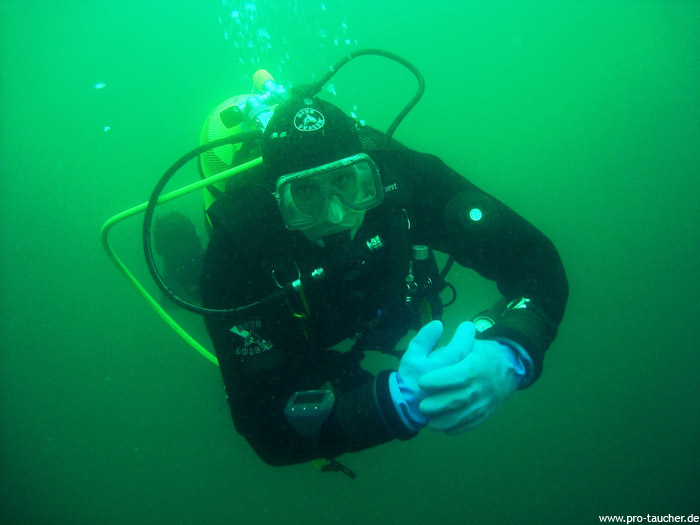 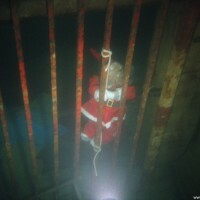 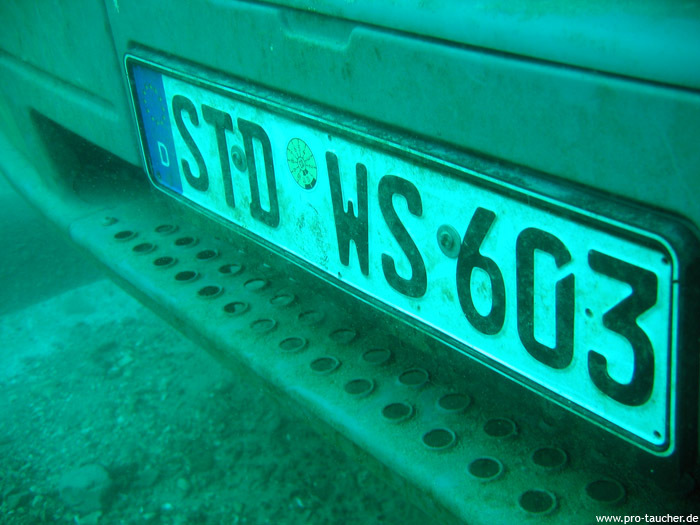 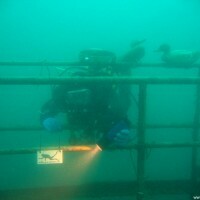 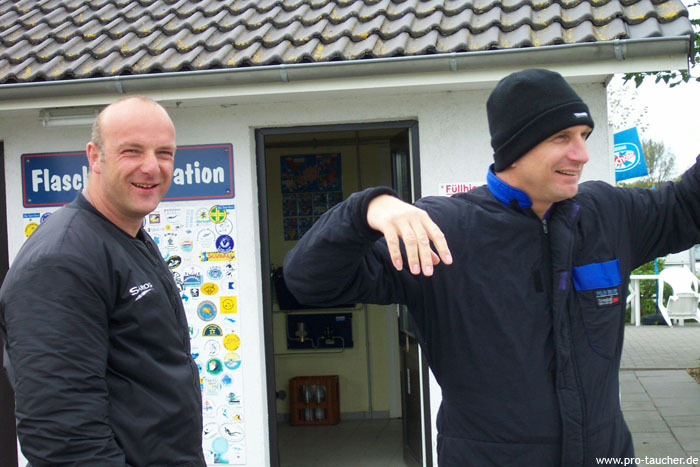 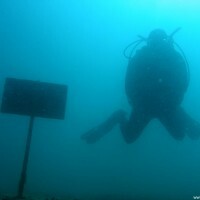 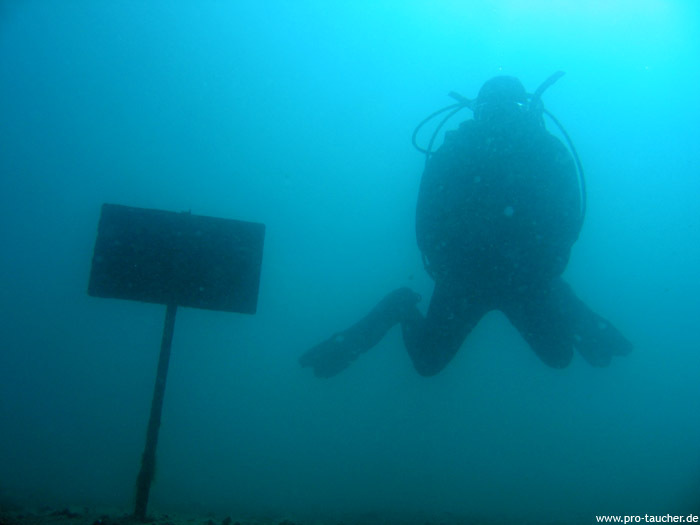 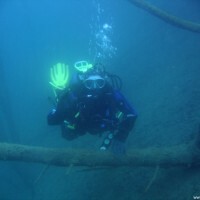 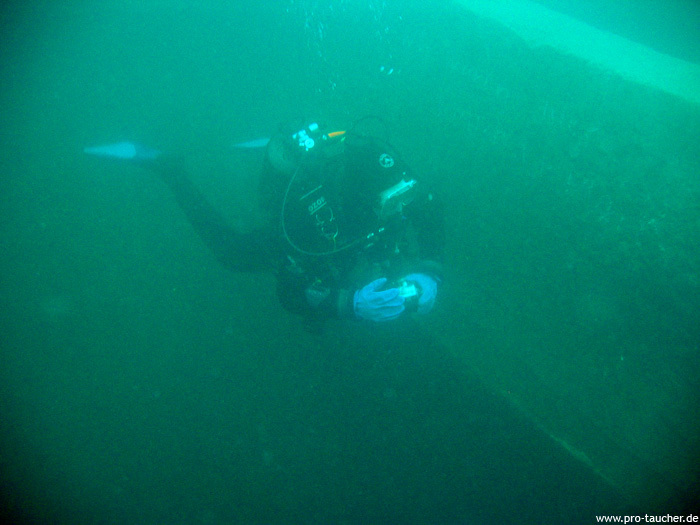 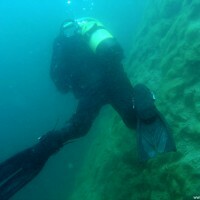 At this dive site it is best to dive to the left hand along the drop off. 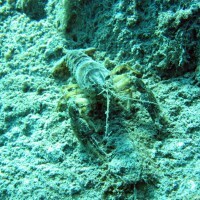 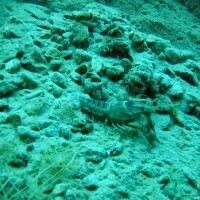 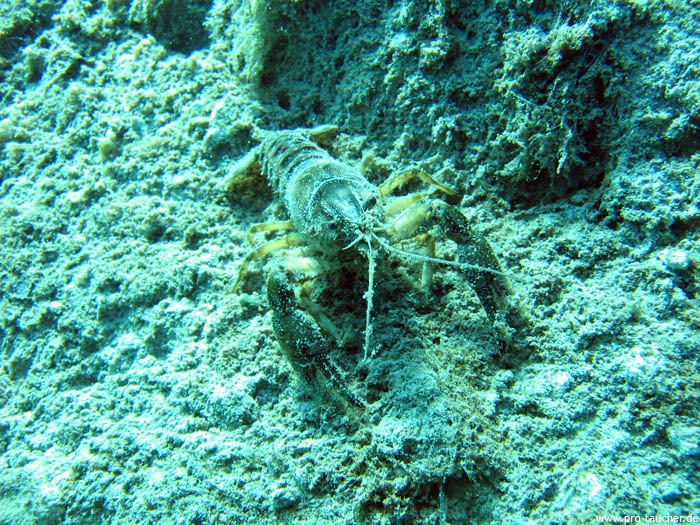 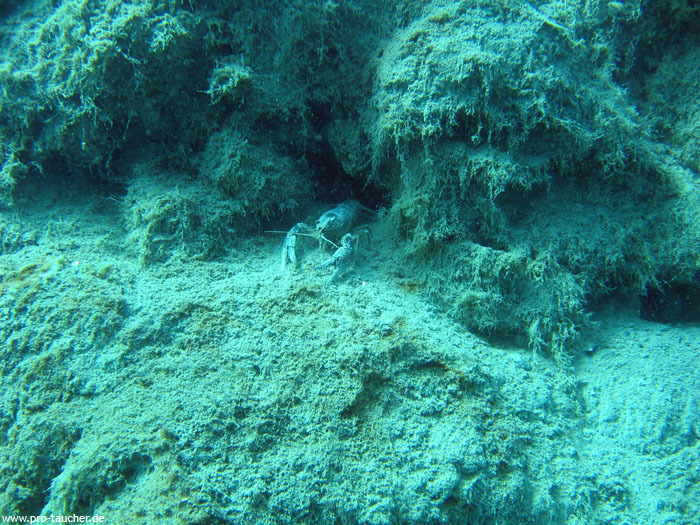 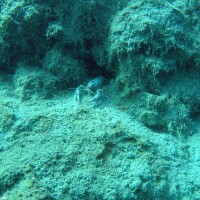 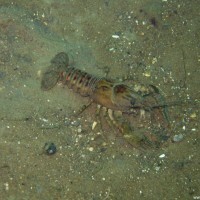 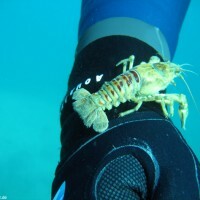 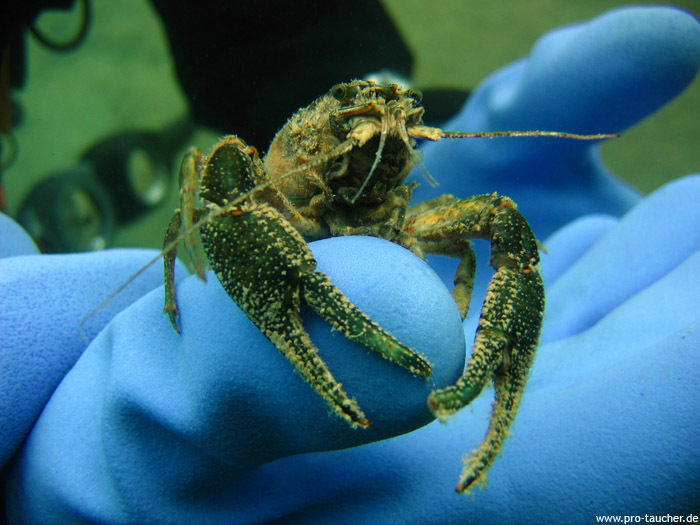 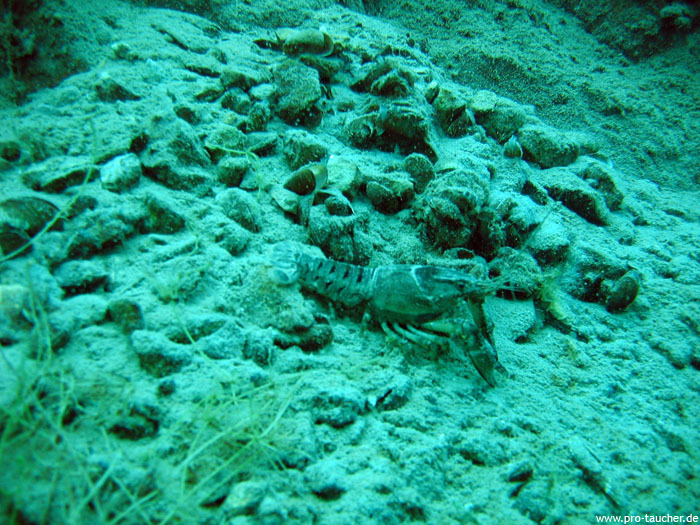 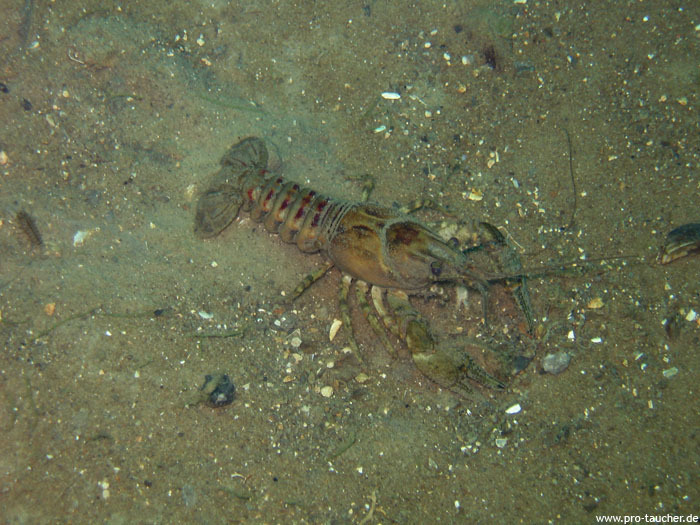 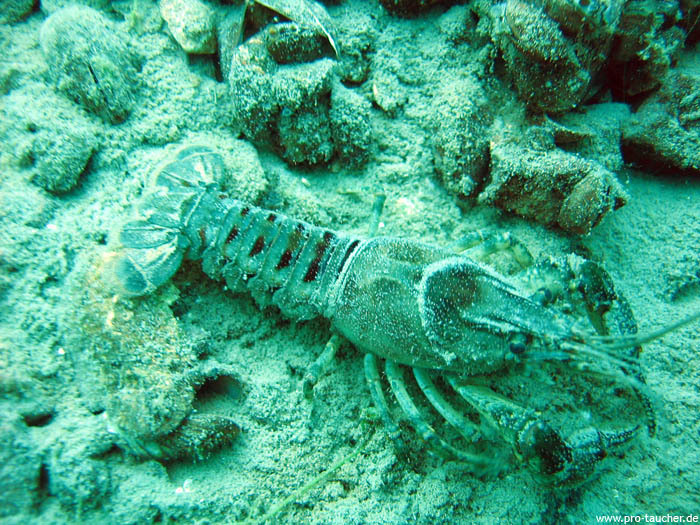 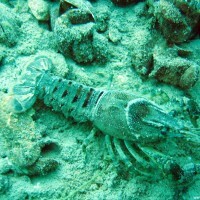 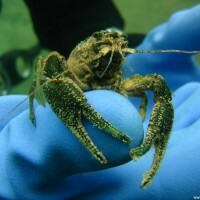 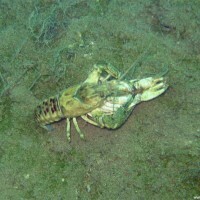 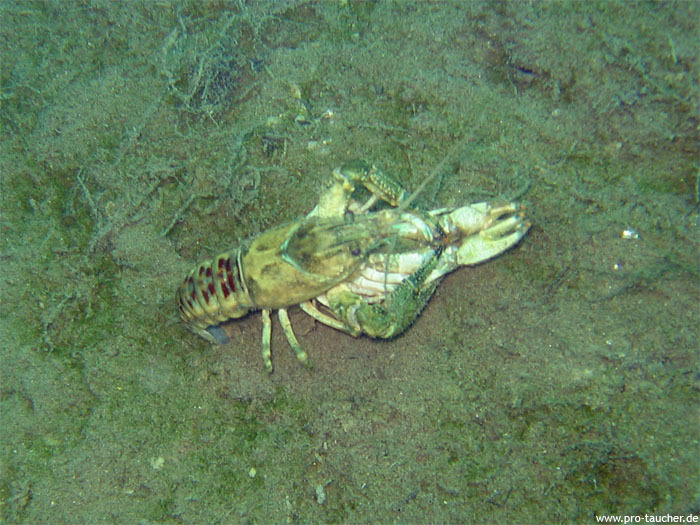 There are lots of animals here, especially crayfish. 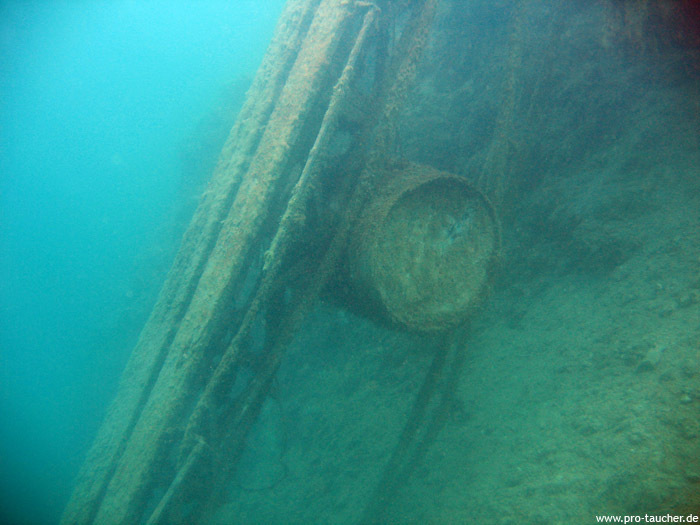 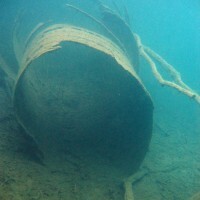 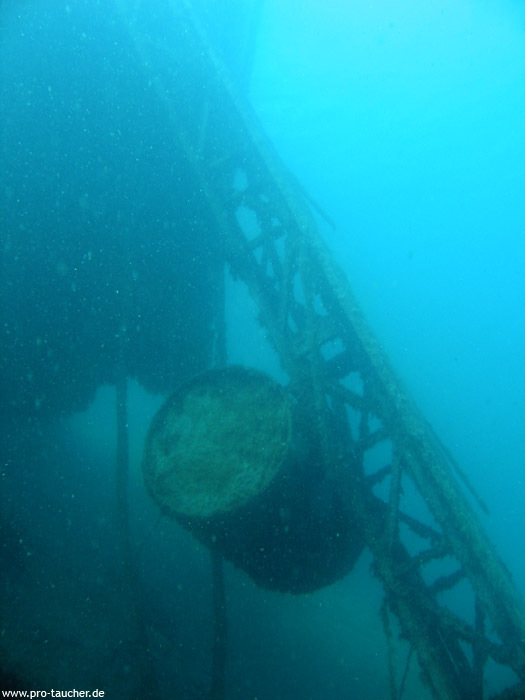 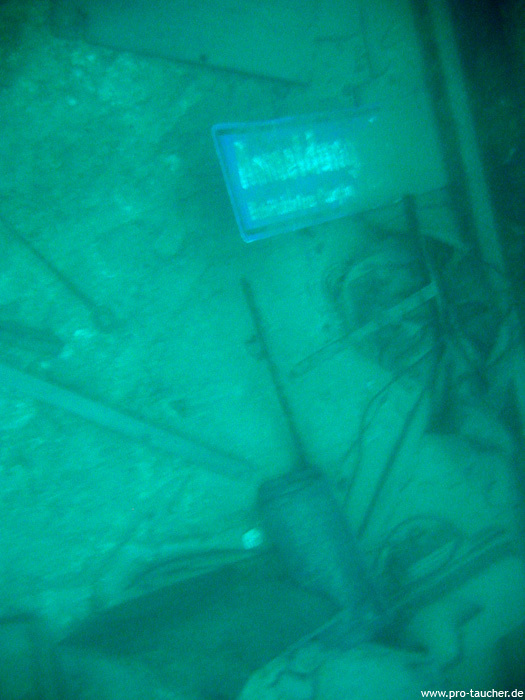 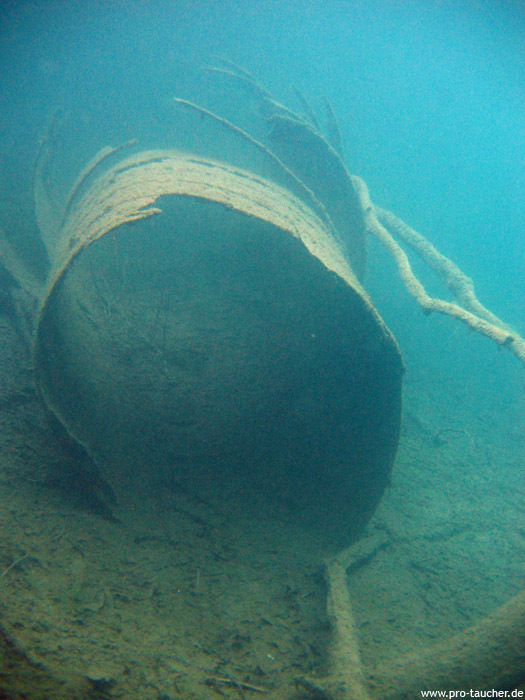 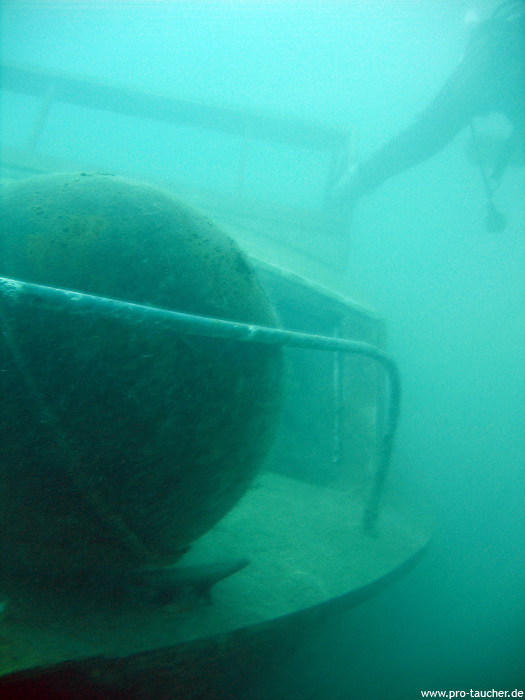 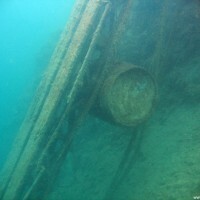 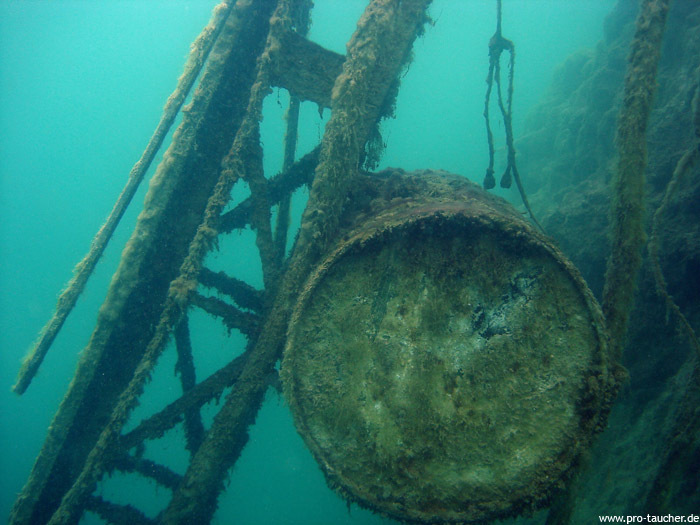 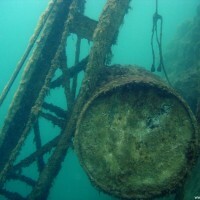 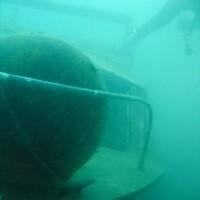 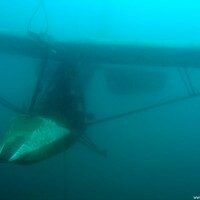 Also here is a boat wreck and a cable drum. 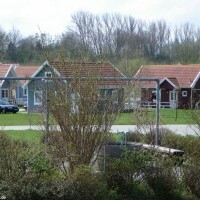 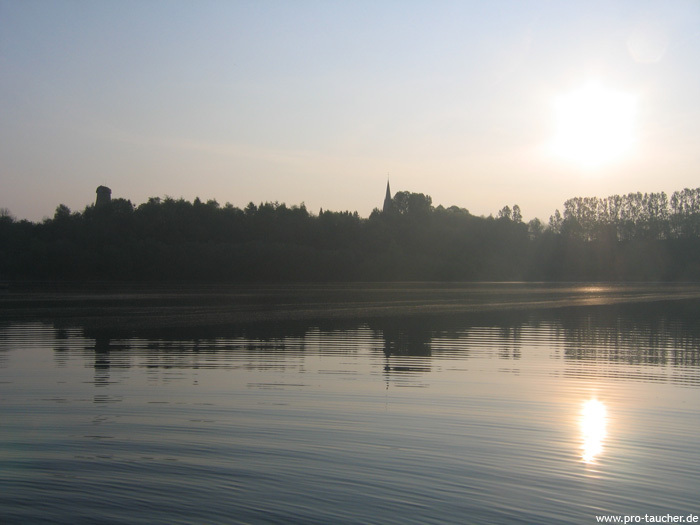 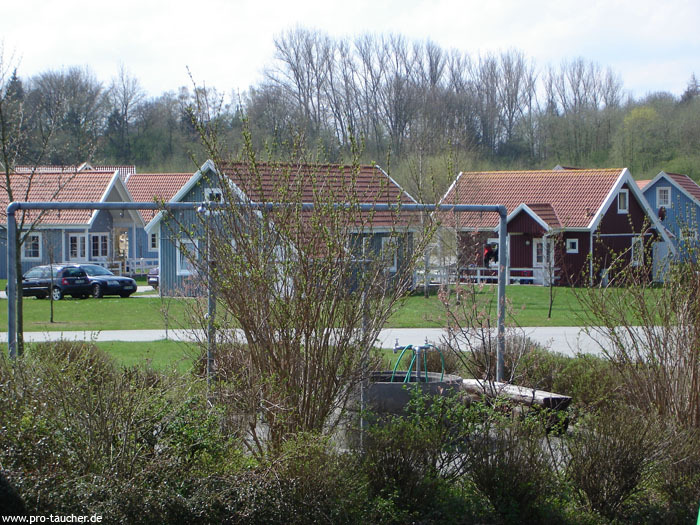 Accommodation and dining/eating: Holiday apartments and houses can be rented directly on the lake. 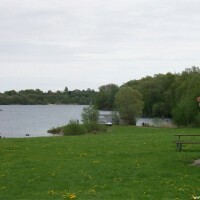 There is also a campsite right on the shore. 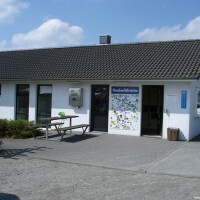 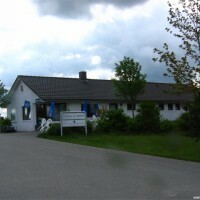 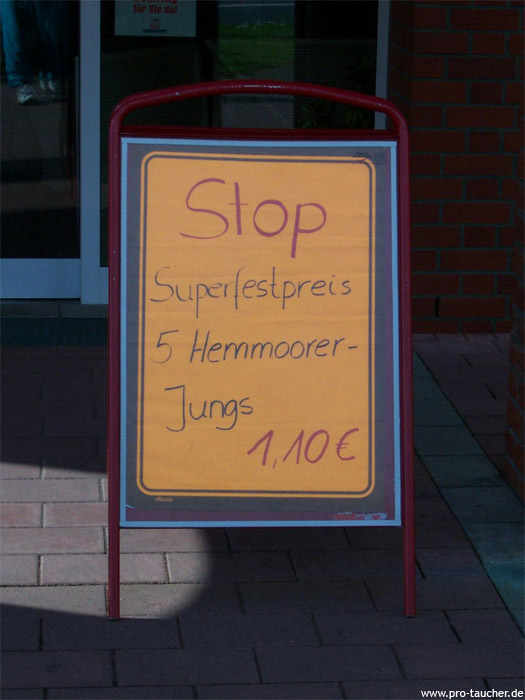 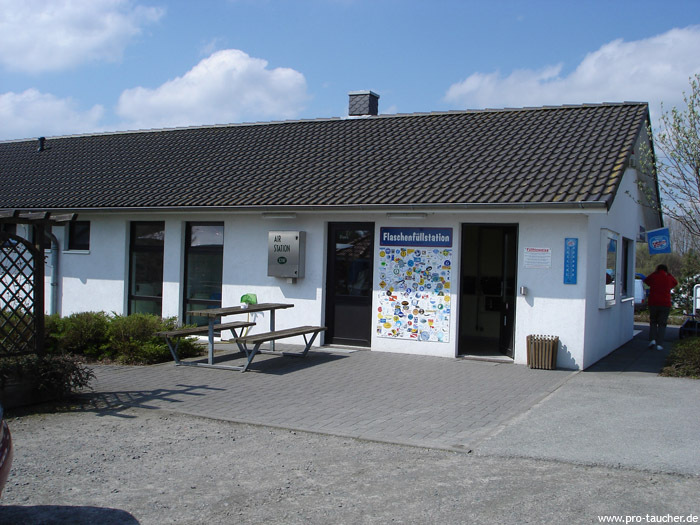 For the physical well-being you find various restaurants, pubs and takeaways in Hemmoor. 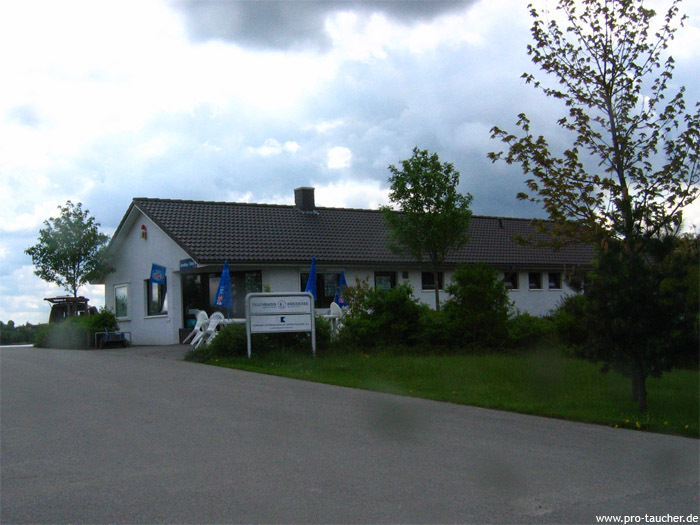 Directly at the dive center you can eat sausages and fries.